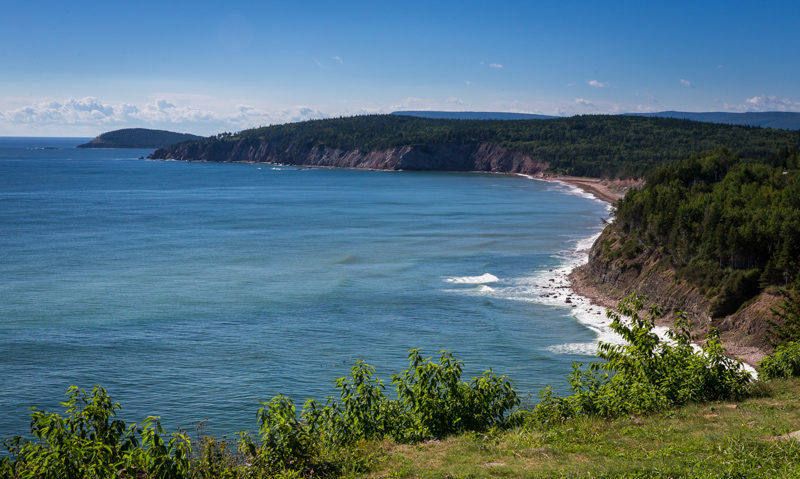 After enjoying Cape Breton Highlands National Park for a week we headed over to North Sydney, Cape Breton. 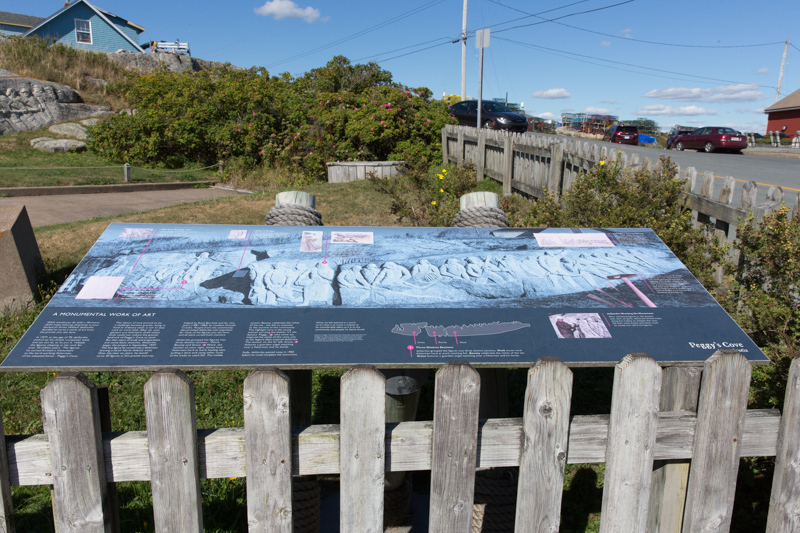 We left Cheticamp early in the morning and stopped by the Alexander Bell Museum in Baddock. It is an interesting museum and we enjoyed learning more about the man behind the phone invention and his family. It was a very dreary, cold and wet day so we didn’t spend much time touring Baddock. Instead, after visiting the museum we continued onto the KOA North Sydney campground. It was still early in the day after checking-in at the campground so we decided to head over to the Miners’ Museum in Glace Bay. We figured a tour underground would be perfect for a cold and rainy day. 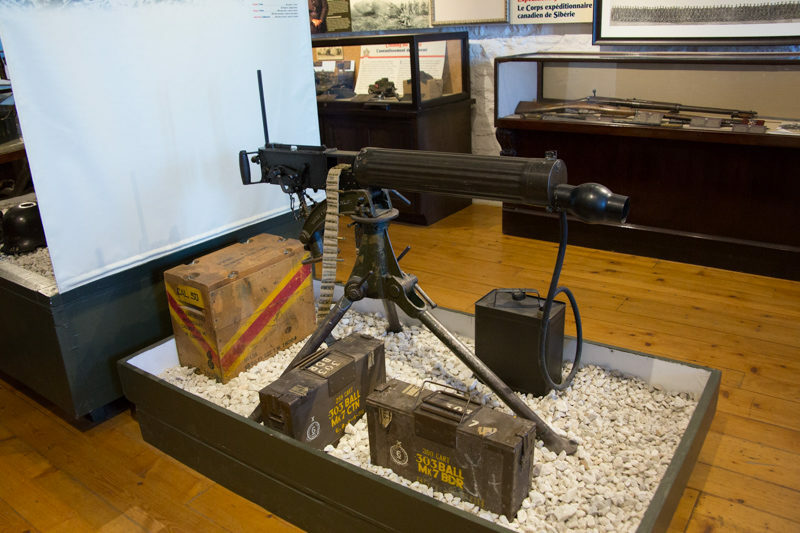 The facility has a large museum providing lots of mining history, a mining village, garden and an underground mine. The tour of the underground mine is given by a retired miner. We found his stories to be absolutely fascinating. If you ever get a chance to visit this Museum we would highly recommend it. 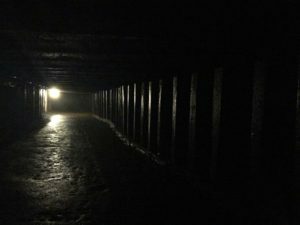 I didn’t take my camera into the mine, but Charlie captured a few shots with his cell phone. 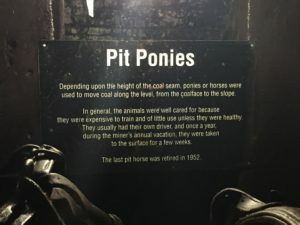 They actually kept ponies down in the mines. The next day was absolutely beautiful. 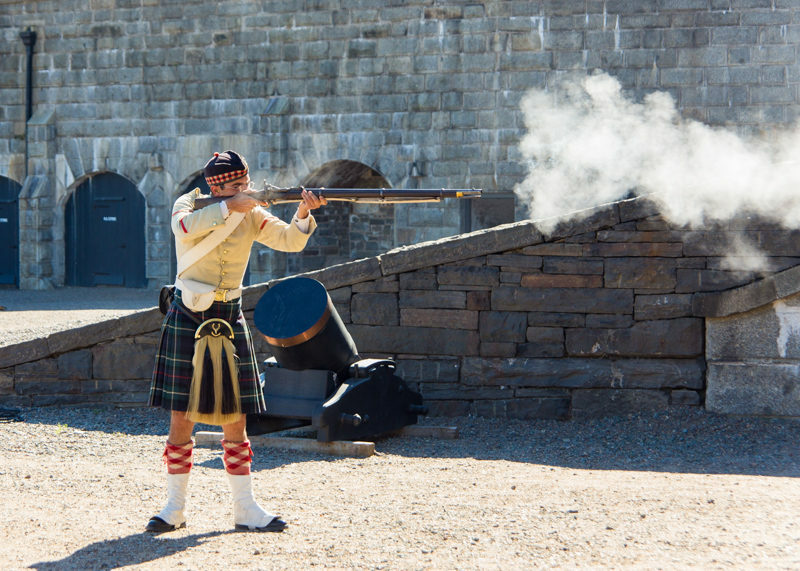 It was sunny and warm, a perfect day to visit the Fortress of Louisbourg. 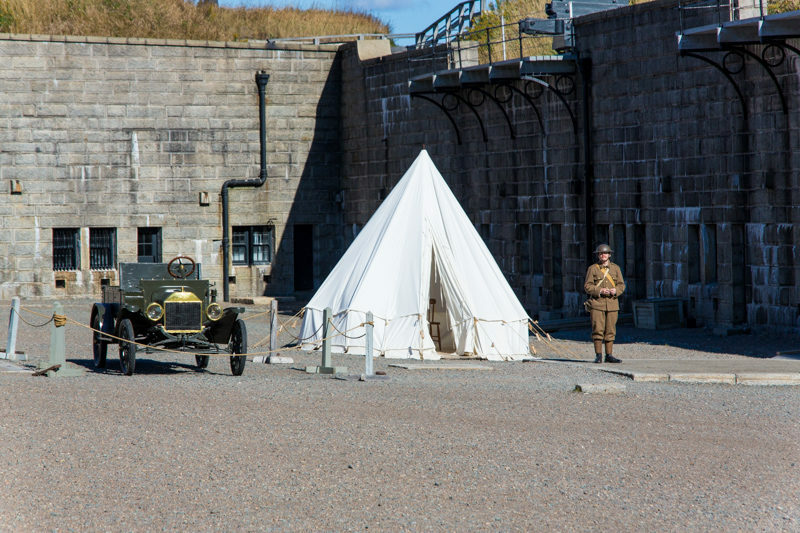 This is another National Historic Site in Canada which we thoroughly enjoyed. Below is a good description of the Fortress from Wikipedia. 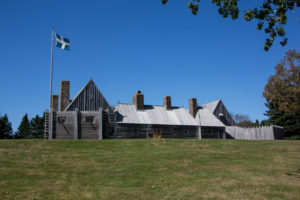 The Fortress of Louisbourg is a National Historic Site of Canada and the location of a one-quarter partial reconstruction of an 18th-century French fortress at Louisbourg on Cape Breton Island, Nova Scotia. Its two sieges, especially that of 1758, were turning points in the Anglo-French struggle for what today is Canada. 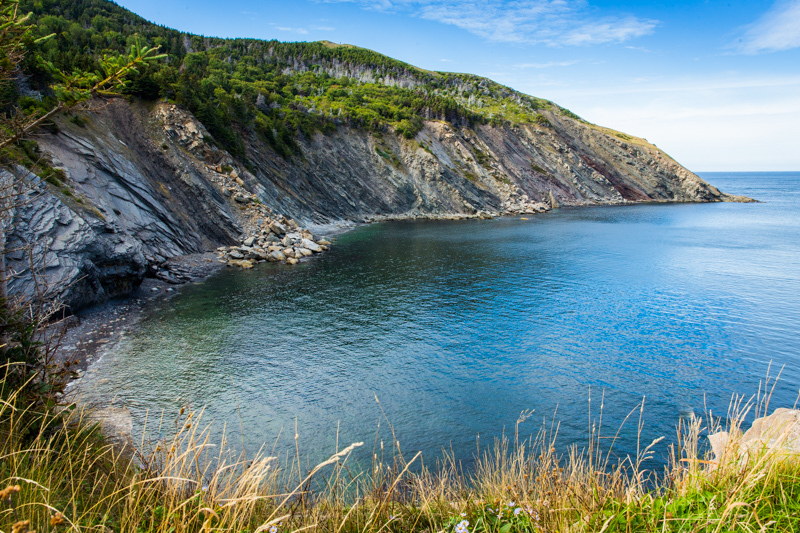 The original settlement was made in 1713, and initially called Havre à l’Anglois. Subsequently, the fishing port grew to become a major commercial port and a strongly defended fortress. The fortifications eventually surrounded the town. The walls were constructed mainly between 1720 and 1740. 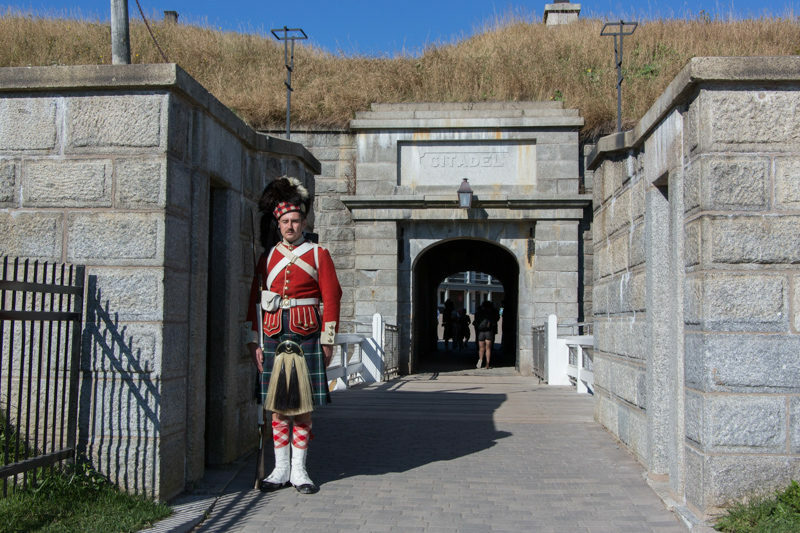 By the mid-1740s Louisbourg was one of the most extensive (and expensive) European fortifications constructed in North America. 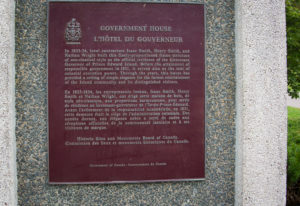 It was supported by two smaller garrisons on Île Royale located at present-day St. Peter’s and Englishtown. 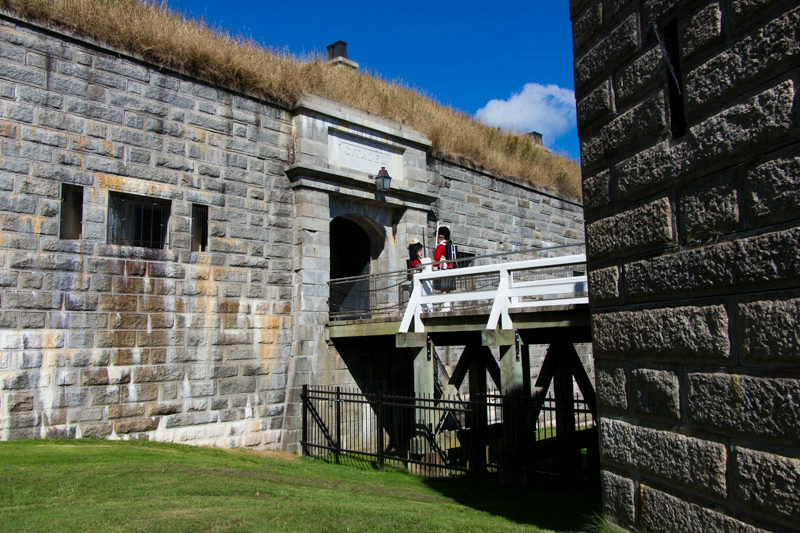 The Fortress of Louisbourg suffered key weaknesses, since it was erected on low-lying ground commanded by nearby hills and its design was directed mainly toward sea-based assaults, leaving the land-facing defences relatively weak. A third weakness was that it was a long way from France or Quebec, from which reinforcements might be sent. 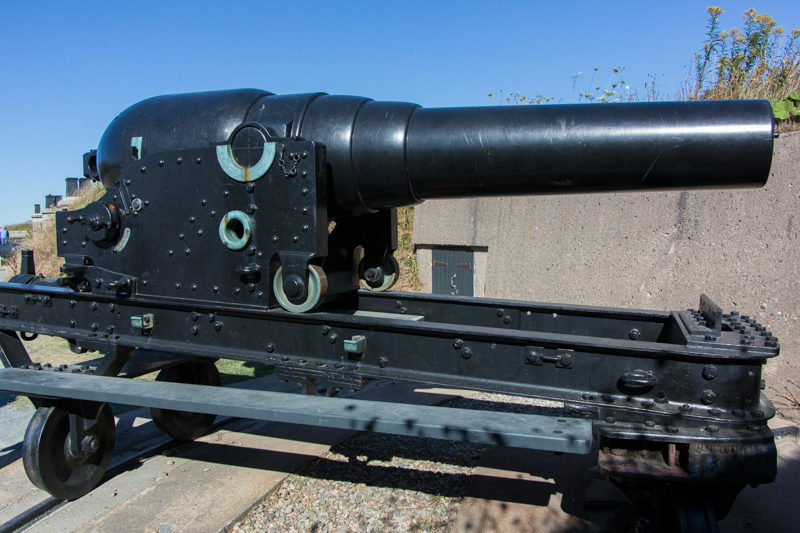 It was captured by British colonists in 1745, and was a major bargaining chip in the negotiations leading to the 1748 treaty ending the War of the Austrian Succession. It was returned to the French in exchange for border towns in what is today Belgium. 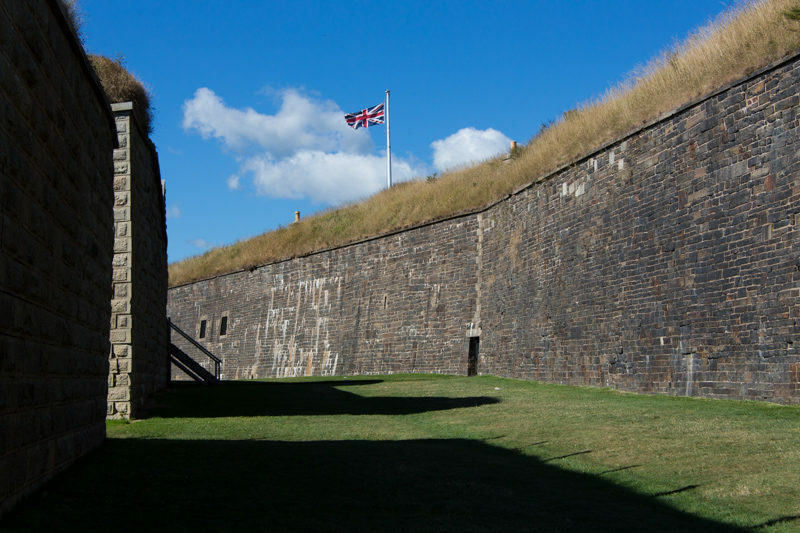 It was captured again in 1758 by British forces in the Seven Years’ War, after which its fortifications were systematically destroyed by British engineers. 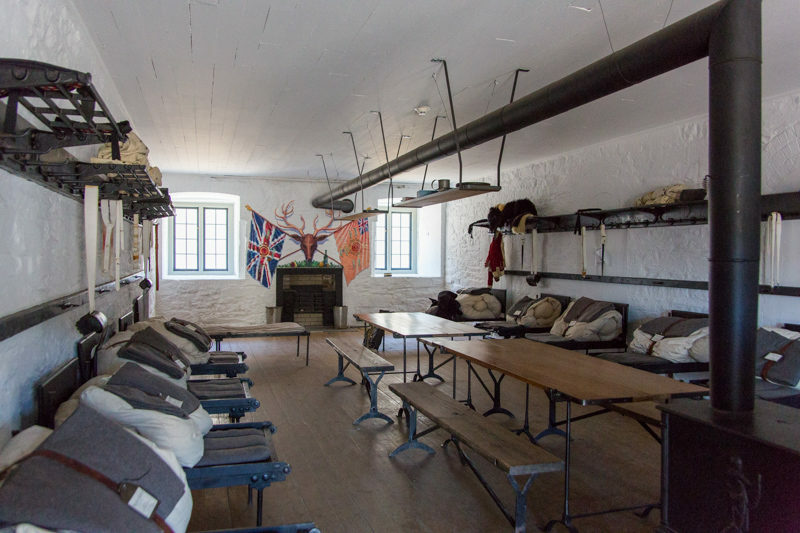 The British continued to have a garrison at Louisbourg until 1768. 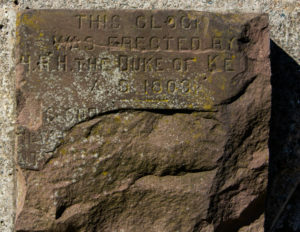 The fortress and town were partially reconstructed in the 1960s and 1970s, using some of the original stonework, which provided jobs for unemployed coal miners. The head stonemason for this project was Ron Bovaird. 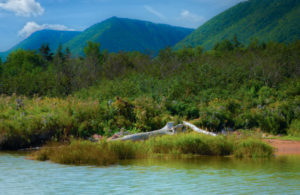 The site is operated by Parks Canada as a living history museum. 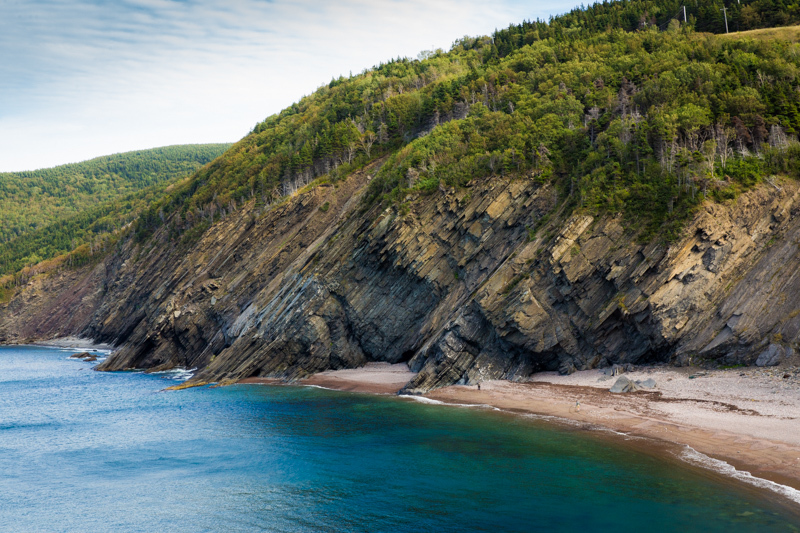 We arrived at the Cape Breton Highlands National Park campground, in Cheticamp, mid-late afternoon. I was like a kid in a candy store. 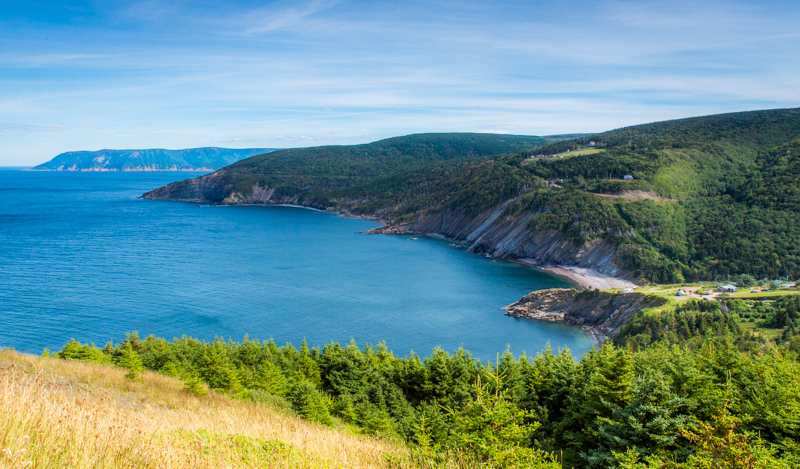 As soon as we parked the RV I was ready to tour the Cabot Trail. Charlie was tired from driving all day, but he was a sport and hopped in the Jeep’s passenger seat. 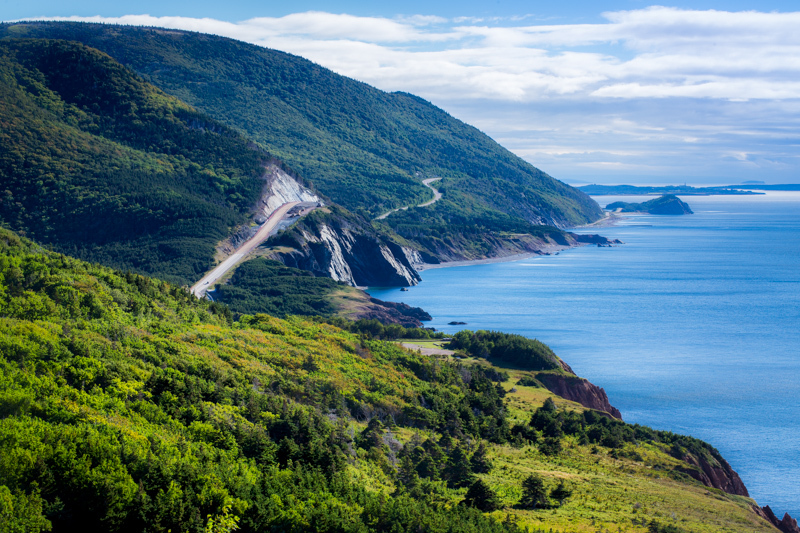 I happily jumped into the driver’s seat and headed out onto the famous Cabot Trail. 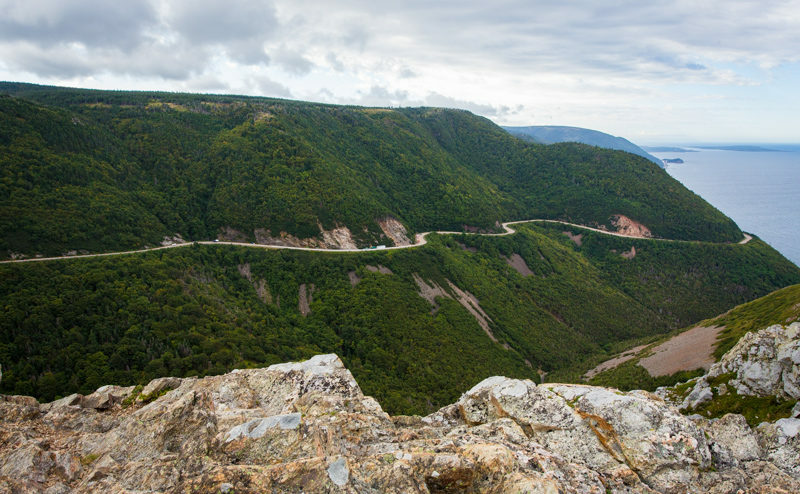 The road is mountainous and curvy, meaning it is fun to drive on! The views are breathtakingly beautiful. 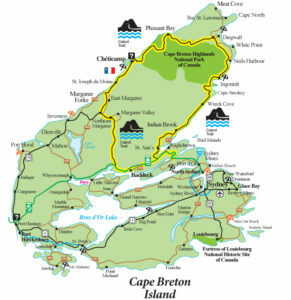 Below is a map of Cape Breton. 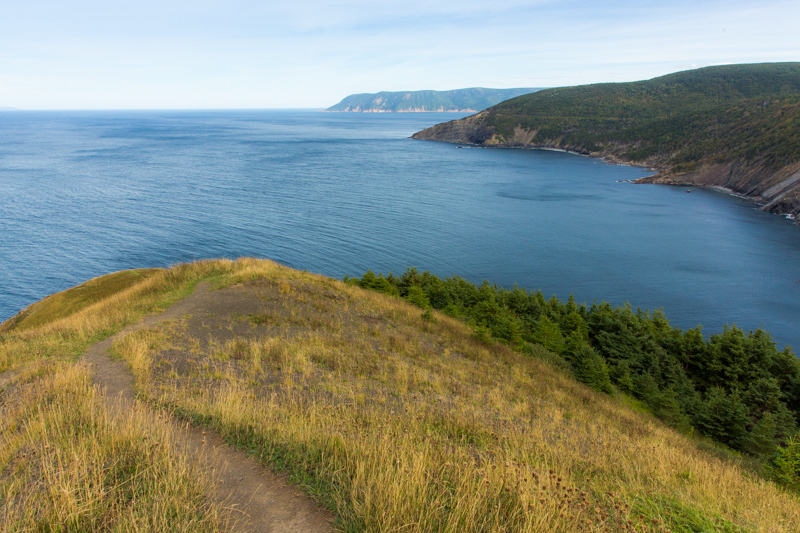 The yellow road is Cabot Trail, a 185 mile loop road. 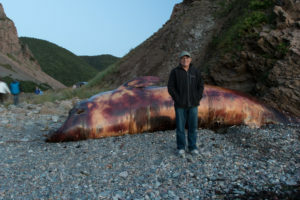 We found a dead whale not far from the road. It must have washed up recently. The stench was horrible, but Charlie wanted a picture of it. Now every time I see the picture I’m reminded of the smell. Yuck!! On our first full day in the park the sky was bright blue and the temperature was in the upper 60s so we decided to head up to Meat Cove. 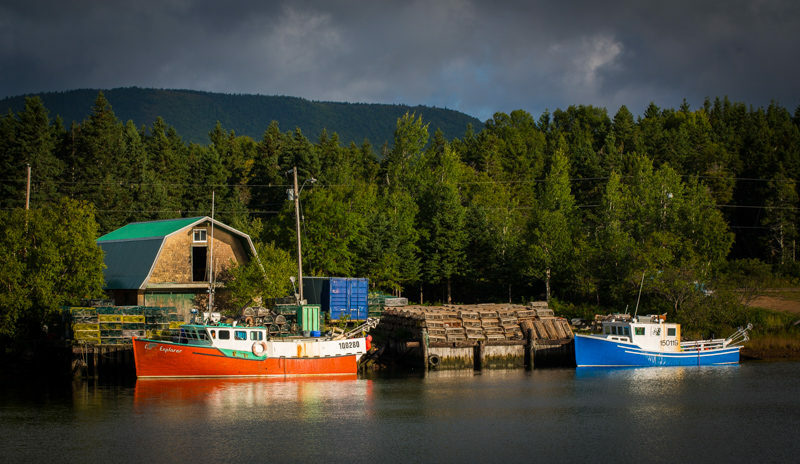 This is a rural fishing village on the most northern tip of the island. It was a beautiful drive. 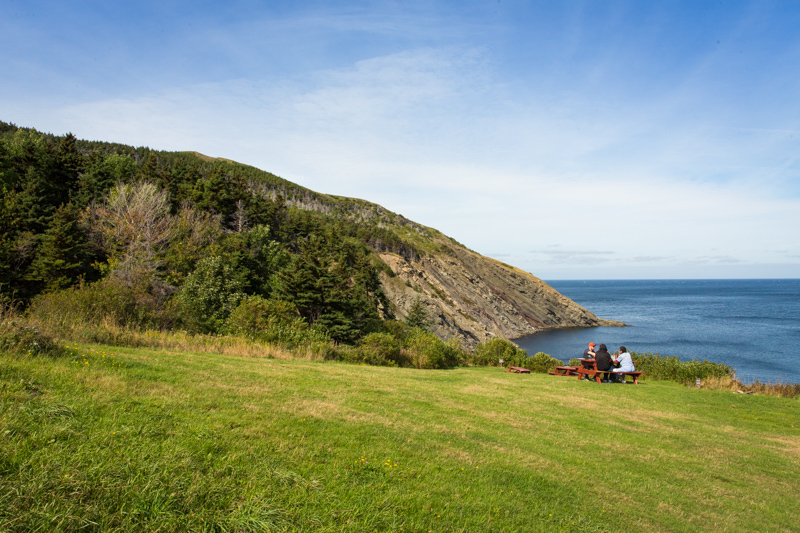 There isn’t much of anything in Meat Cove, except oddly enough, a campground on the edge of a cliff. 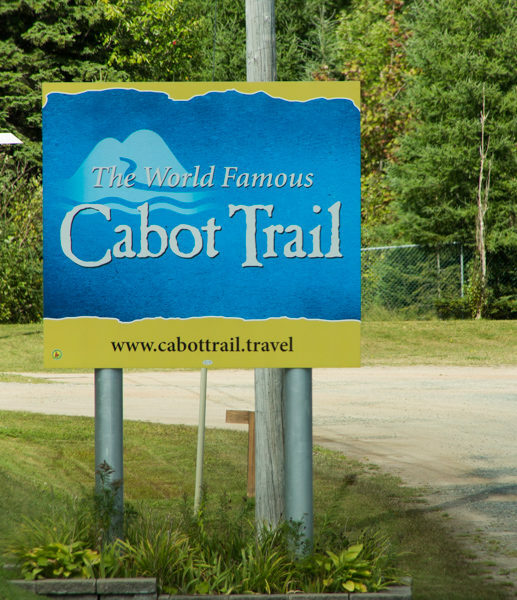 The owners of the campground have had the land in their family for 8 generations. 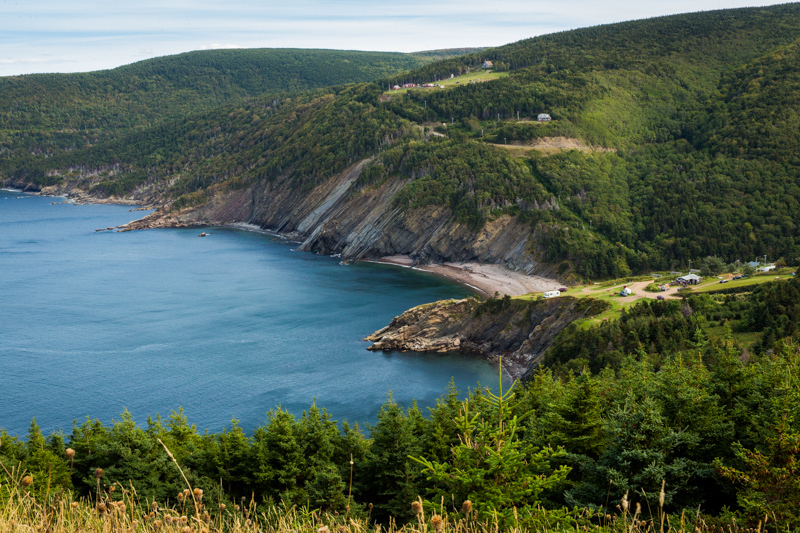 We were told that at times they have RVs up to 45 ft long make it all the way to Meat Cove. 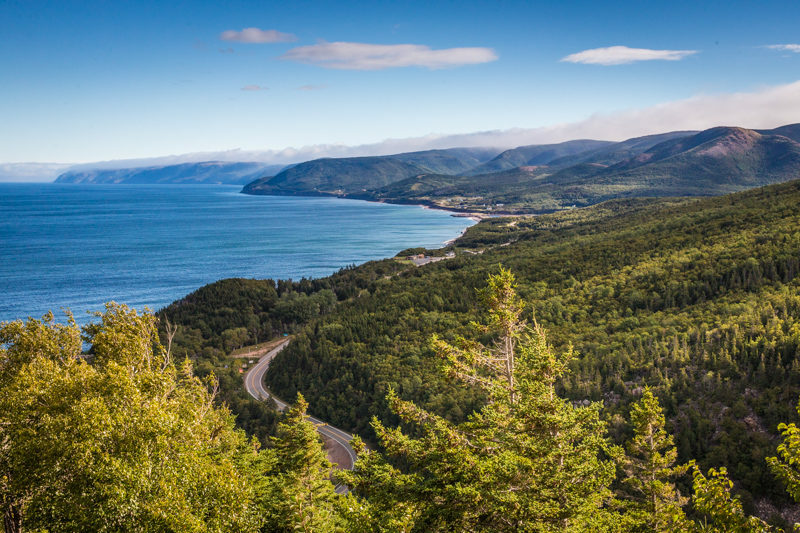 We considered that crazy since the last 5 miles to get there is on a narrow gravel road which skirts the cliff’s edge and has very sharp turns, not to mention that Cabot Trail itself is a challenging drive for a long RV. While chatting with the CG owner I noted how precariously close to the cliff’s edge the camp sites were and asked if they had ever had anybody fall off. She noted that they did in fact have one person who got too drunk and fell to his death. Yikes! The CG owner mentioned that there was a trail that we could hike which would lead us to the top of the mountain seen in the background of the picture below. 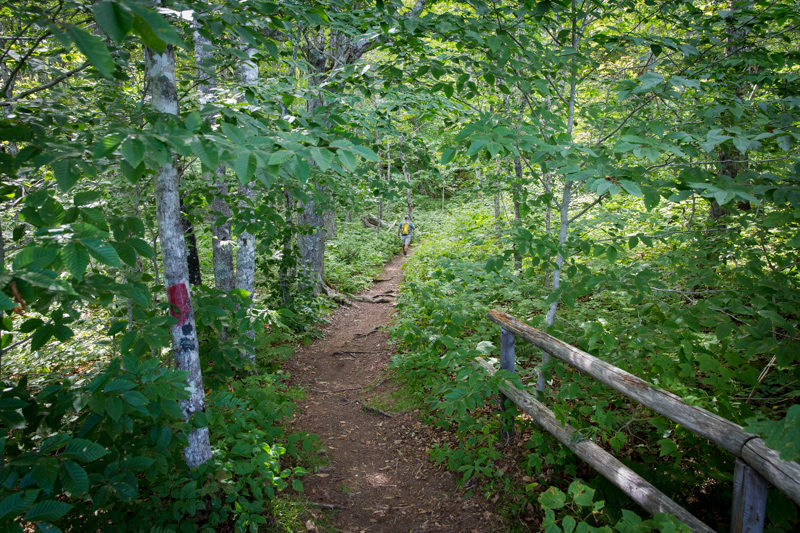 Here are a few pictures of the trail. The views from the mountain top were phenomenal. 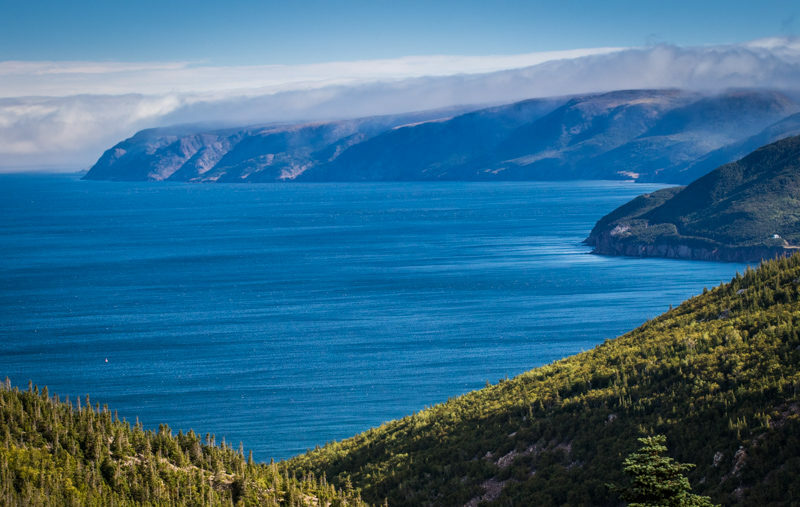 To the West of the mountain ridge is the Gulf of St. Lawrence. To the East of the ridge is the North Atlantic Ocean. For perspective, you can see a man standing next to the right most cliff. 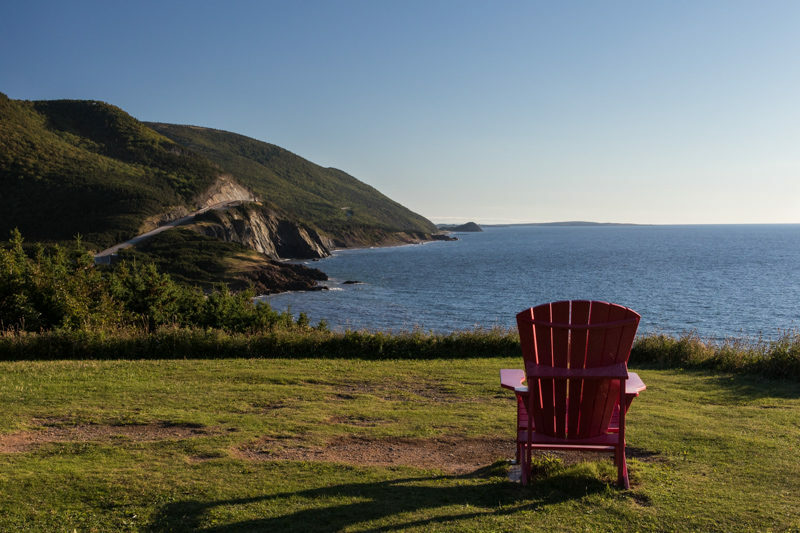 In the following picture, if you look closely at the small peninsula in front of the camper, and in front of the Canada flag, you will see a picnic table. That area is a tent site. Charlie and I walked out onto the peninsula to check it out. 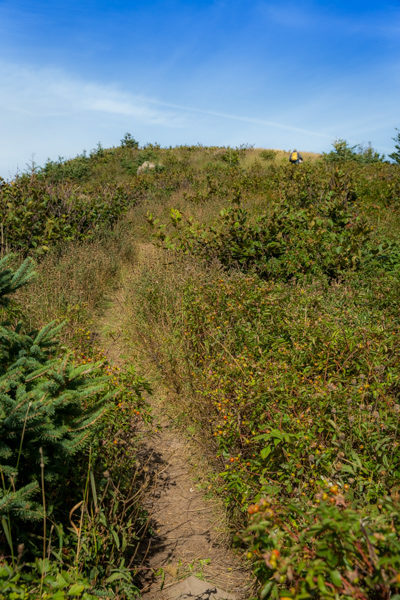 The path to the peninsula is very narrow, just wide enough for one person. 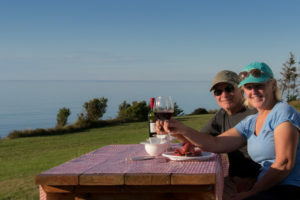 Once on the peninsula, there is enough room for one tent and picnic table, and not much else. 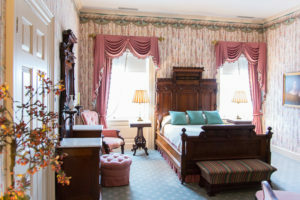 You wouldn’t want to sleep here if you have any history or risk of sleep walking!!! 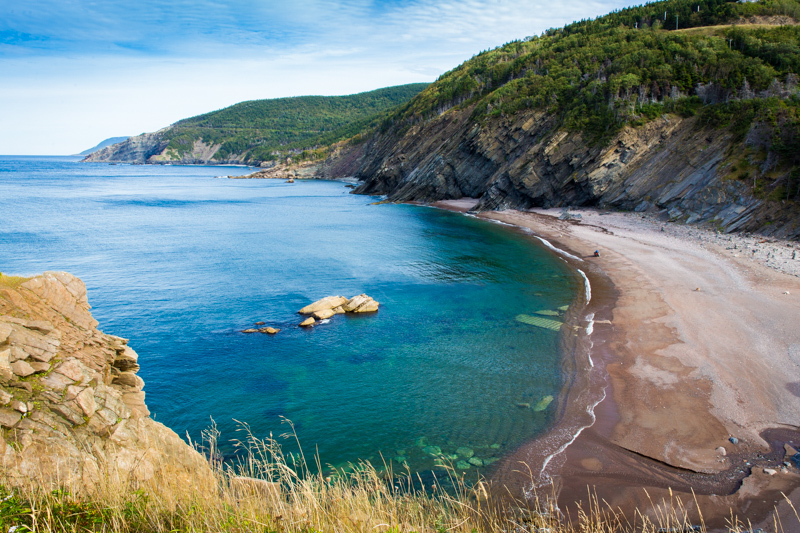 On the way to Meat Cove we stumbled upon Cabot Landing Provincial Park so we decided to check it out. It turned out to be a beautiful beach park. 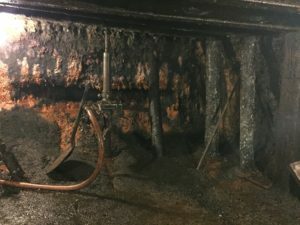 Here are a couple pictures from that area. 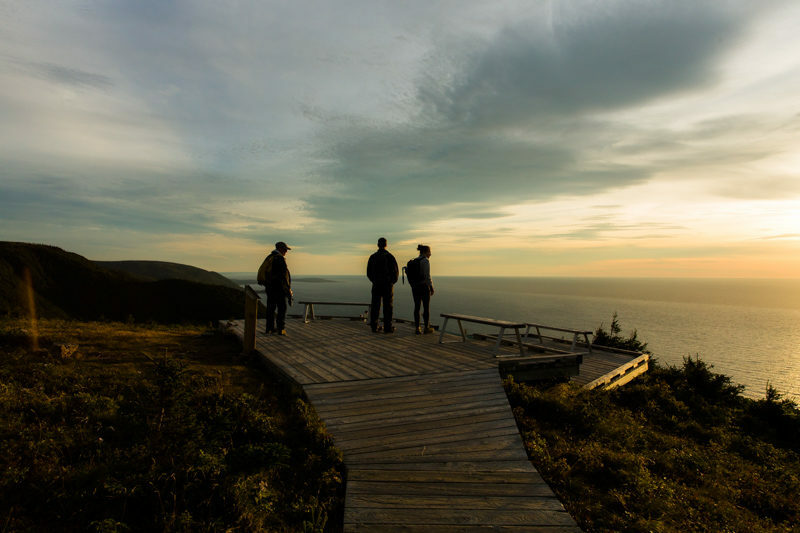 On the way back from Meat Cove we decided to do the Skyline Trail for sunset. 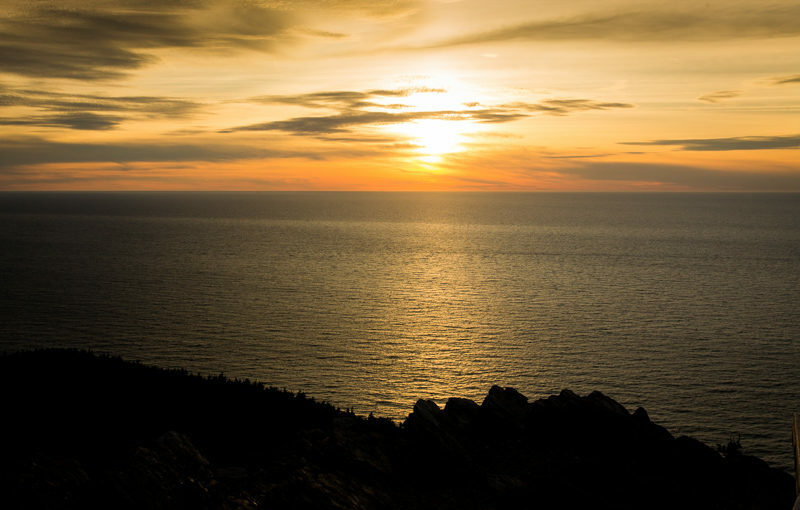 This is a 5.7-mile loop hike, which takes you to a gorgeous location for sunset. By the time sunset arrived the winds had picked up and it was freezing on top of the mountain. It was quite an experience though and we were glad we had done it. We headed back down the trail fairly quickly after the sun set since we had over 2 miles to hike back to the car in the dark. We had flashlights, and had to use them near the end of our hike as it was pitch black out. 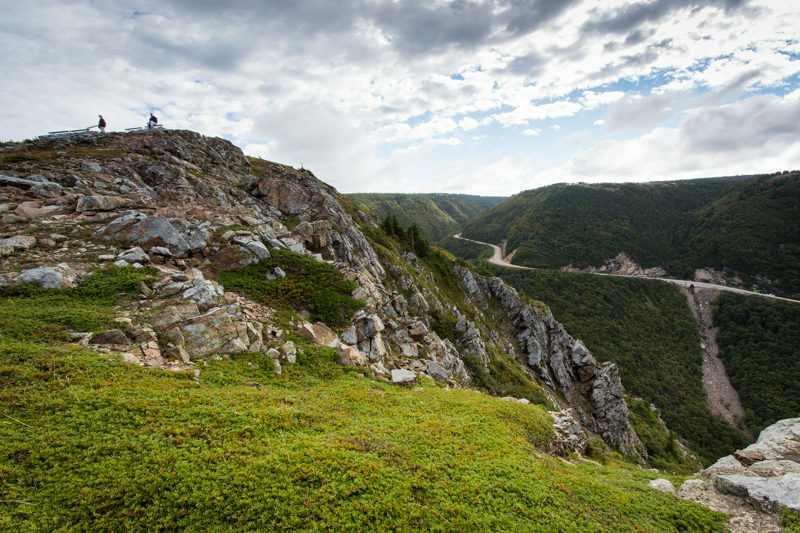 I was very happy that we had a great first day and was able to experience the Cabot Trail, as the next two days were miserable. We had a lot of rain and fog, which kept us homebound. 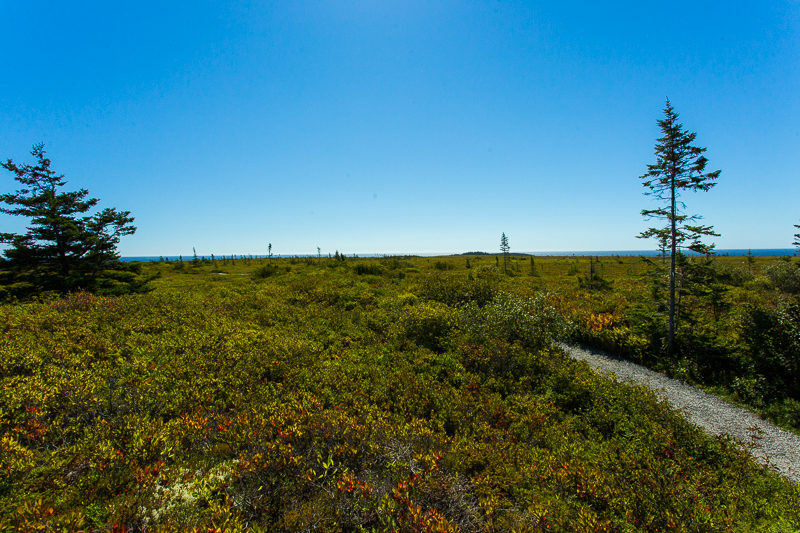 On our fourth day in the park we ventured over to the other side of the Park, to Ingonish. That turned out to be a mistake since it was covered in fog. Now, we should have figured this out when we stopped at an overlook on the way there and took the picture below. The side of the island we were on was perfectly clear while the opposite side was covered with clouds! We kept hoping the sky would clear up, but it didn’t. 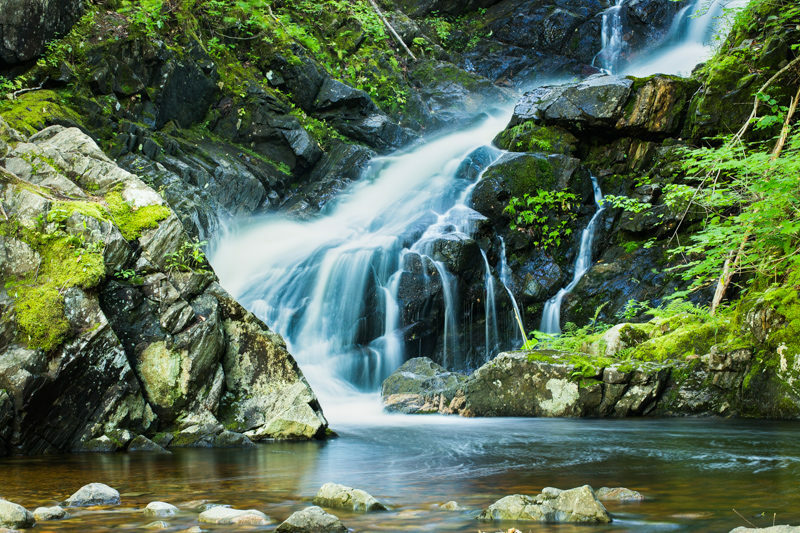 The day wasn’t completely wasted though, as we stopped and took a nice hike along the McIntosh Brook trail to a Waterfall. We also spotted an Immature Eagle up in a tree and caught him flying away. 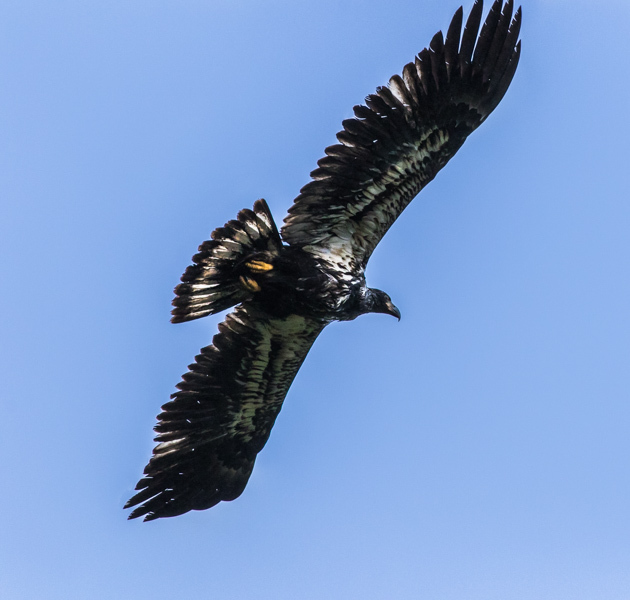 We learned that Immature, or Juvenile Eagles have dark heads, while adult eagles have white ones. The heads do not turn white until about their 4th year. On our fifth day we headed back to the other side of the Island. Although the morning was cloudy it was accurately predicted that the day would turn sunny. 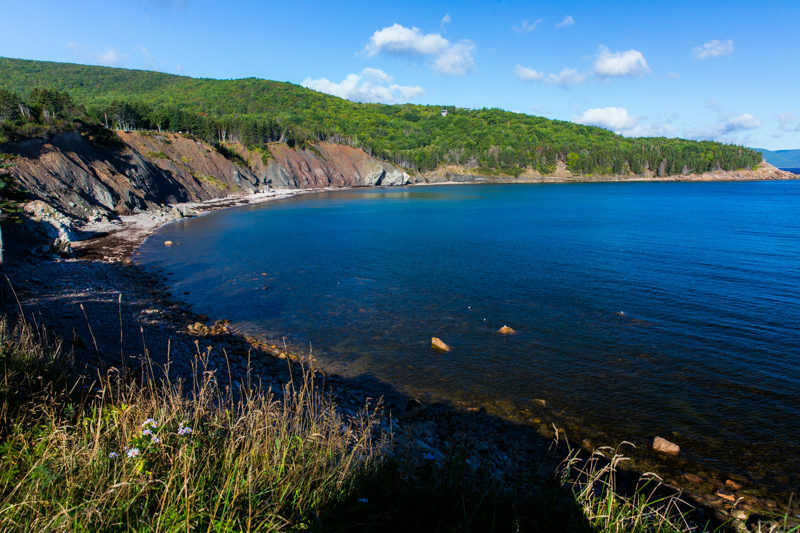 We left early and headed to Neils Harbour, an hour and half drive away. I had seen some colorful fishing boats that I wanted to get a picture of the day prior. 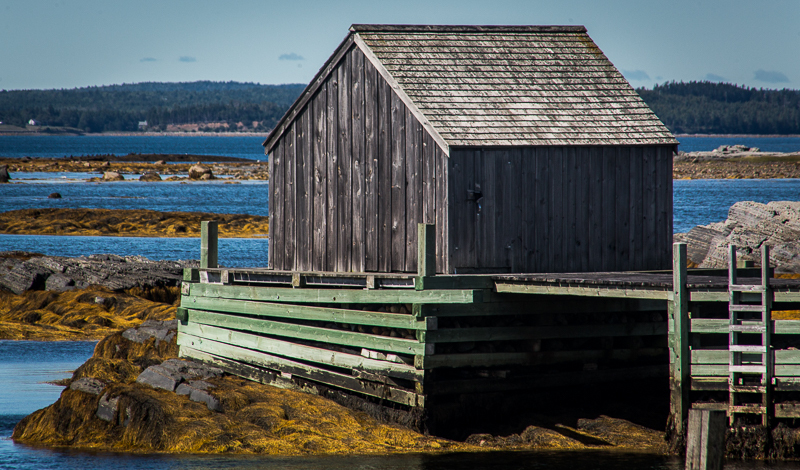 I felt that the composition conveyed a lot about Nova Scotia. 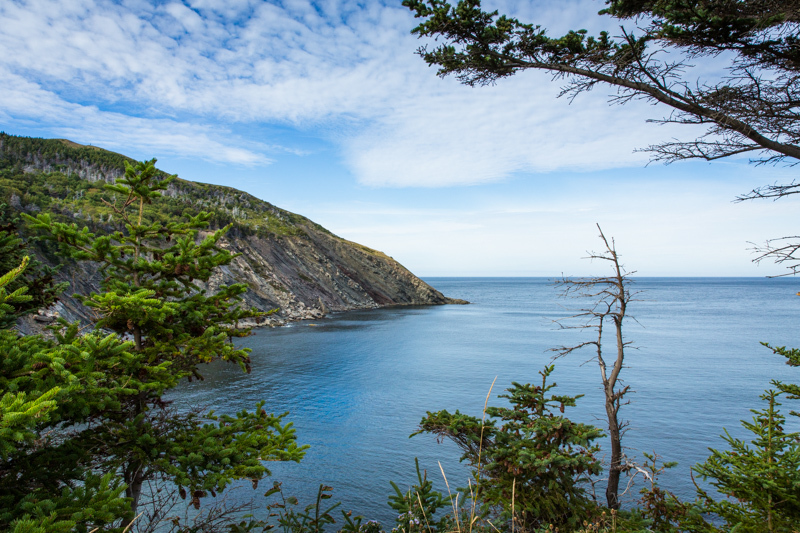 We then continued onward to Ingonish, stopping along the way to take in the scenery. We also stopped and took a 3-mile hike around Warren Lake. It was quite boring, but at least we got some exercise in after being cooped up in the RV for a couple days. 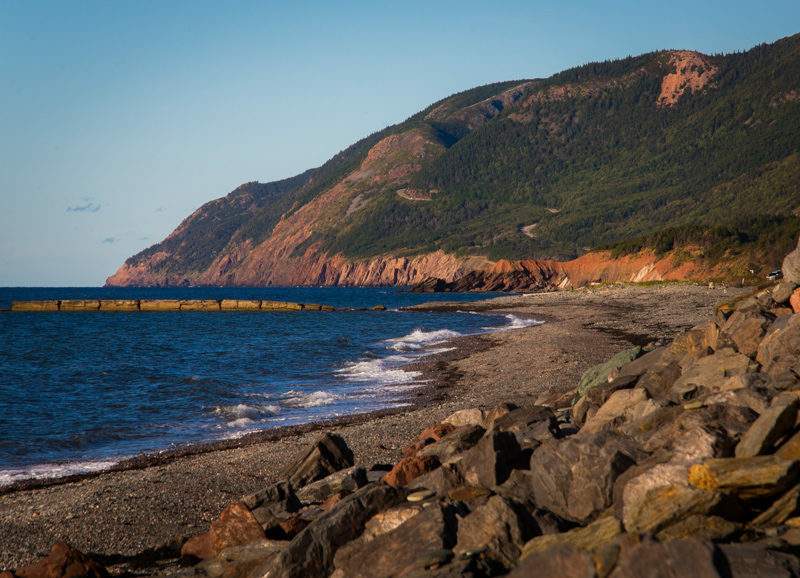 After a long day of sightseeing we headed back to Cheticamp, another hour and a half drive. On our last day we decided to stay close to our campground, as we were quite tired of all the driving. Skyline trail was nearby so we decided to hike that trail again. The sights are spectacular. The trail itself is very pretty too. 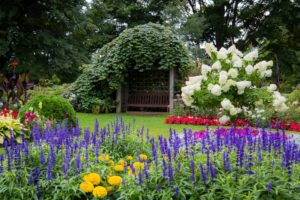 I imagine in the Spring and Summer it would be very colorful with flowers everywhere. 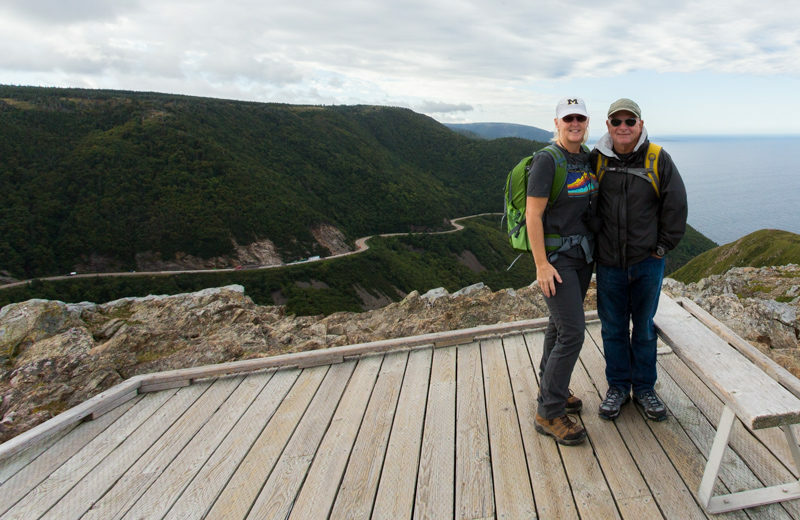 We enjoyed our visit to Cape Breton National Highlands Park. We were a little early for Fall colors, but the park is beautiful none the less. 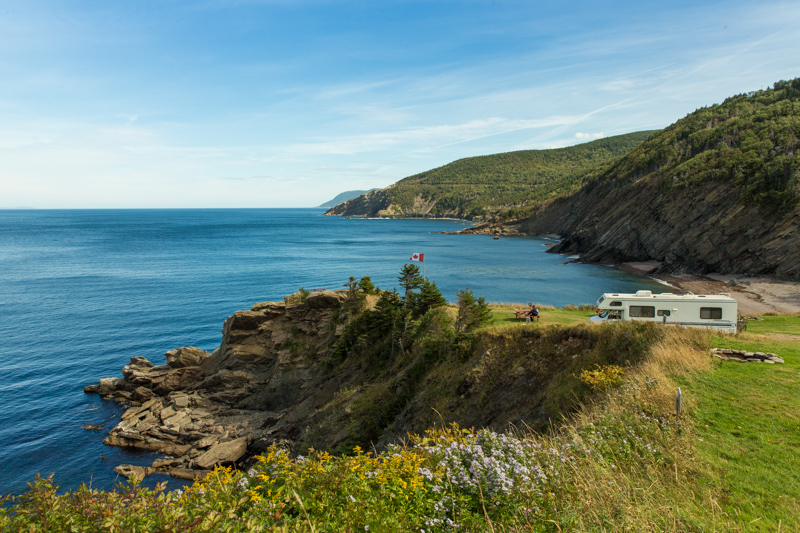 If we had a smaller RV we would have enjoyed driving it across the Cabot Trail and up to Meat Cove. This would have made our days a little easier, as much of it was spent on the road. 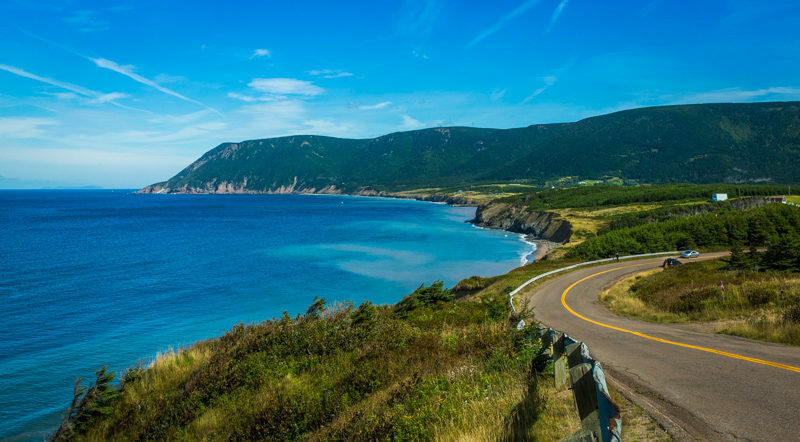 The Cabot Trail is 185 miles round trip so if you base yourself at one end like we did then you get stuck with a lot of driving time. This has been one of our favorite places to visit on our trip. 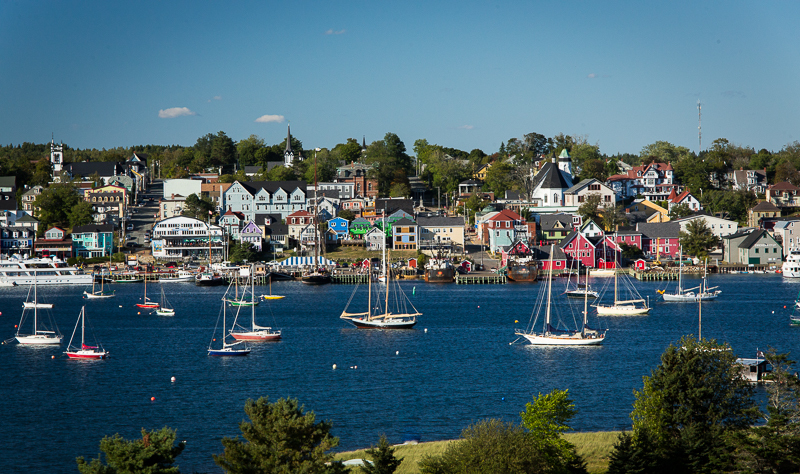 Lunenburg is designated as a UNESCO World Heritage Site for its status of having “the best preserved North American example of an eighteenth century British colonial town plan.” The city was founded in 1753. 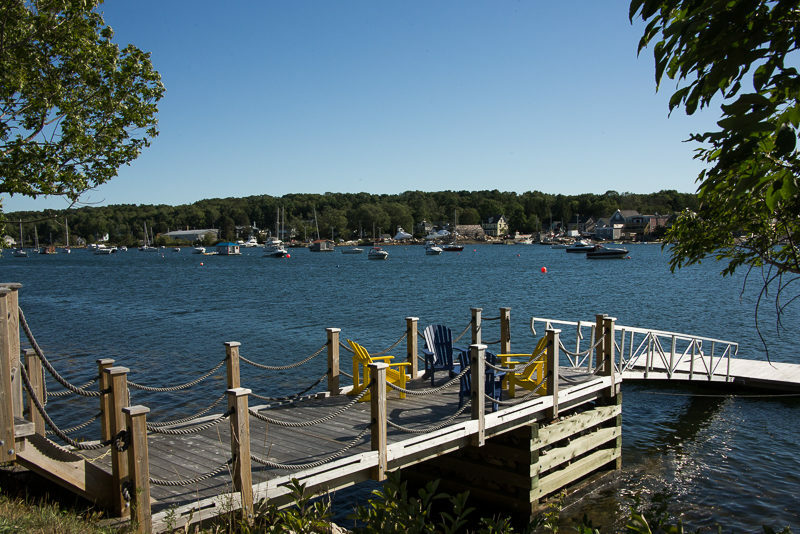 It is located on a beautiful harbor with many sailboats anchored throughout. 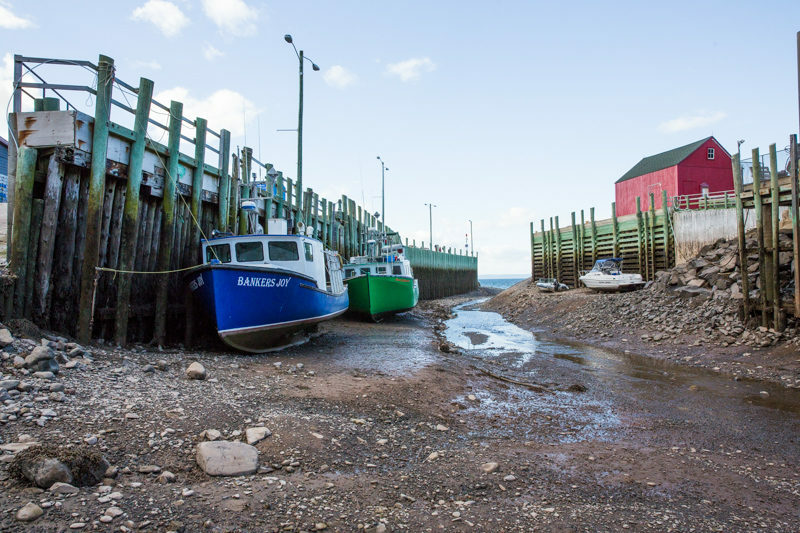 Unlike the Bay of Fundy, which has dramatic water level changes due to the tides, the tidal change in Lunenburg is only about 6 feet. 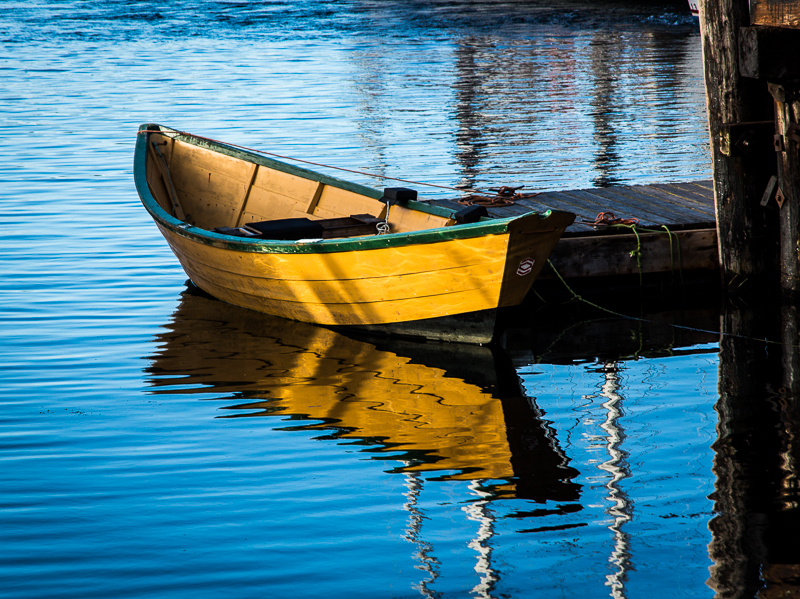 Therefore, boats can remain in the harbor at all times, making for a beautiful picture. Just up the street from city center, within walking distance, is a city owned campground. It is a very small CG, with very small sites. But you can’t beat the location. We stayed there for 5 nights. We arrived early afternoon on Sep. 11th, parked the RV, and then took a stroll through the city and along the harbor. The buildings and homes are covered in bright paint, giving a very cheery and welcoming feel. Near the harbor they have an impressive memorial to fishermen lost at sea. 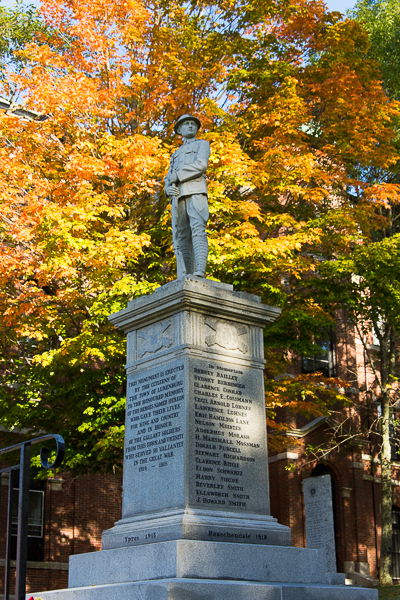 They also have other impressive memorials throughout the city recognizing those lost in various wars. 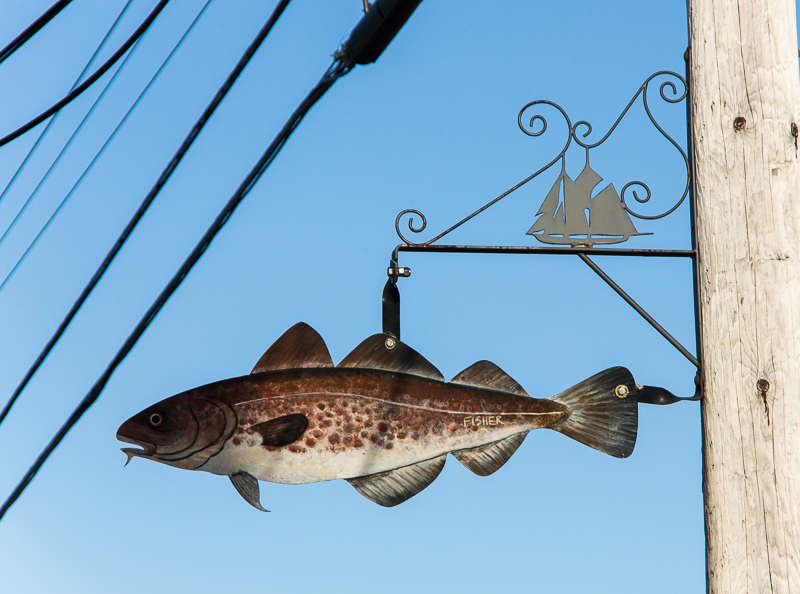 Fishing and boating are integral parts of Nova Scotia, as depicted in this artwork, attached to a street post in Lunenburg. Parked in the harbor is the Bluenose II schooner. This is a ship adored by many. The original Bluenose was built in Lunenburg, back in 1921, as a fishing and racing schooner. 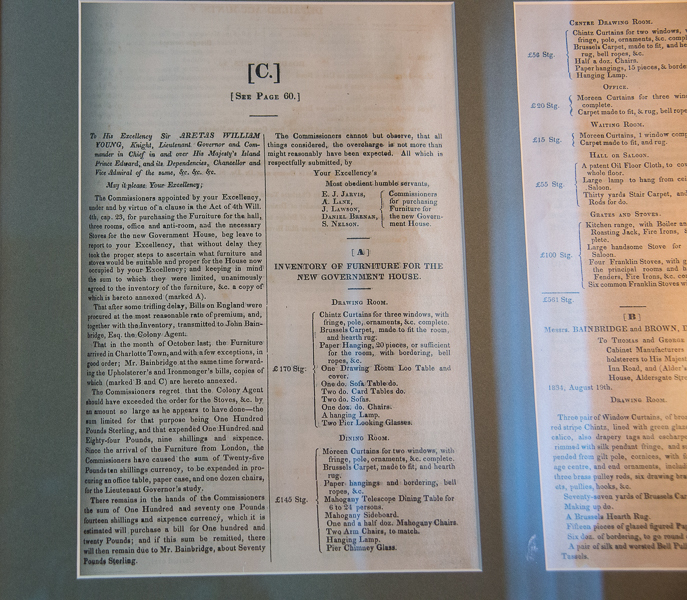 It won its first Fishermen’s Trophy in October 1921 and held onto it for 17 years. The schooner symbolized Nova Scotia’s prominence in the fishing and shipbuilding industries. It met its demise in Haiti in 1946 when it struck a reef. In 1963 the Bluenose II was built. Many of the same people who had worked on the original vessel assisted with the Bluenose II build. 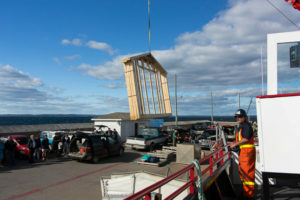 Their goal was to replicate the Bluenose as closely as possible. 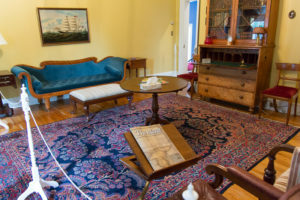 In 1971 the Bluenose II was gifted to the Government of Nova Scotia. Although we did not take a sail on the schooner we were able to get on-board and walk around it. 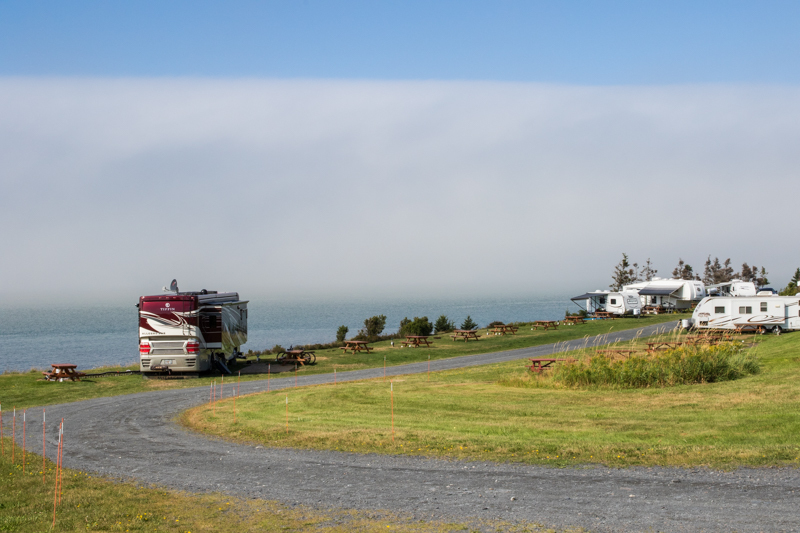 The location of the Lunenburg Campground is great for day trips. 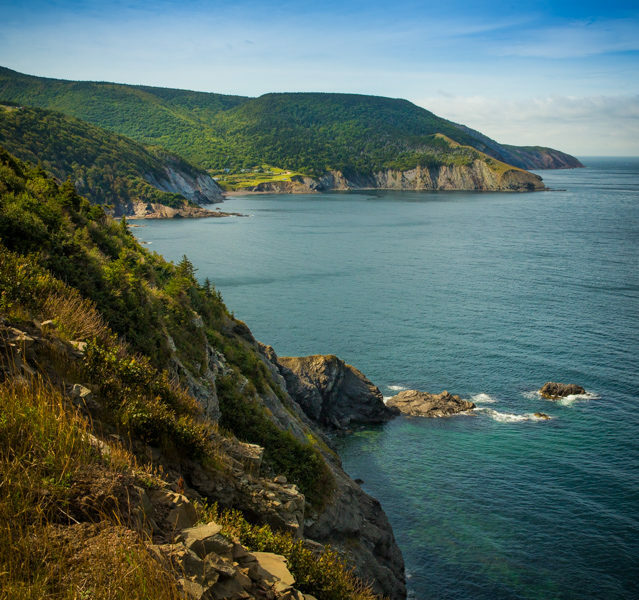 Everywhere you look there is beauty along the coastline, interior lakes surrounded by lush trees, quaint fishing villages, beaches, lighthouses and great people. 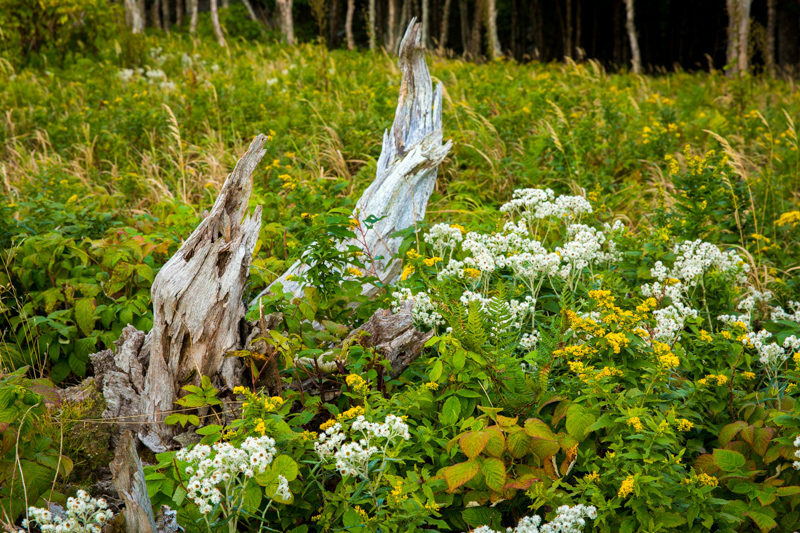 During one of our days we drove South to the Kejimkujik Seaside National Park. It was about an hour and a half drive, but it was worth it. As we started walking down the trail we were reminded of a hike we had taken in Inverness, CA. For the first 15 minutes on the trail we couldn’t see much past the high vegetation, but we could hear the water in the distance. Finally, we were able to see the ocean that awaited us. Once we arrived at the ocean we felt like we were in Hawaii and the Caribbean at the same time. The water was crystal clear, then vibrant blue, then shades of emerald green. The rocks became large boulders as we continued our walk. The sand was white and soft, similar to the Gulf side of Florida. 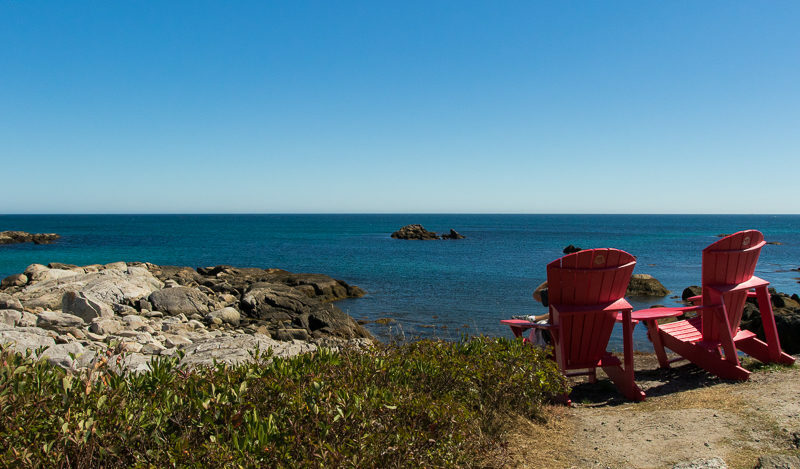 We enjoyed lunch while sitting on the National Park Red Chairs, looking out over the Ocean. After a full day at Keji we decided to take a break from sightseeing the next day and went golfing. It was the first time in months we had swung the clubs. Neither of us played very well. However, we loved just being out on the course. 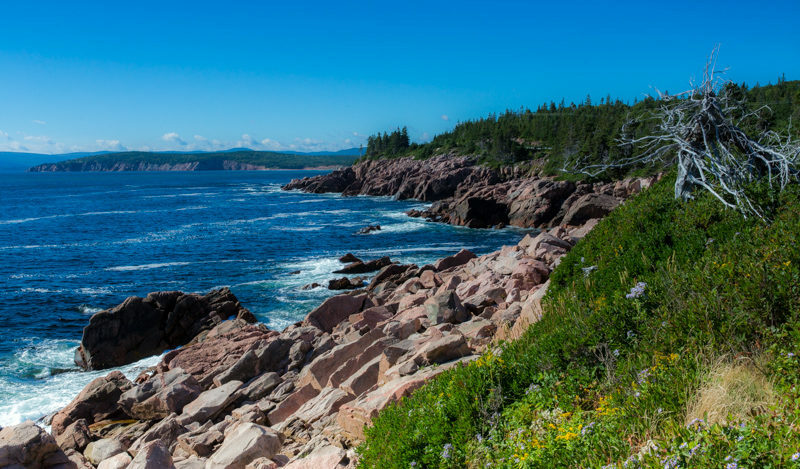 It was a beautiful day in Nova Scotia! We were blessed again with another nice day and decided to take a drive along the coast. 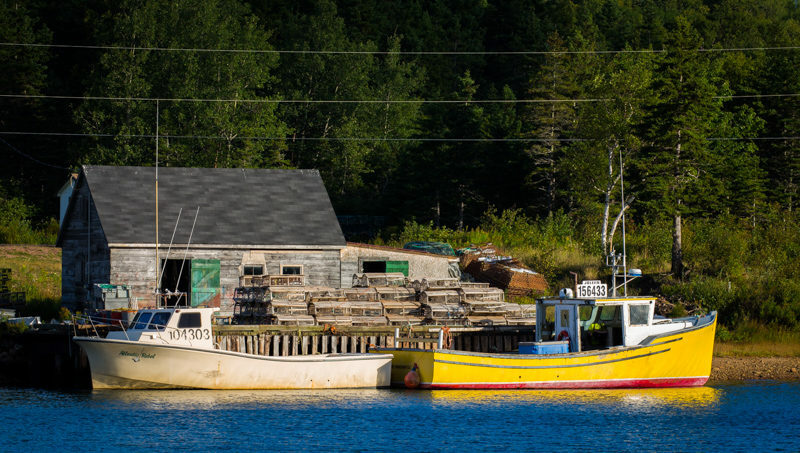 We traveled along Rt 332 to Riverport where we hopped on a ferry for a short ride over to LaHave. We had lunch at the bakery there. The interior design was very old fashion. We loved it. 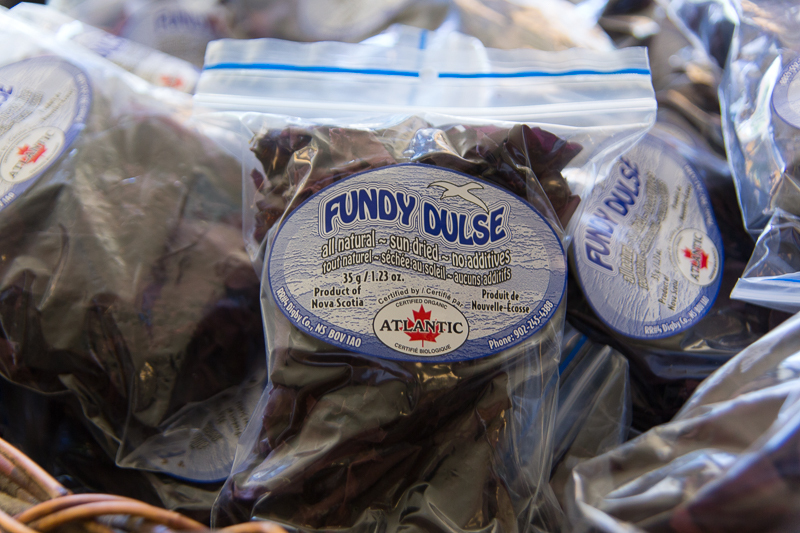 We found that you can purchase seaweed throughout Nova Scotia. They sold it here as well. Charlie was willing to try it. I was not. He didn’t care for it too much. 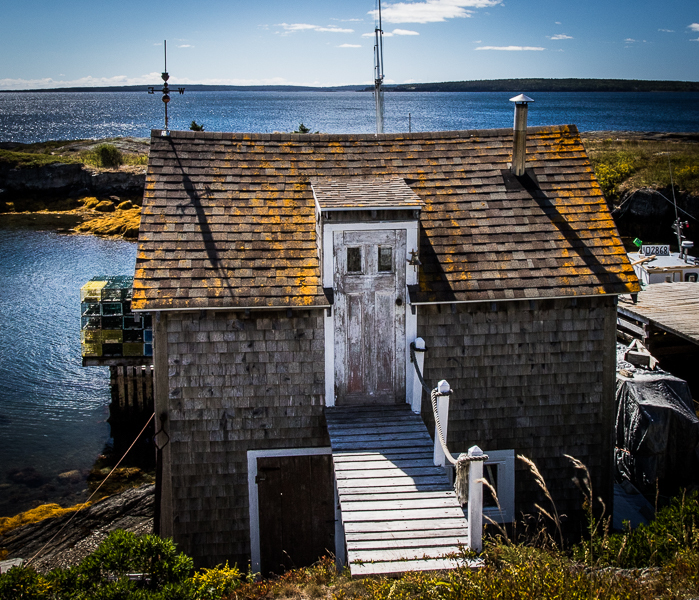 After lunch we continued along the coast on Rt 331, to a lighthouse and then we crossed over to Bush and LaHave Islands. The islands were fairly desolate, with the exception of a small number of houses and fishing boats. The views, and ambience, were spectacular though. 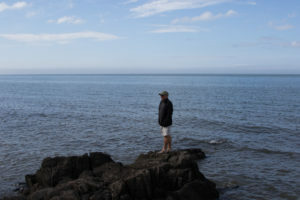 On our last day in the Lunenburg area we were contemplating what to do. 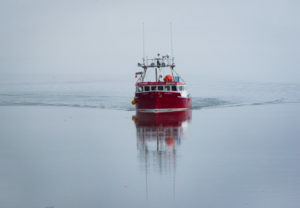 I wanted to visit the nearby village of Blue Rocks for some photography opportunities and then I wanted to stroll through the Mahone Bay shops. 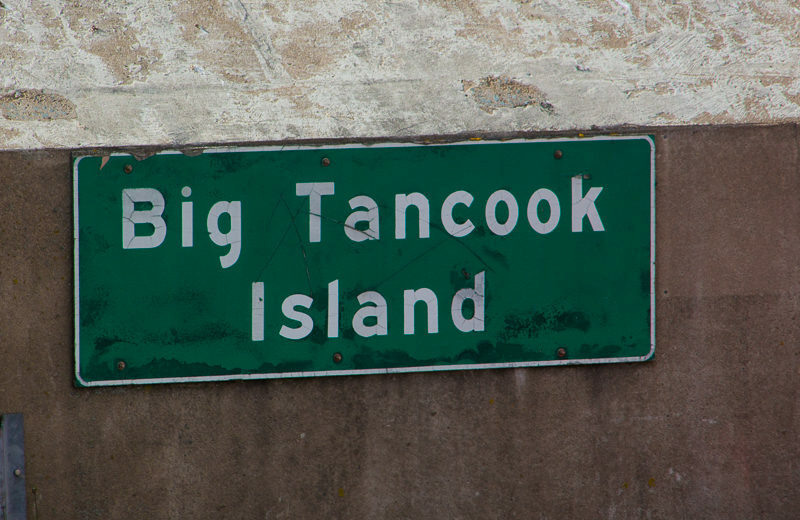 Charlie wanted a little more adventure and suggested that we visit Big Tancook Island later in the afternoon, after shopping in Mahone Bay. It seemed like a great plan for our day. We began with Blue Rocks. 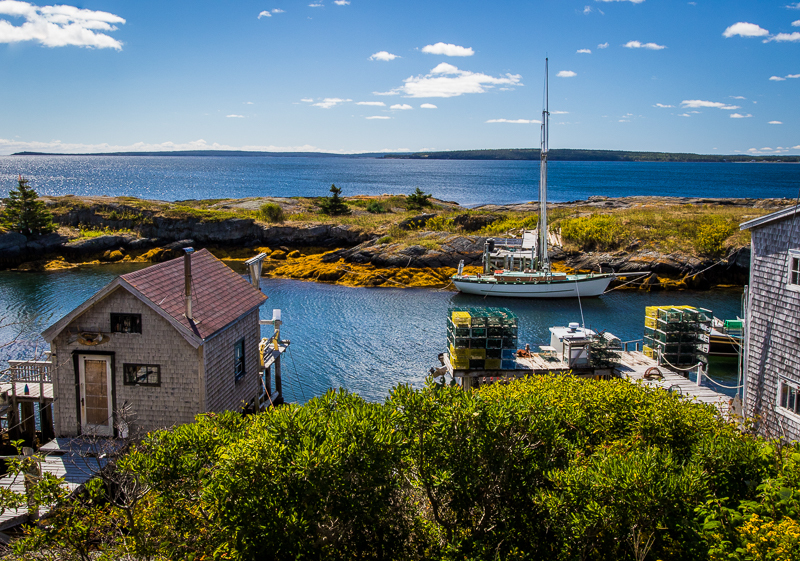 There is not much in the village of Blue Rocks, with the exception of great scenery, which of course we loved. Next, it was onto Mahone Bay. 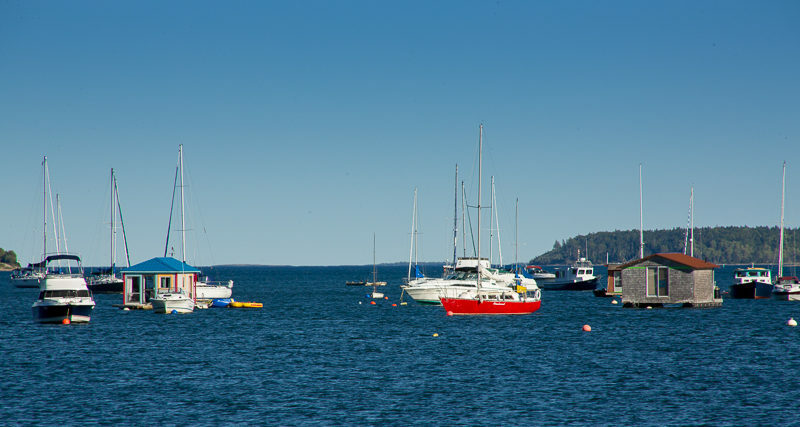 Mahone Bay is a vibrant small town with a beautiful harbor. Across the harbor is a view of three prominent churches that have existed for nearly a century. 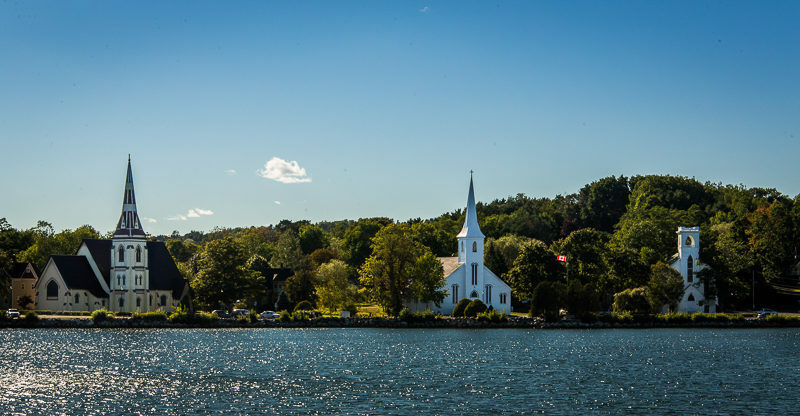 A picture of the three churches together is iconic for Nova Scotia, and Mahone Bay in particular. After Mahone Bay we drove onward to Chester to catch the ferry to Big Tancook. It also stops by Little Tancook, which is really little! 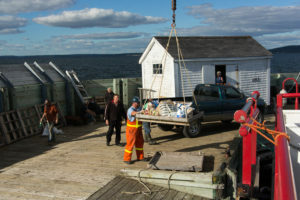 The ferry ride to Big Tancook is about an hour long. The Island is 6 miles off the shore of Chester. 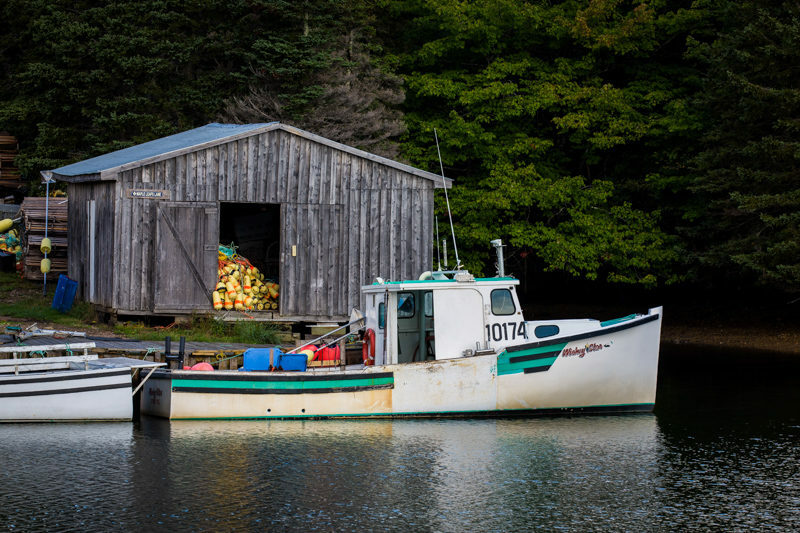 Only about 120 people live on the island full time. There is one elementary school. We learned that there are currently 4 students attending. Once you reach sixth grade you need to take the 6am ferry each day over to Chester and then catch the bus to school. You then return on the 4:30pm ferry. That’s a long day for the kids. You can click on the link below for a map of the island. 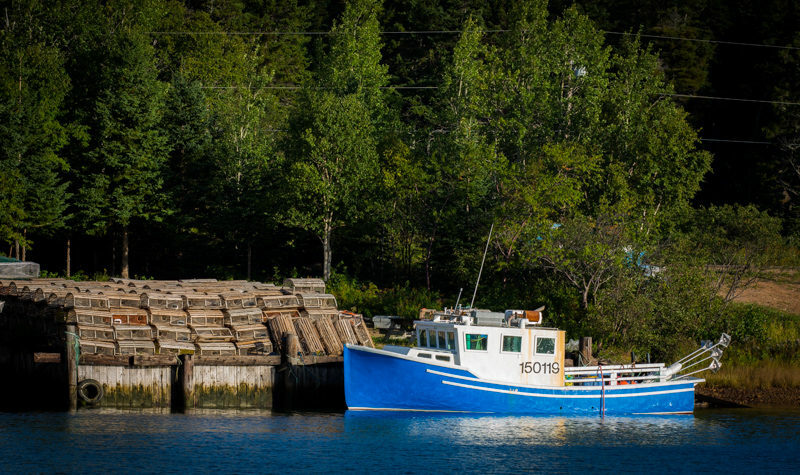 The ferry transports everything one needs to live on the island. 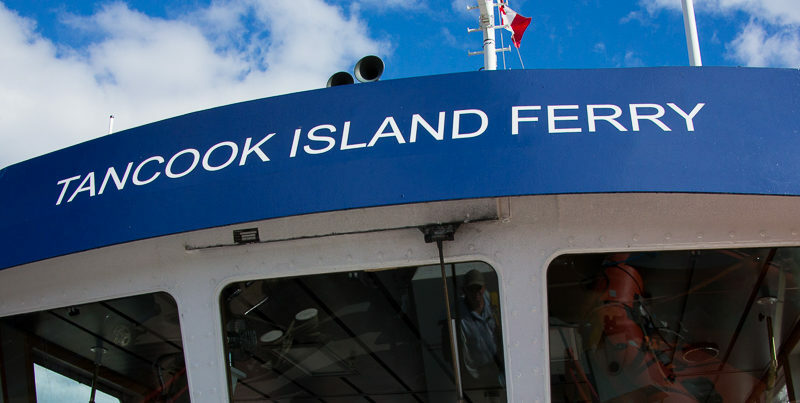 The ferry is not designed to transport vehicles so visitors walk or bike ride around the island. 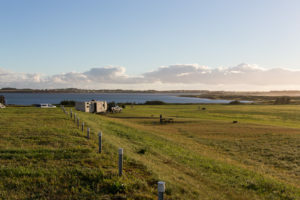 Residents of the island typically have a vehicle on the island and then another on the main land. In the pictures below you can see everything from groceries, to fuel, to building materials being delivered. Charlie looked up the ferry schedule and determined that the 4:30pm departure out of Chester would work for us. This would get us on the island around 5:30pm. He advised that our return ferry options were 6:30pm or 9:30pm. He suggested we take the 6:30pm return ferry, as it would give us sunset on the water and allow us to walk around the main portion of the island for an hour. That seemed like a good plan. It was a beautiful day for a ferry ride. Shortly after we departed we began chatting with a wonderful group of folks on the upper deck. 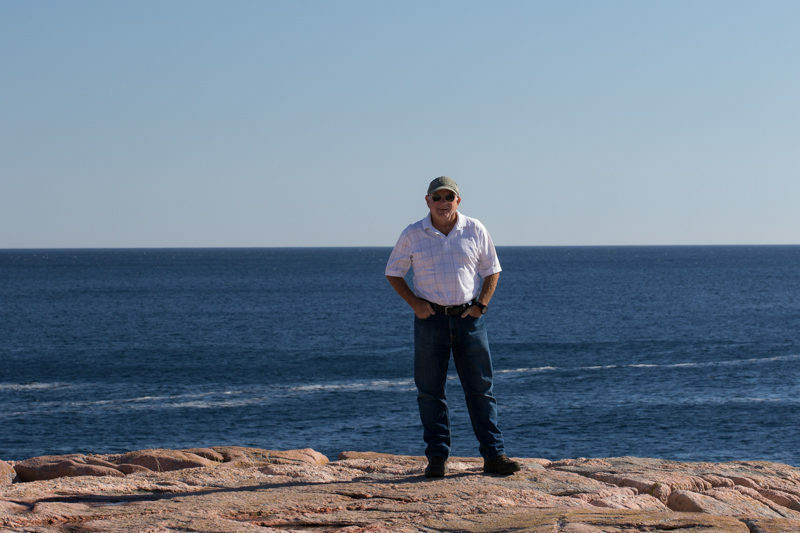 We learned about life on the island and how Norm and Dave had visited the area one day not long ago, fell in love with it, bought a place, and moved to Big Tancook. I was excited about exploring the island. However, once we were on our way to the island we discovered that Charlie had misread the ferry schedule. 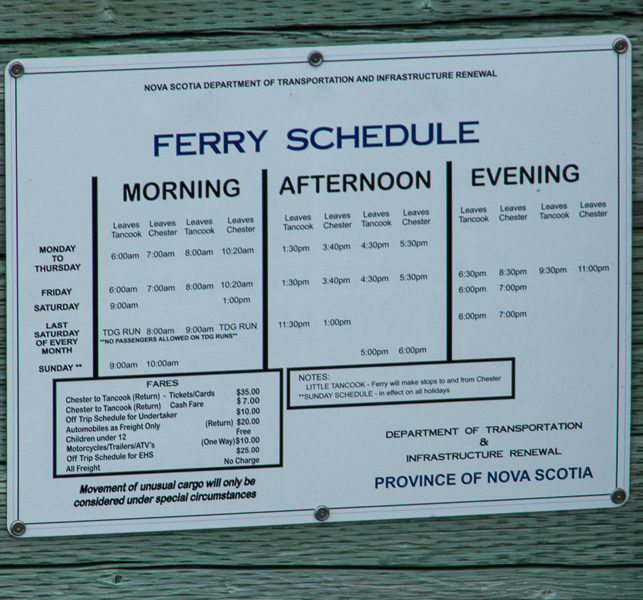 The later ferries only depart on Friday and Saturday, and this day was Thursday. We had to return on the same ferry we were currently on. Our newly acquired friends offered to find us a place to crash for the night if we chose to stay on the island. 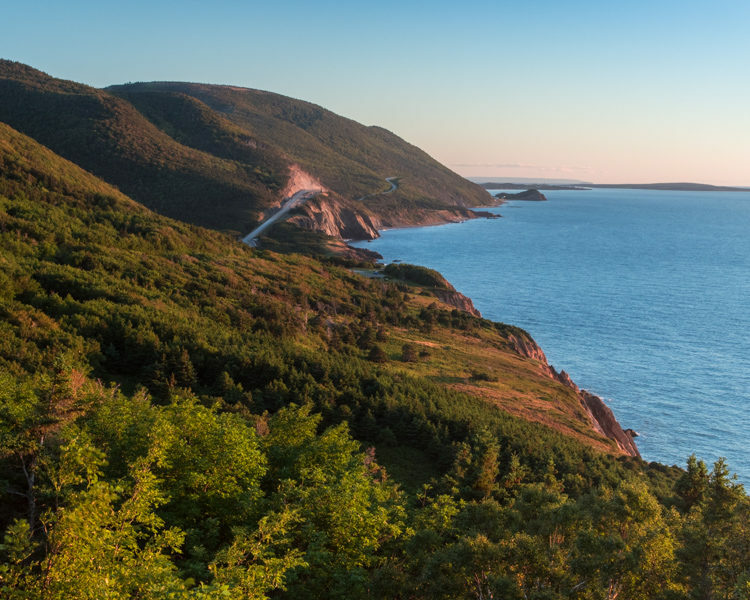 We would have jumped at the offer for such a great adventure had we not been leaving very early the next morning to Cape Breton. So, all I was able to get were pictures from the deck of the ferry, LOL. On the way back I kept laughing and thinking about how we would have looked, standing on the dock waiting for the 6:30 pm ferry only to find out that there wasn’t one. We would have been knocking on David and Norm’s front door, as there are no hotels, motels or B&Bs on the island. In the end, $12 for the two of us to have a two hour boat ride across Mahone Bay on a beautiful evening wasn’t too bad. 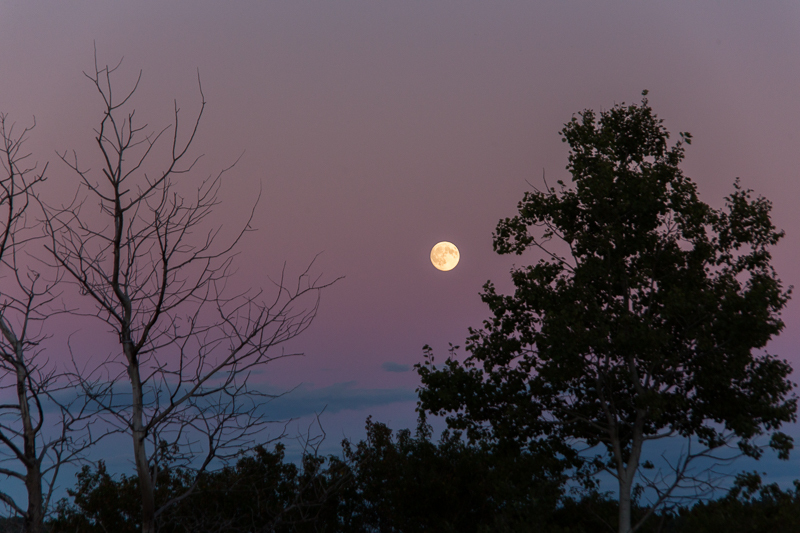 Once we returned to the RV we were blessed with an absolutely beautiful moonrise. The skies were pink and blue and the moon was large and bright. It was the evening before the Harvest Moon. It was a great way to end our visit to Lunenburg. 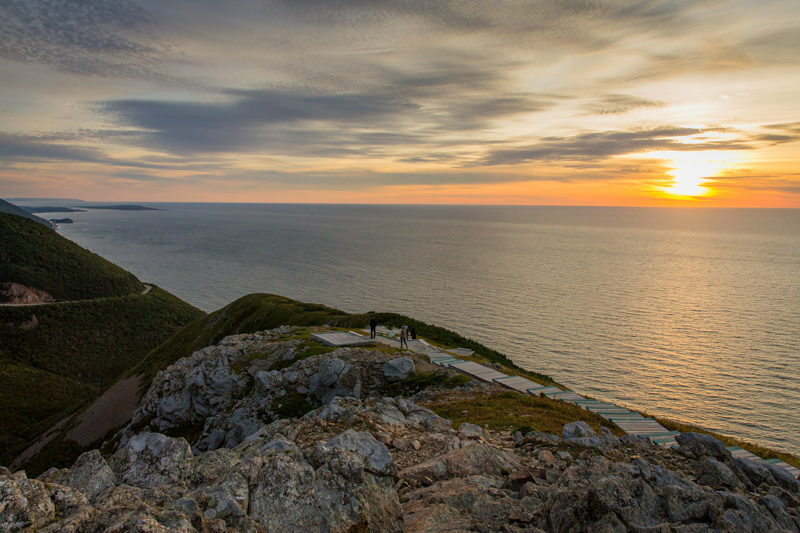 The following morning we made the long trek up to Cape Breton for another adventure. 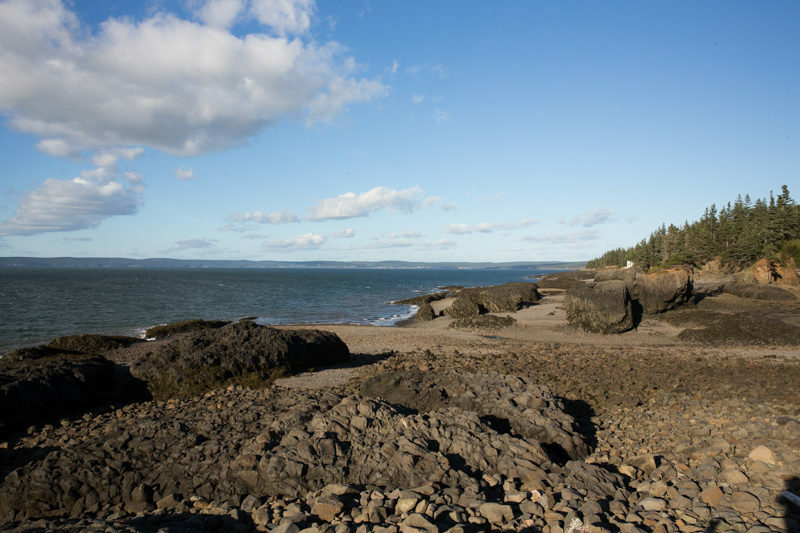 We spent our second week in the Annapolis Valley Region of Nova Scotia about mid-way down the Bay of Fundy, at The Cove Campground in Annapolis Royal. 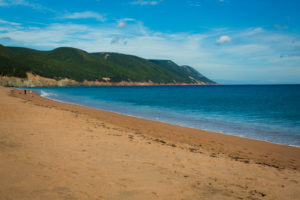 This campground was suggested to us by a Nova Scotian we met on PEI. We were originally planning to stay at another CG nearby (Dunromin). 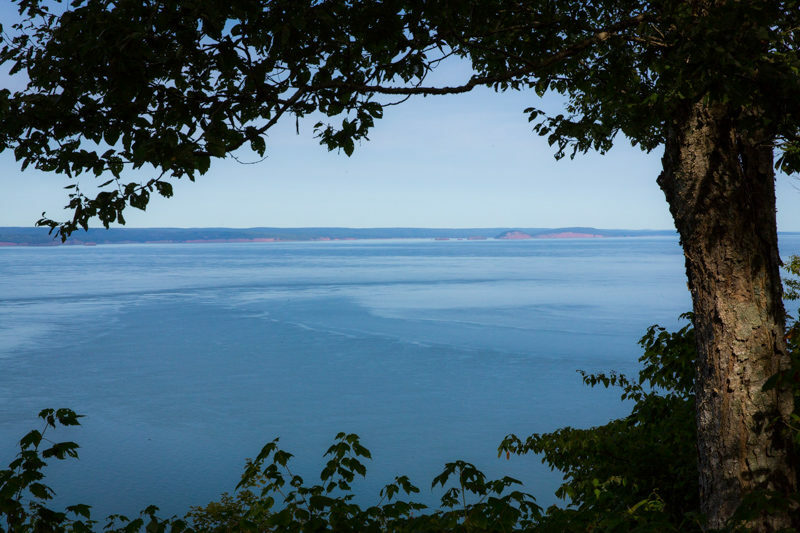 We were given a large spot in the front row, overlooking the Bay of Fundy. Since it was past Labor Day Weekend we essentially had the place to ourselves. 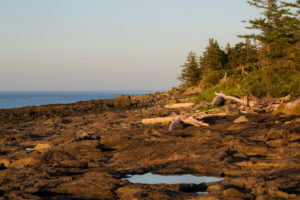 In front of our RV was a large grass lot and then below that was a rocky coastline which we ventured out on during low tides. Right across the street from the campground is Nautical Seafoods Cafe & Market, so we ate well! In addition to live lobsters, they sell 1-lb bags of frozen lobster meat for $30, which is only about $23 US. A great deal. We purchased a 1-lb bag and made fantastic lobster rolls with bacon, tomatoes, celery and bacon mayo. OMG! We made 4 large sandwiches with the meat and then went back to the store to buy three more bags before leaving the area. 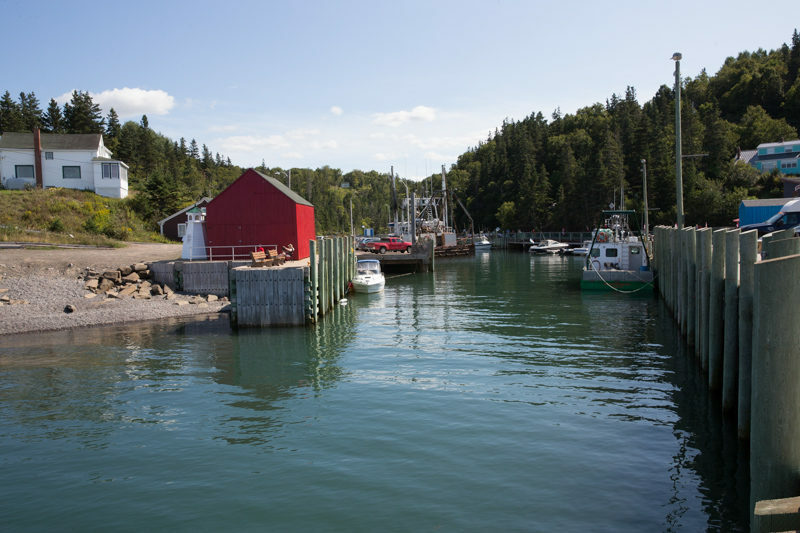 On our last evening at The Cove, and on the Bay of Fundy, we purchased steamed lobsters and seafood chowder from Nautical. We then had a wonderful dinner sitting outside the RV, watching the sunset. 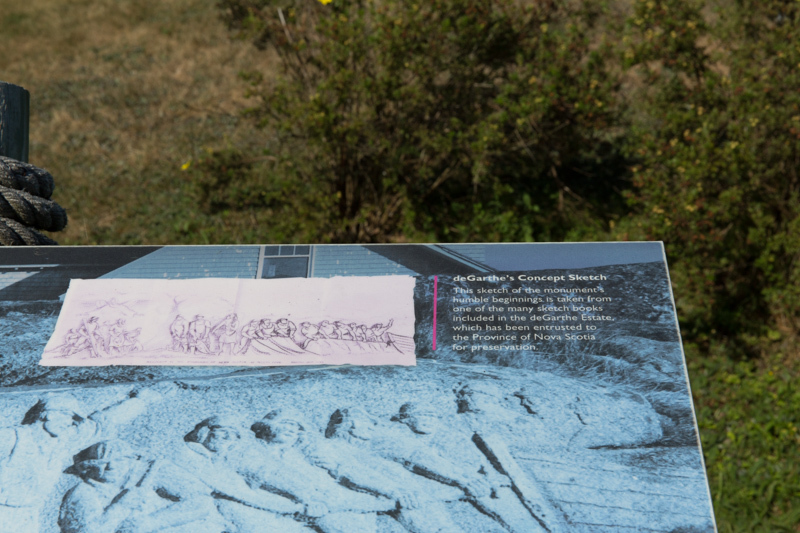 There are a couple of Canada Historic Sites near the Campground. 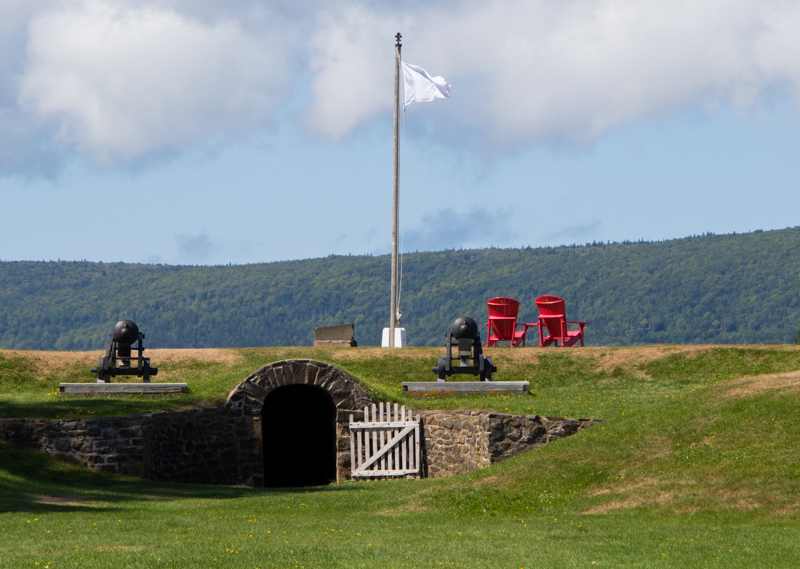 The first one we visited was Fort Anne. 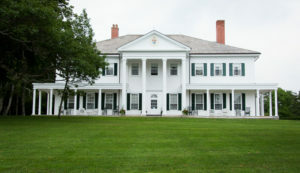 It is Canada’s oldest National Historic Site. 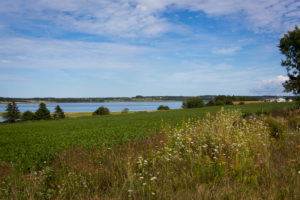 The Fort is no longer there but we were able to walk the earthen walls and look out onto the beautiful Annapolis River. 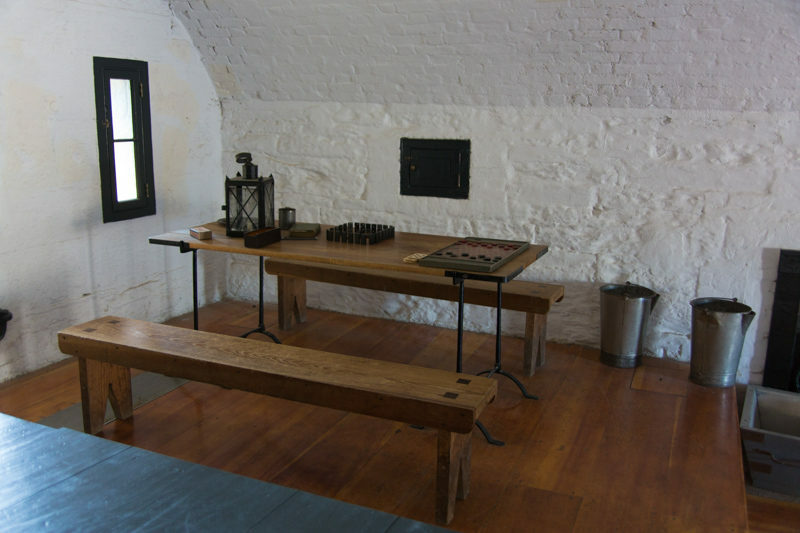 We also explored the 1797 Officers’ Quarters Museum. We learned a bit more about Nova Scotia’s history. We also found the Red Chairs. 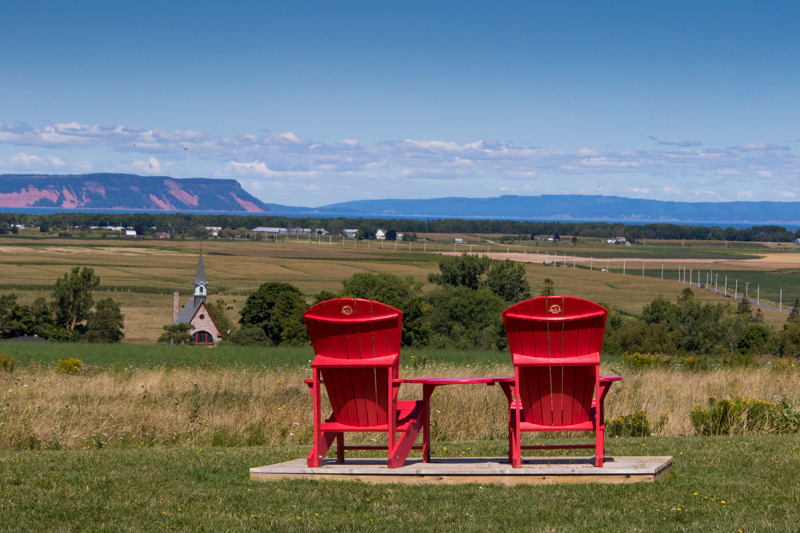 We just love how Canada has 2 red chairs at each of their National Parks and/or Historic Sites. The other historic site we visited was Port Royal. The story behind this site is quite interesting. 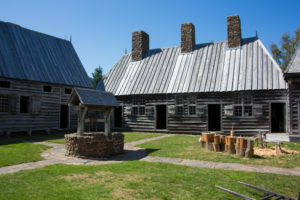 The Habitation at Port-Royal was established by France in 1605. 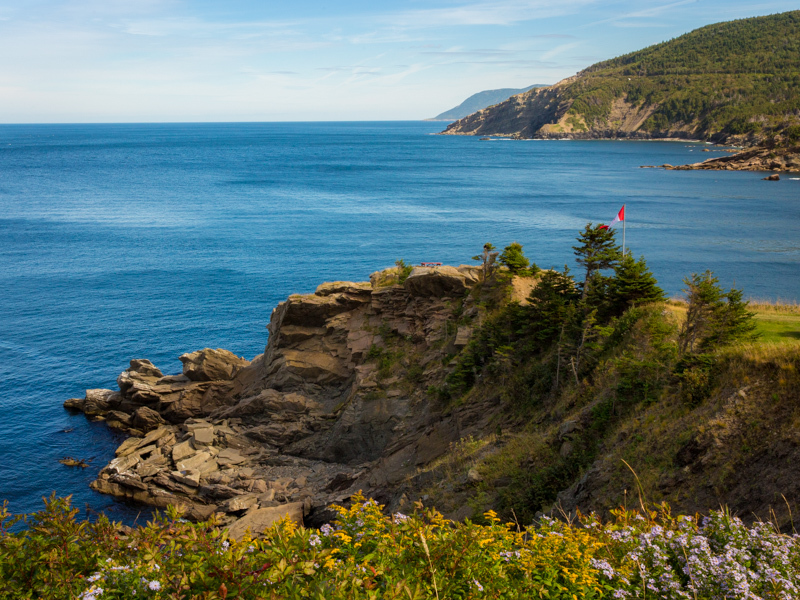 It was their first settlement in North America and it served as the capital of Acadia until it was destroyed by the British just 8 years later, in 1613. 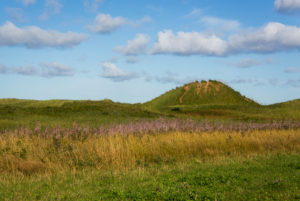 In 1925 the original location of the settlement was classified as a National Heritage Site and in 1939 a group began to reconstruct the original habitat. What stands today is an outstanding replication of what the habitat must have looked like back then. 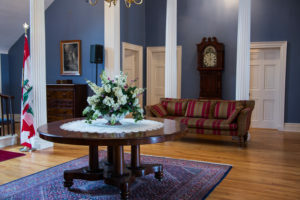 They did an unbelievable job with the structure and furniture. We also took a tour of the Annapolis Royal Tidal Generating Power Plant. It is the only one of its kind in North America. You are given a hard hat, safety glasses and taken down 8 stories to see the generator. I felt like I was back at work at GE. 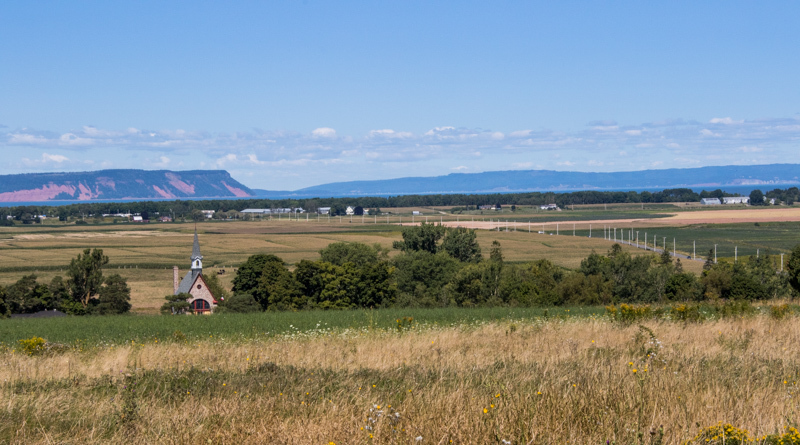 On our next to last day in Annapolis Royal we had absolutely beautiful weather. 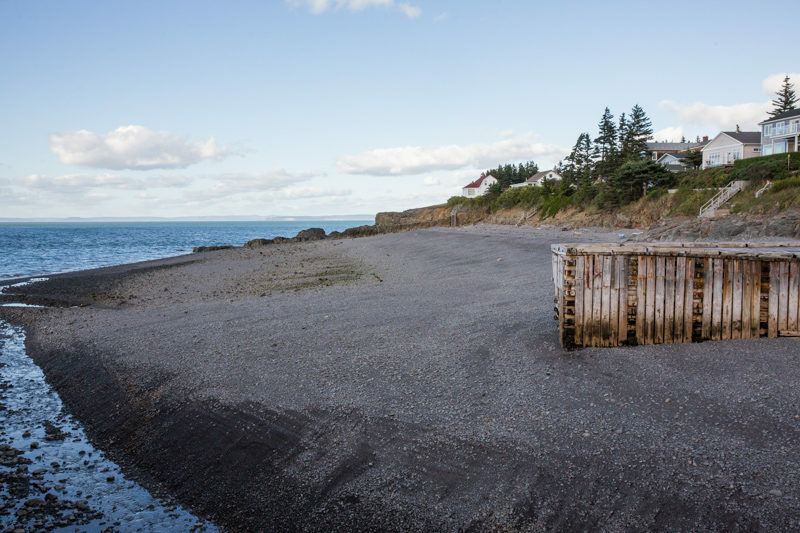 We decided to take advantage of it and drove down to Brier Island. It is about an hour and a half Southwest of Annapolis Royal. 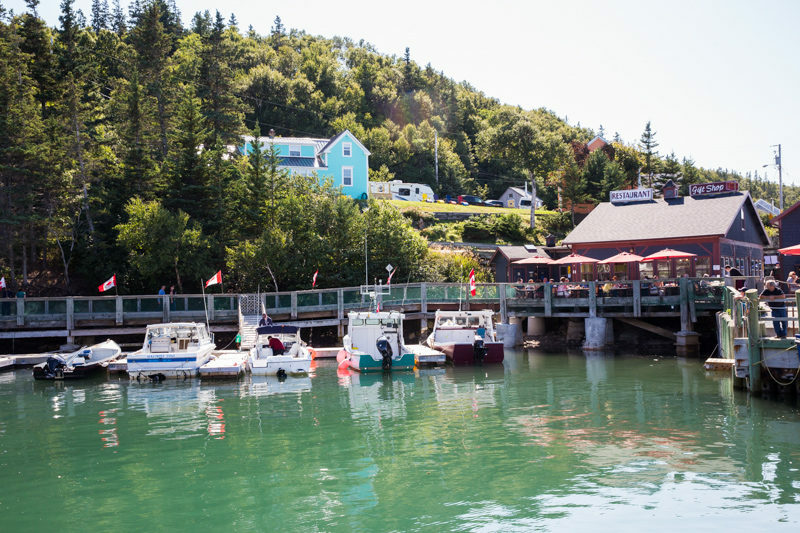 You take 2 ferries to get to the island. 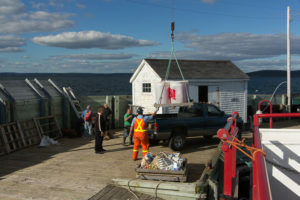 While on Brier Island we went on our second Whale Watching Trip. This one was much better than our previous one, as we were able to see humpback whales right next to our Zodiac. You could almost touch them. The weather was perfect for such an adventure; sunny, warm and smooth waters. 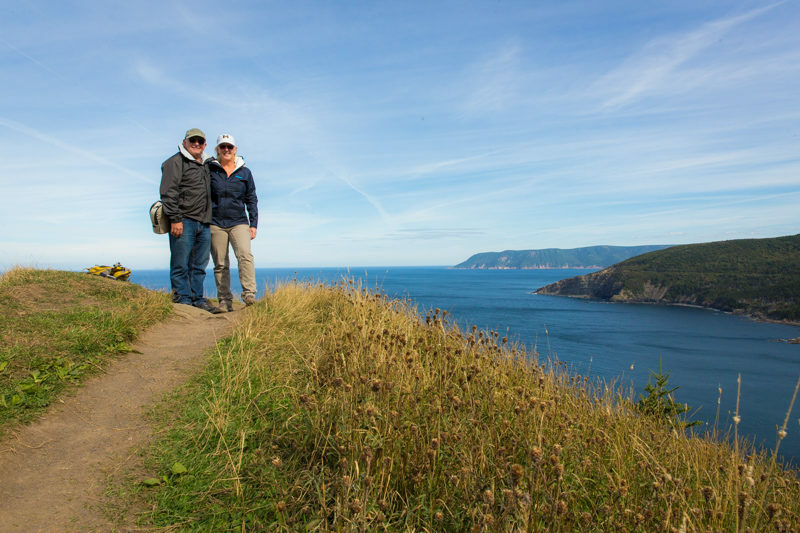 After whale watching we toured the island via driving and hiking. It is a very small fishing island with one small diner, general store and a one pump gas station. I’ve got to believe that everybody on the island has somebody in the family that fishes, as there isn’t anything else to do in this remote location. The island’s coastline was interesting. Rocks were not round, but more square. 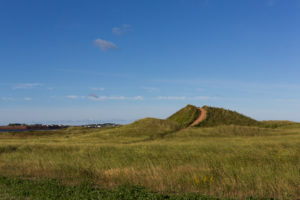 There are pretty prairies leading up to the rocks with hiking trails throughout them. Whales and seals were within viewing distance from the shore. All in all, we had a great day on the island. 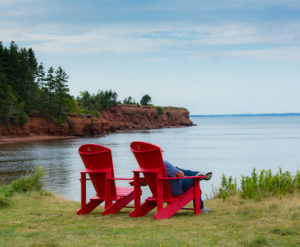 We have seen an adaptation of the next picture quite frequently throughout Nova Scotia. 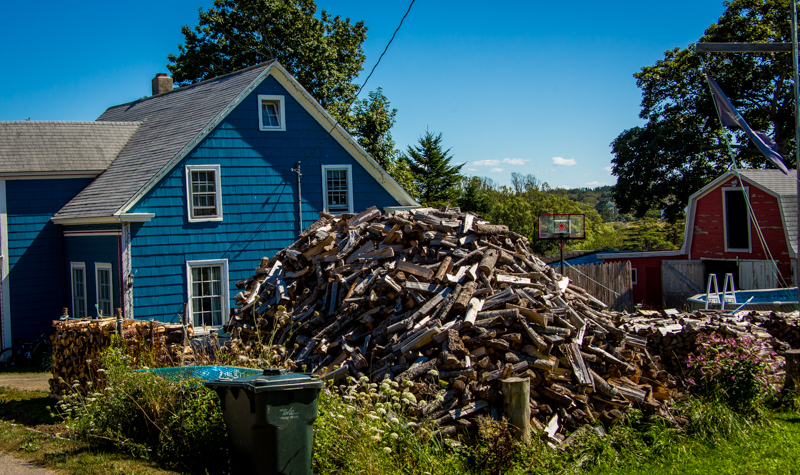 We are consistently amazed at how much wood people stack up for the winter months. It must be their primary way of heating their home. 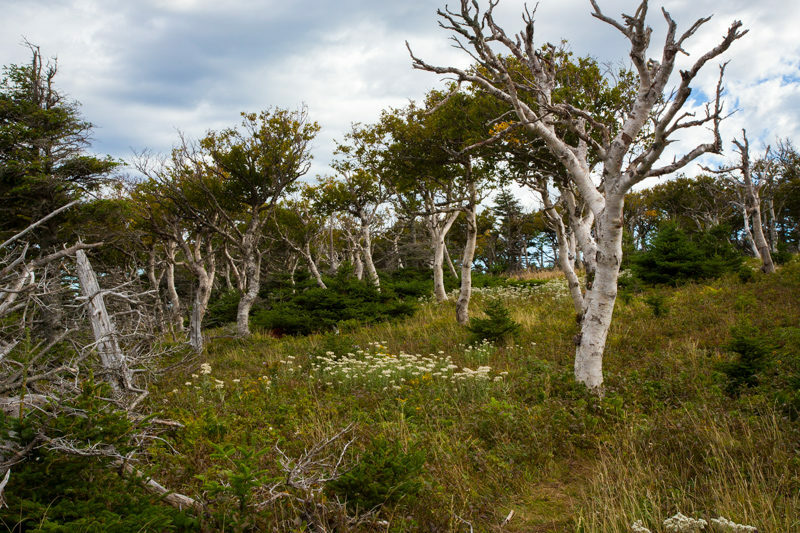 Generally, the wood is organized in long and high rows beside the homes. At times, the height of the wood seems to align with the roof line of the house. If you look closely at the picture you will see 3-4 large piles for this home. 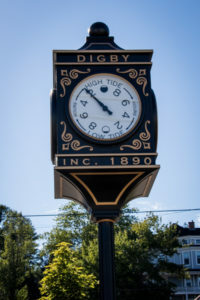 During our stay we also visited Digby. It was a hazy/foggy day when we visited so we didn’t see much. 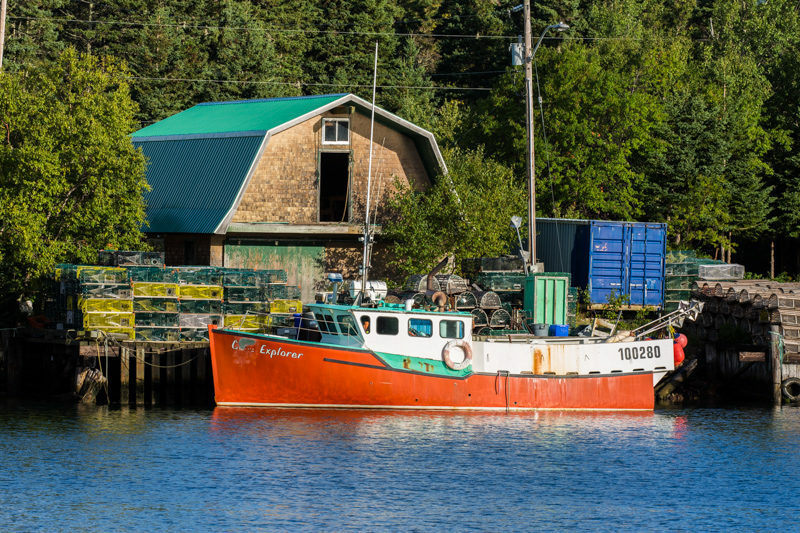 I was able to get a few pictures of the fishing boats along the dock and pulling into port though. One other day trip we did was over to Kejimkjukik National Park for a little hiking. We only hiked a couple short trails, as we arrived late. The trails were uneventful. We had planned to return to do longer hikes, but never made it back. 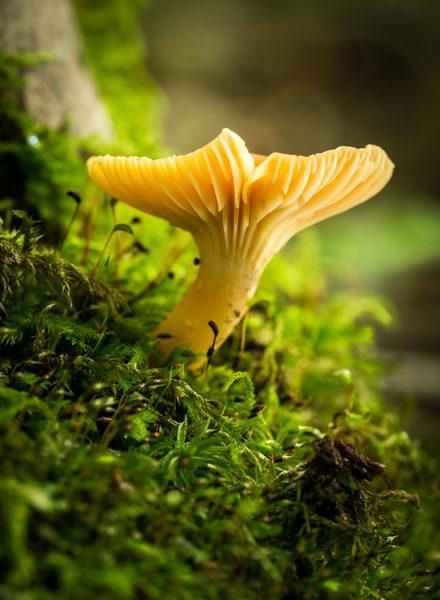 Here are a few interesting pictures from the hike. As you can see, the trees are just starting to turn. Very few of them though. A few final pictures from The Cove Campground. Sunset was very nice one evening and I was able to play with my 100mm Macro lens. 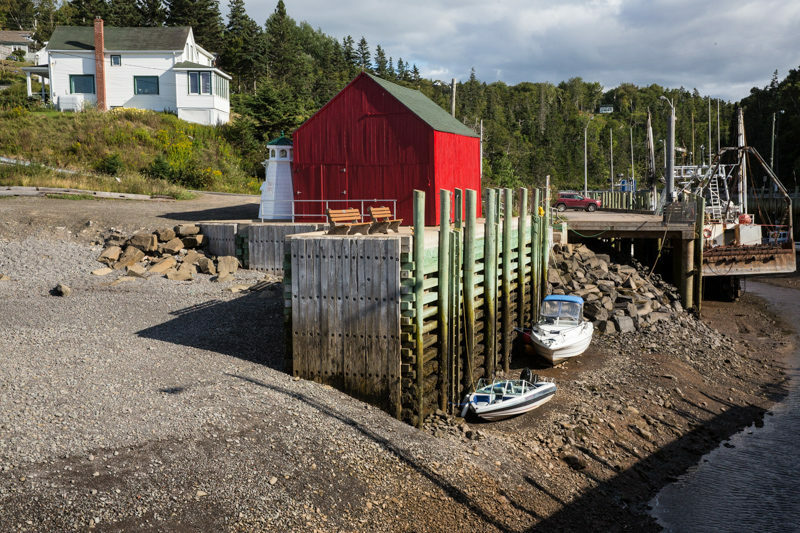 Our next stop is Lunenburg, Nova Scotia. It will be our first stay on the Eastern side of the Province. 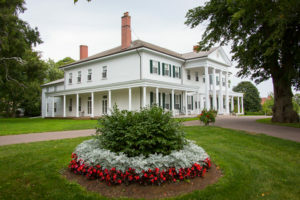 Sep. 1: We arrived at our first Nova Scotia campground, Highbury Gardens in Wolfville, late afternoon. The campground is pretty small, especially when you compare it to where we stayed at on PEI. It is also fairly wooded so there will be no TV for the next 5 days. I’m quite happy, while Charlie is trying to cope. 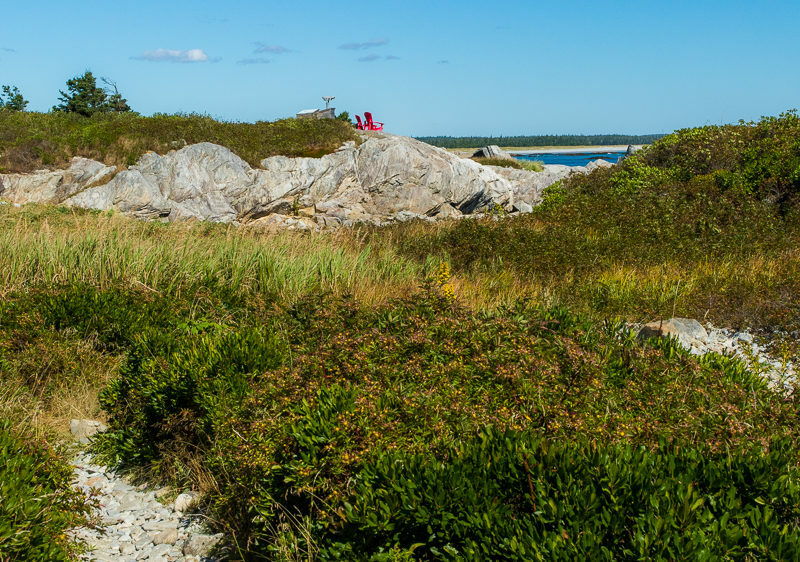 We were originally going to spend the Labor Day Weekend over at King Neptune campground, near Peggy’s Cove. 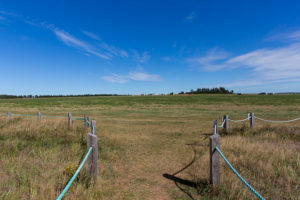 However, in speaking with some Nova Scotians while on PEI we learned that we probably wouldn’t care for that CG so we made a last minute change and went to Highbury. We were lucky to get in as it was packed for the holiday. We were given a nice site (#22) near the back of the campground. Our backyard was private and quiet. It was very nice. 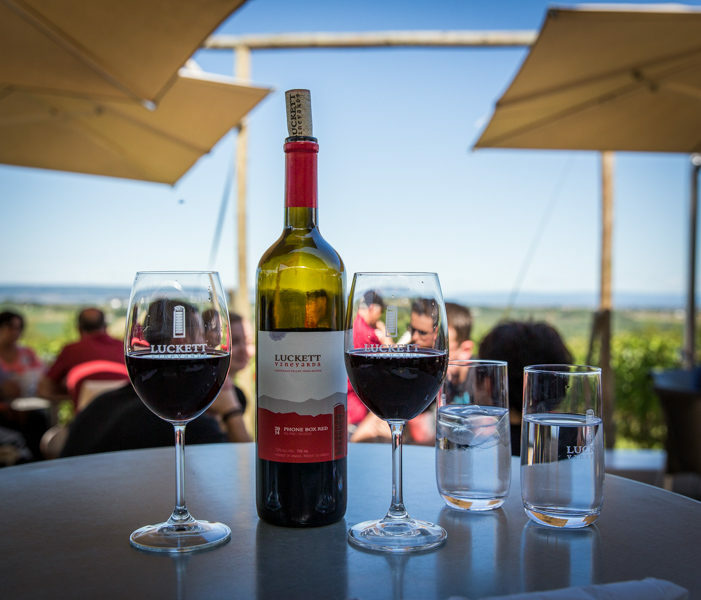 Once we got the RV parked and hooked up we headed over to a nearby winery. I found a brochure for Gaspereau Vineyards in the campground office. Attached to the brochure was a coupon for 2 glasses of wine and a cheese platter. That sounded like a great deal, and it was just 10 minutes away. We tried their Gina’s Red Blend. It was pretty good. Their Tawny Port was also good so we purchased a bottle of that. Once we got back to the campground we put together a bonfire and cooked up some filet mignons for dinner. We then had a peaceful night outside playing card games. It was our first ‘Camping’ experience, LOL. I don’t recall having previously just chilled with card games by the campfire. We’ve had so much wind and rain on our trip. Sep. 2: We awoke to gray skies and chilly weather. Apparently they’ve had a drought in Nova Scotia this summer, with blue skies every day. I think the gray skies are following us! 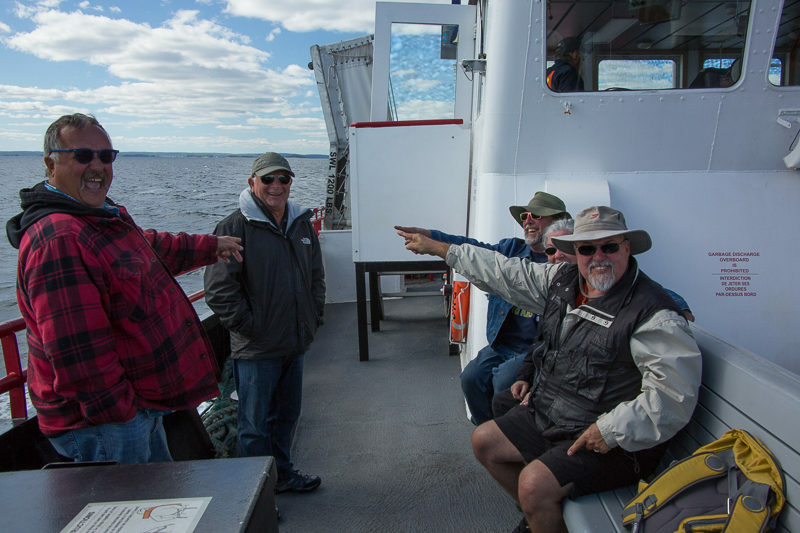 We grabbed our jackets and headed out to tour the area. 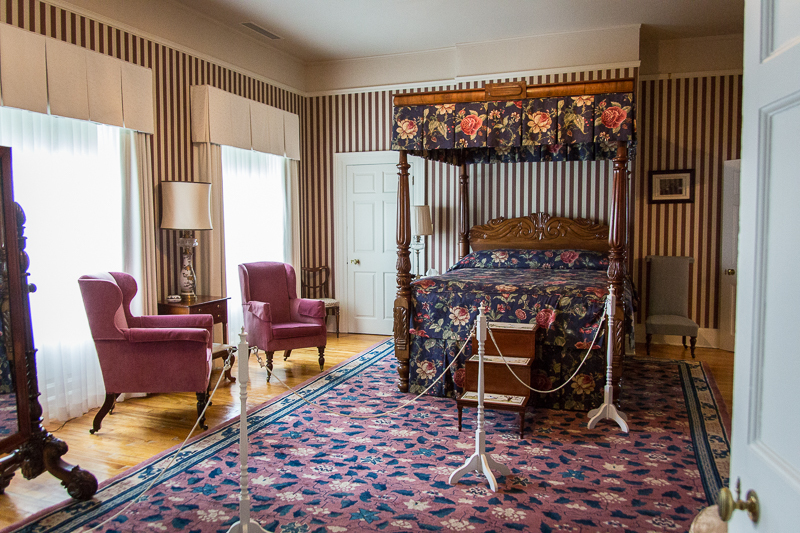 Our first stop was at the Grand-Pre National Historic Site. We learned a great deal about the Acadians. In short, they were French settlers from the western part of central France who settled in this area between 1682 and 1755. In 1755 the local British authorities began forcibly deporting the Acadians, due to their French heritage and unwillingness to take allegiance with the British Military. The deportation went on for 7 years. Families were separated and many deaths occurred while they were in transit. It was quite tragic. Unfortunately, the story sounds a bit like what still happens today in some parts of the world. 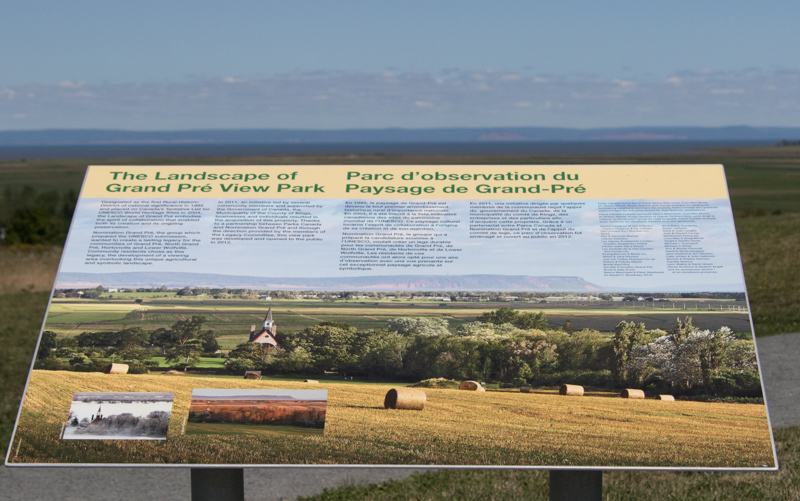 Grand Pré was designated as a UNESCO World Heritage Site in 2012 for its beauty and Acadian heritage. The area is very pretty. 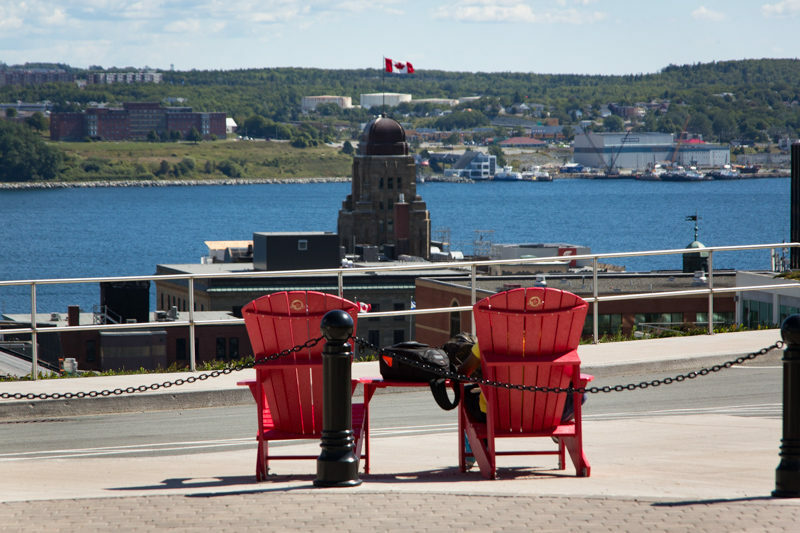 The Canada Parks has designated a very nice lookout point where you can sit and enjoy the views of Grand Pré. 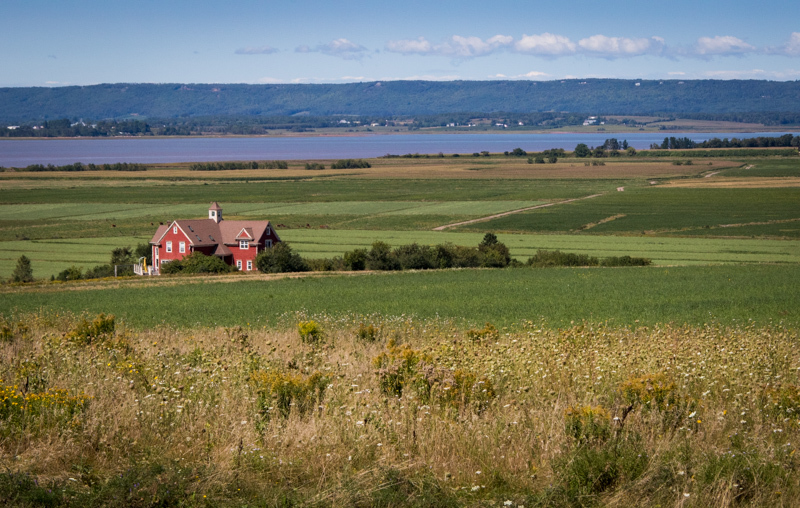 We are staying in the middle of Annapolis Valley, on the Bay of Fundy. 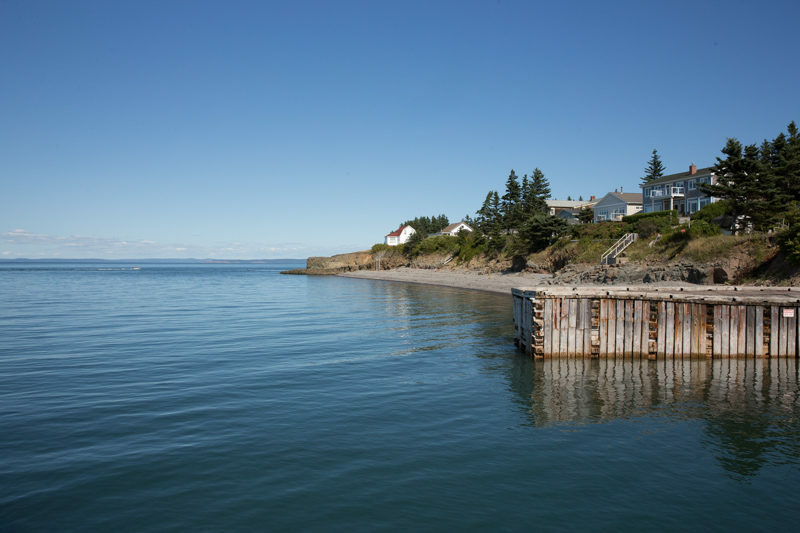 This area is known for drastic changes in water levels between low and high tides. The highest rise at high tide has been noted as being 47.5 ft. At this time of the year the delta between low and high tide is around 30ft. 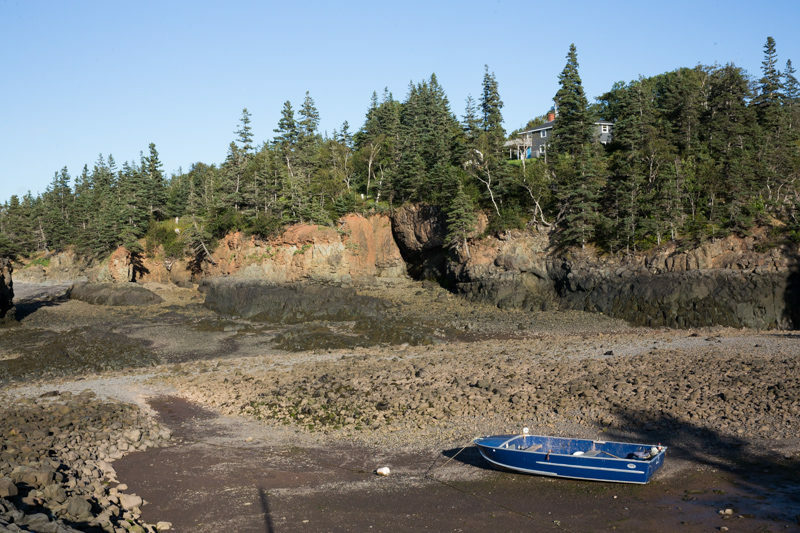 We were told that a good place to see the tidal range was at Halls Harbour so we took an afternoon drive over there to see it at low tide. We then went back a couple days later during high tide. 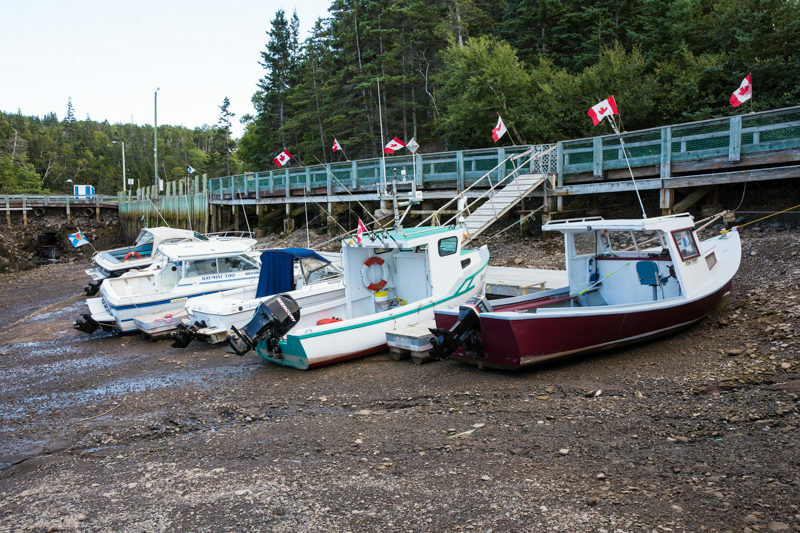 It is weird to see the boats resting on the earth at low tide. At high tide they are right back up where they belong. 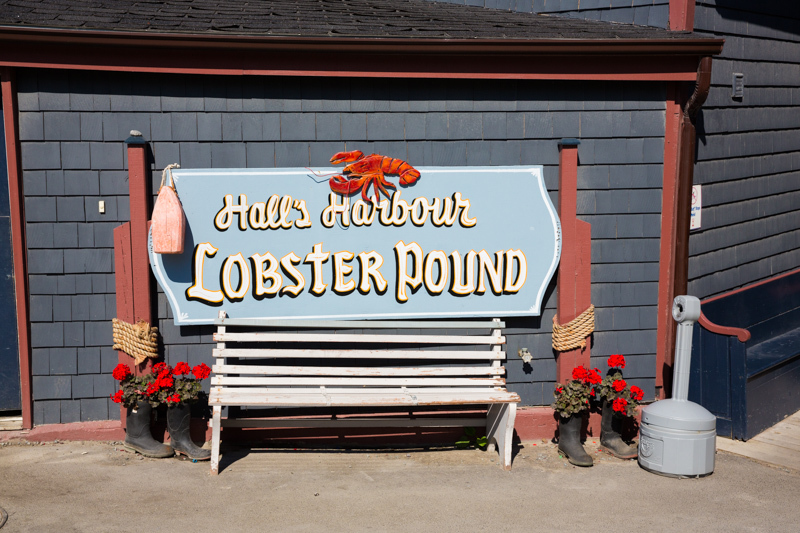 While enjoying the tidal view, we had dinner at Hall’s Harbour Lobster Pound. 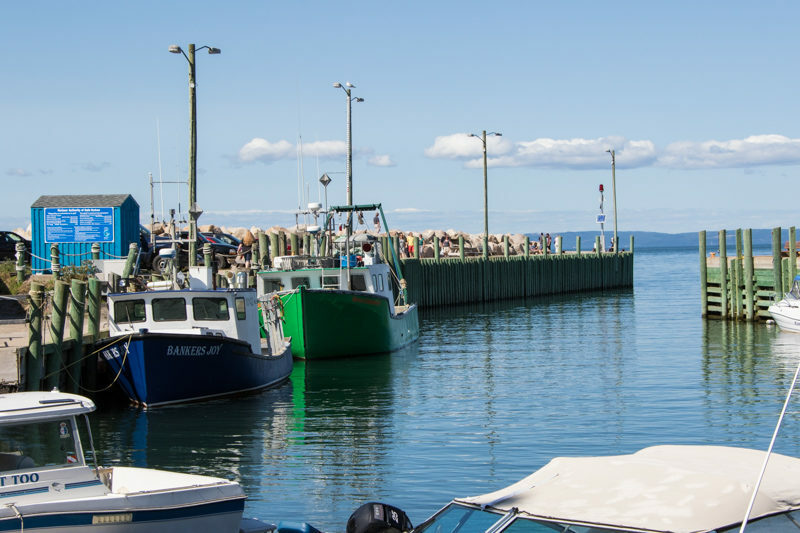 We also visited Baxters Harbour. It turned out not to be a harbor at all. However, there were some nice views from the road and with the low tide we could see some pretty interesting rock formations, along with another boat sitting on the ocean floor. Sep.3: The next day we awoke to beautiful blue skies and temps in the 60s. We drove an hour, over to Halifax. Our first stop was to the Citadel. 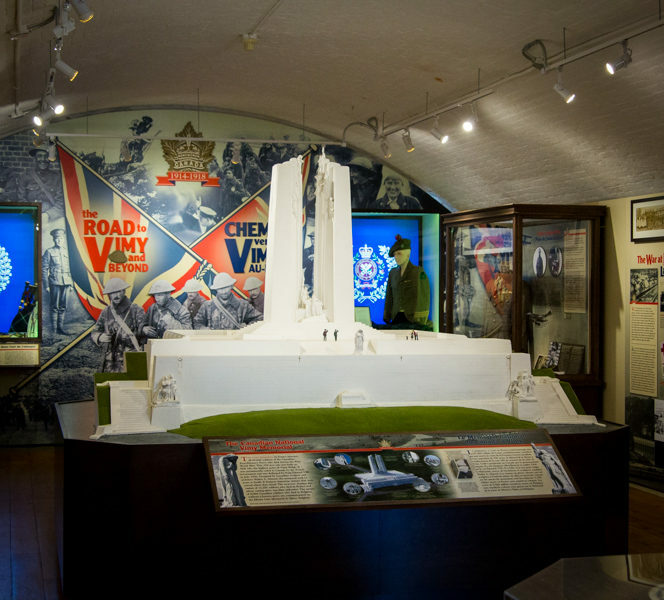 They have a spectacular museum inside which covers war history very well. It was the best I have seen. 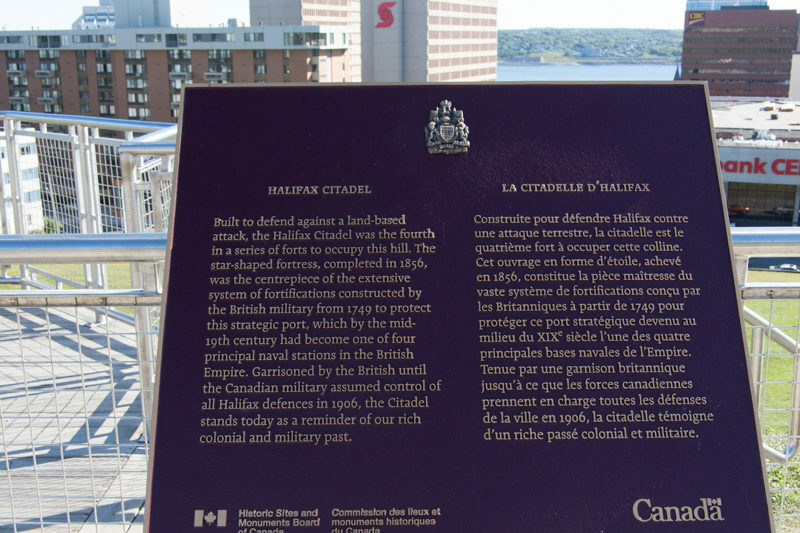 We learned that on the morning of December 6, 1917 there was an explosion on the Halifax harbor. 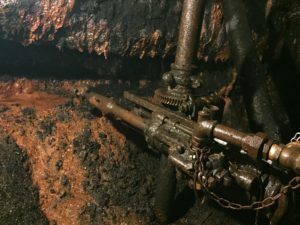 The SS Mont Blanc, a French cargo ship laden with high explosives, collided with the Norwegian vessel SS Imo. The explosion was so severe it killed 1,600 people instantly and injured another 9,000. All structures within a 2,600 ft radius were obliterated. It was the largest explosion recorded prior to the Atomic Bomb. 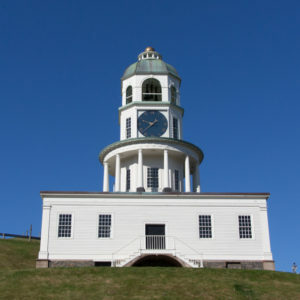 In front of the Citadel is this clock tower from 1803. Now, that’s a long time to be keeping time! We had lunch down on the wharf and then visited the library. Yes, the library. I wanted to see it, as it was built to reflect books stacked upon each other. They also offer free wi-fi, which is important when you can rarely find a good connection. 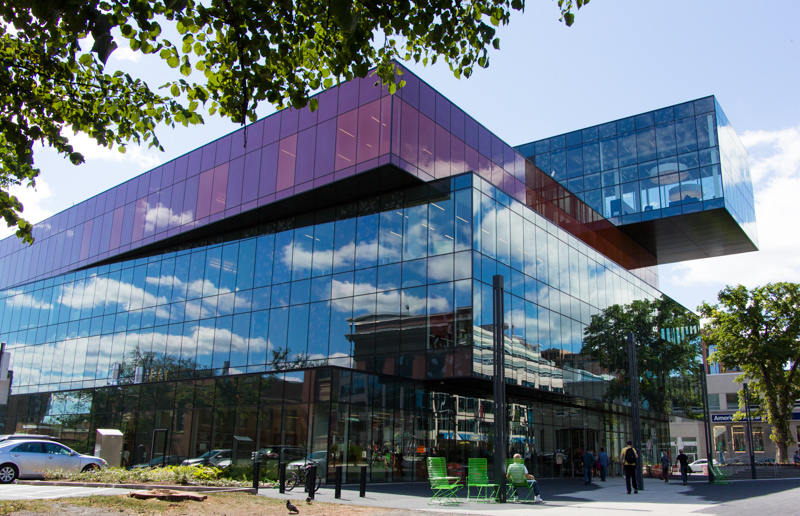 The inside of the library is just as spectacular as the outside. I’d spend lots of time at this library if it was near me. It is like a Barnes and Nobles on steroids. We then took a drive over to Peggy’s Cove. It was about an hours drive and on the way we passed many beautiful lakes set back in thick woods. 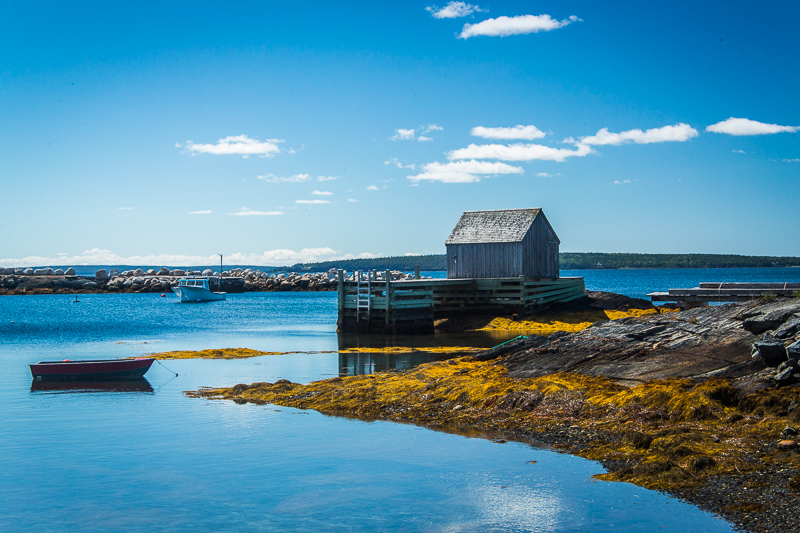 Peggy’s Cove is infamous for its landscape and lighthouse. 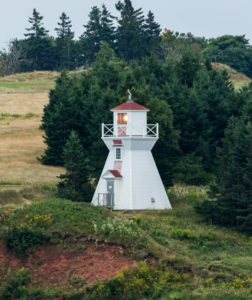 The lighthouse was built in 1915 and is believed to be Canada’s most photographed lighthouse. 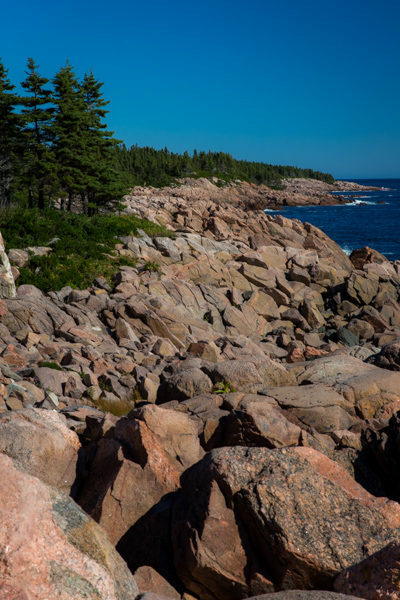 The landscape is comprised of granite rocks. Houses are perched along these rocks. It is quite a sight to see. I think only a few people live in Peggy’s Cove. Quite a contrast to the thousands and thousands of people that visit it. There are a few art shops along the narrow road that takes you to the lighthouse. One in particular was quite interesting. 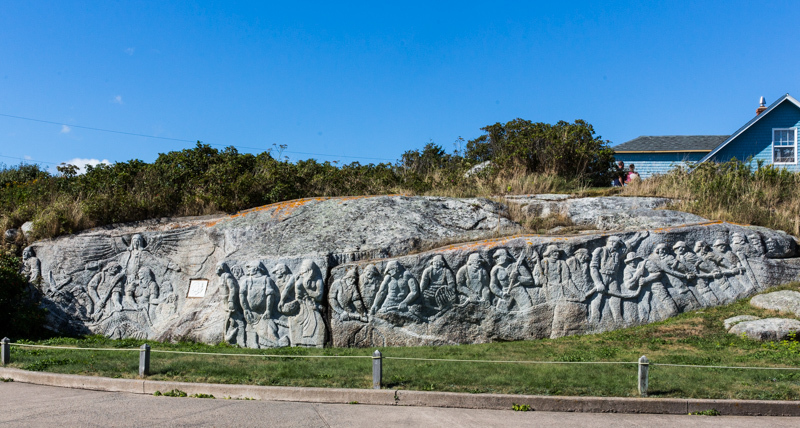 A resident artist sculpted a work of art in the granite wall beside his home. 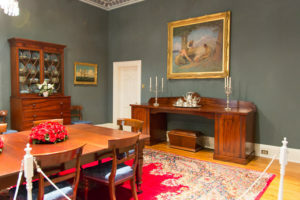 The artist, deGarthe, began in 1977 at the age of 70. Expand the picture below for more details. The lighthouse was surrounded by hundreds of people when we were there. We took in the sights, climbed on some of the rocks and then got back on the road with hopes of finding colorful and quite fishing villages. 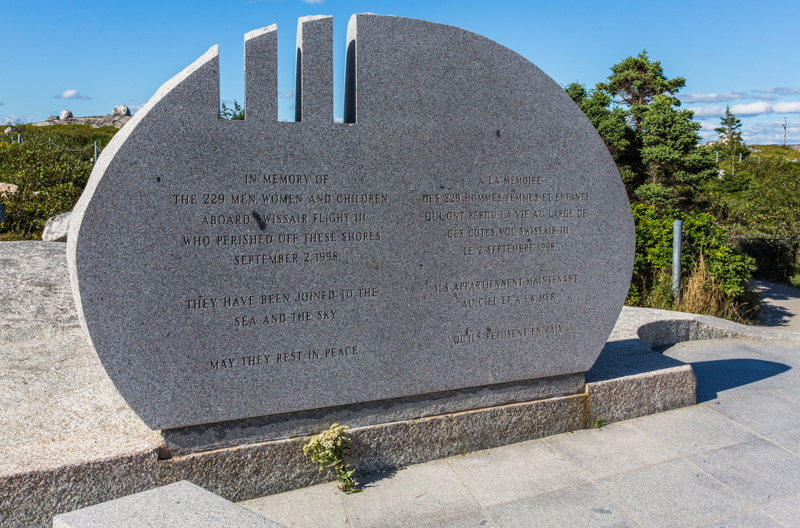 Just as we left Peggy’s Cove we came upon a memorial for those who perished on SwissAir Flight 111 back in September, 1998. 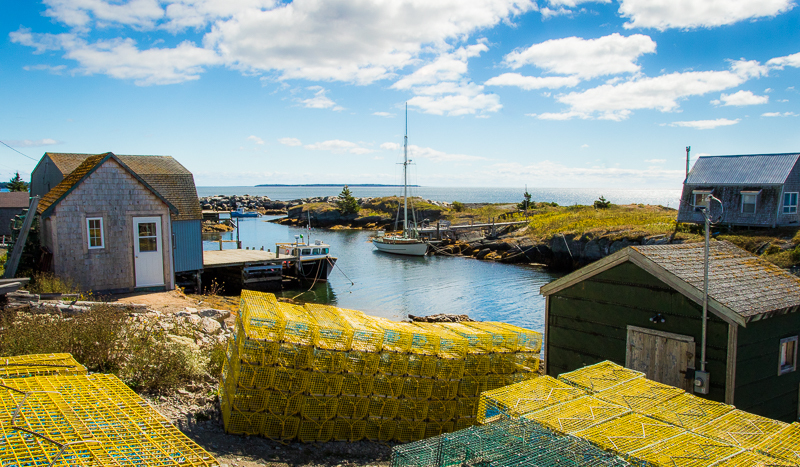 From this vantage point I was able to get a good shot of Peggy’s Cove and Lighthouse. 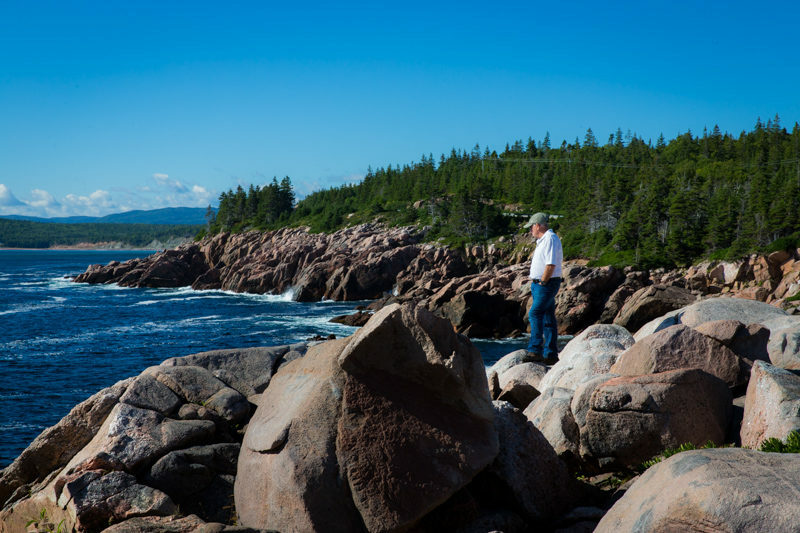 As you can see, there isn’t much there except a lot of granite rocks, but it is a very popular tourist destination. We arrived back at the campground in time for a bonfire and a game of Sequence. Sep. 4: Another beautiful day! 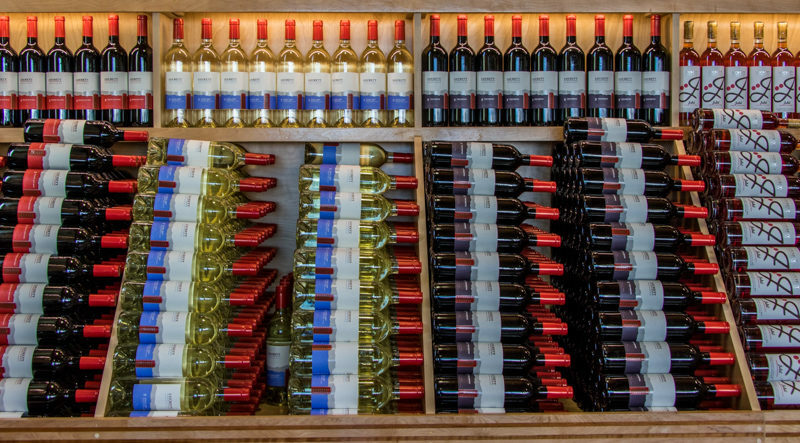 We decided to visit the local wineries. 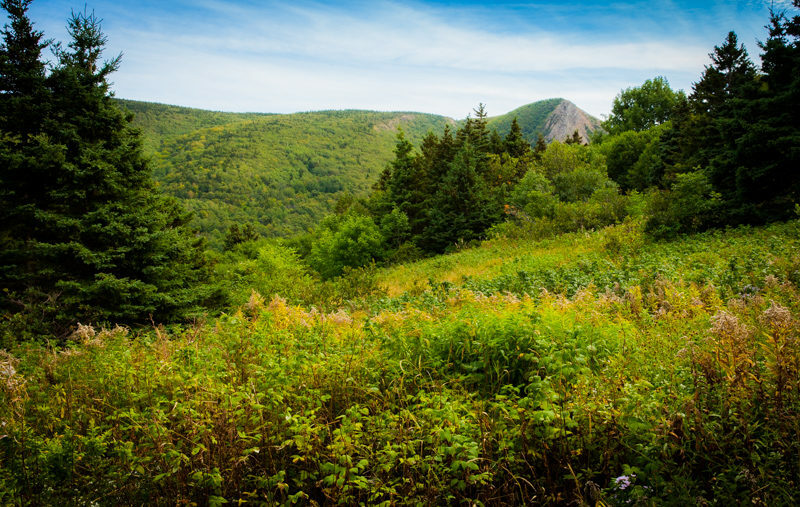 There are six within 10 miles of our campground. 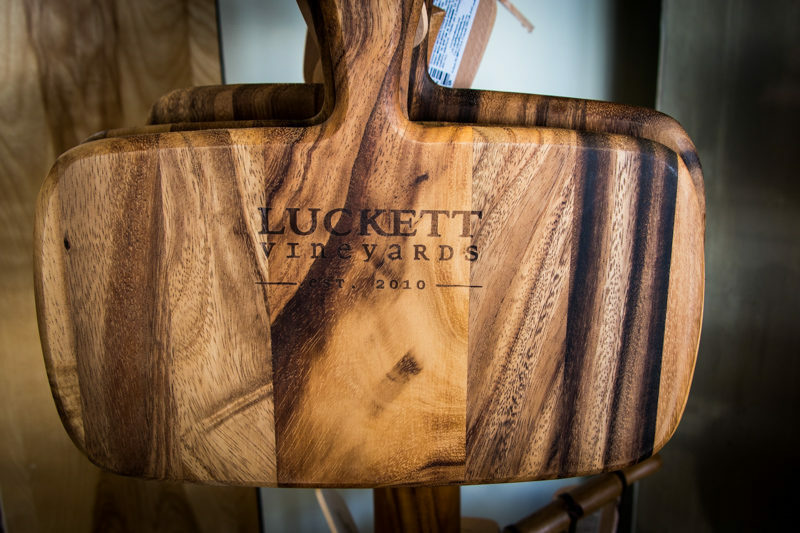 Our absolute favorite was Luckett Vineyards. The views were spectacular. 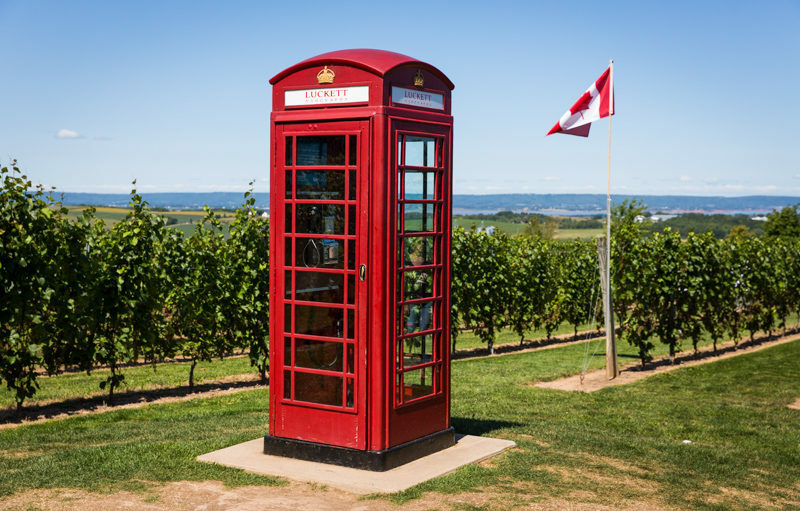 The wine was great and I got to call the USA from the British Style Phone Booth in the middle of the vineyard. I guess having a working phone in the middle of the vineyard sets you apart from the competition. LOL. Everything at this winery was spectacular. 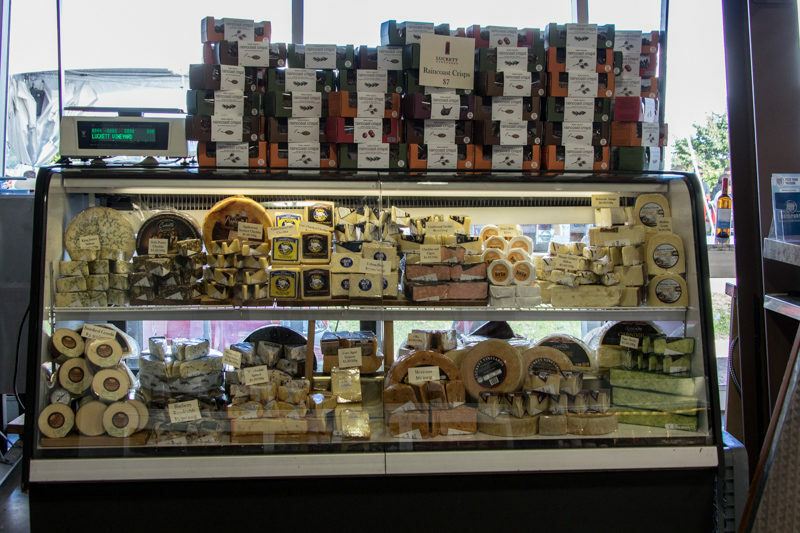 I loved the selection of cheeses, olives, and meats that you could buy to go along with your wine. The other vineyards were very nice as well. 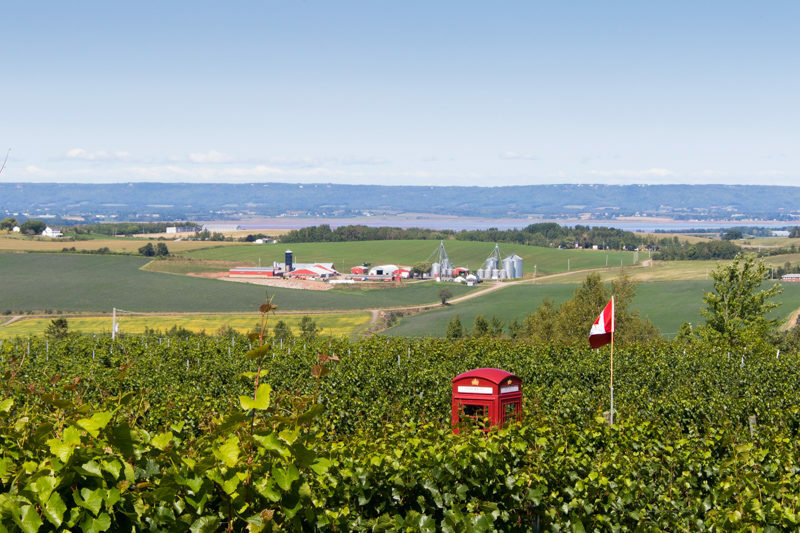 We had fun strolling through the vineyards and taking in the views. 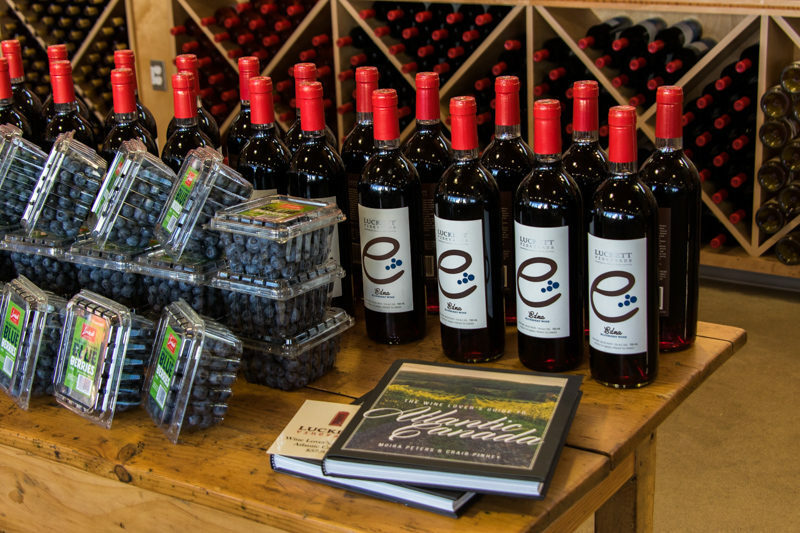 Here are pictures from some other wineries. And pictures of the fabulous grapes. 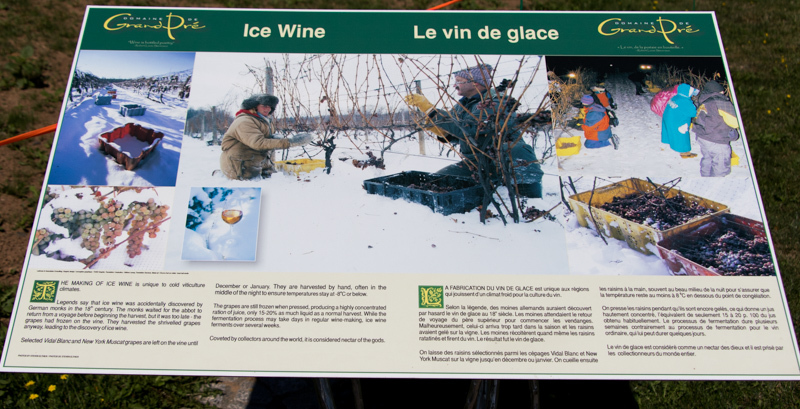 And if you are interested in how they harvest the grapes for ice wine. A picture is worth a thousand words. Burrrrr! Sep. 5: And yet, another beautiful day with temps in the low-mid 70s. 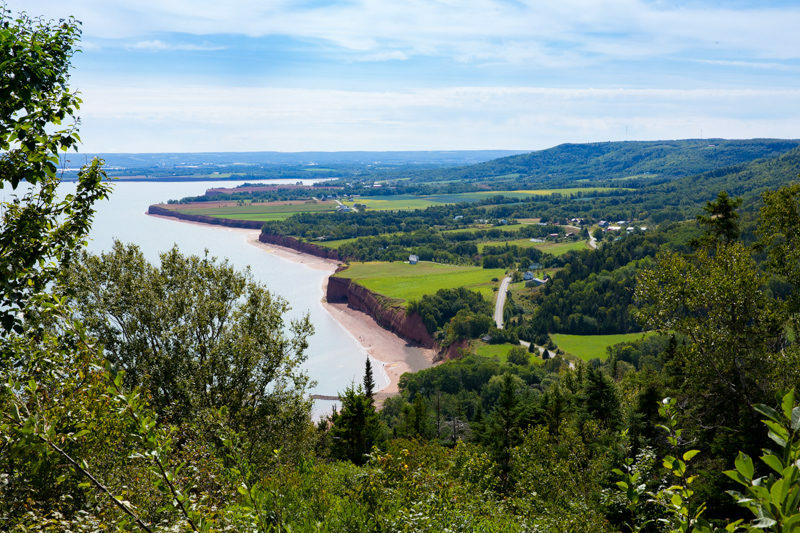 We decided to take advantage of the nice weather and take a 6 mile hike in Blomidon Park. 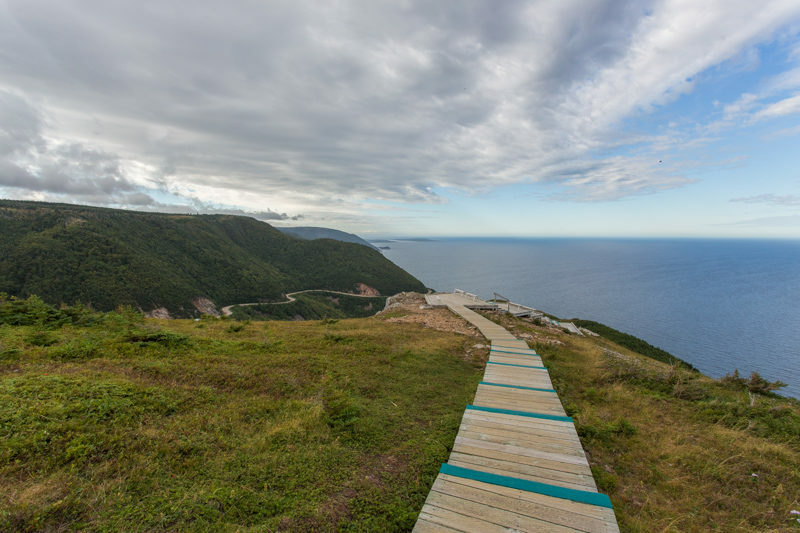 The Jodrey trail is a wooded trail that skirts the sea cliff. Elevation increases 600 ft. The sights were beautiful. This is what the hiking range looks like from ground level. The mountain peak in the background is where we hiked. 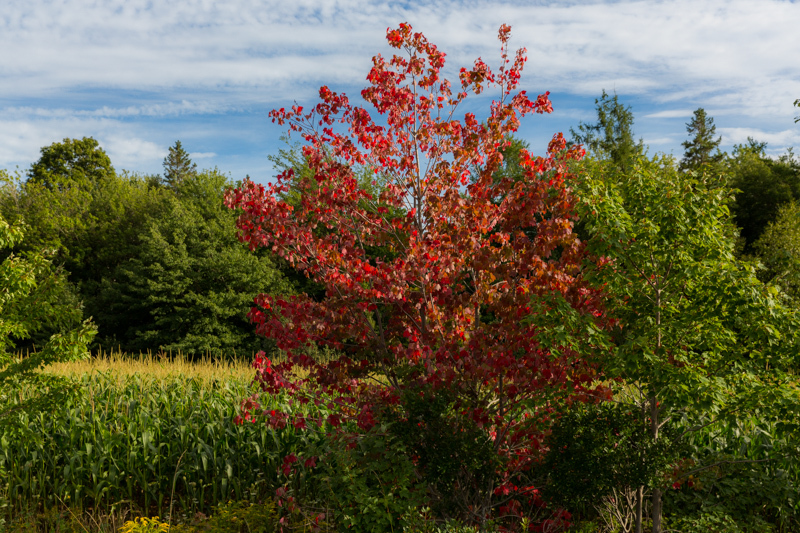 On our drive to the park we passed a few trees that have leaves changing color. There weren’t too many, but enough to get me excited at the prospect of landscapes covered in deep red and orange colors! This particular tree has already changed completely. 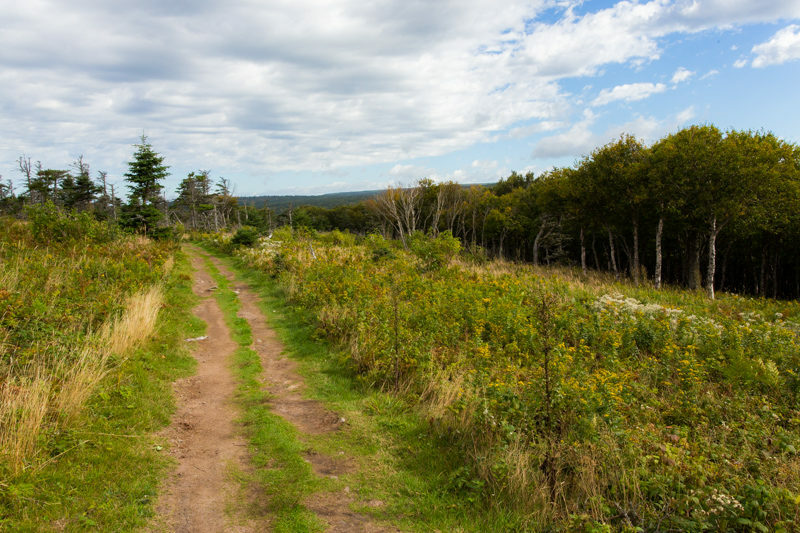 The hike was the end to our stay in the upper part of Annapolis Valley. 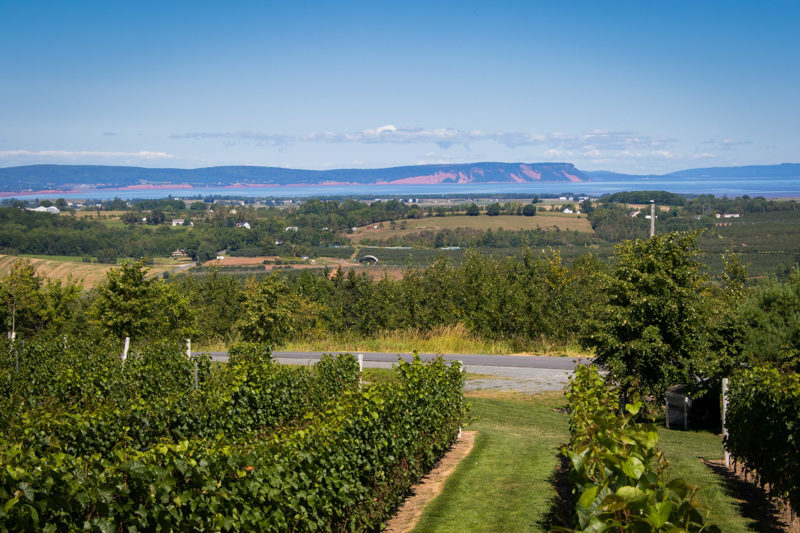 Our next stop is at the lower end of the Valley, in Annapolis Royal. We left Quebec for PEI August 24th. 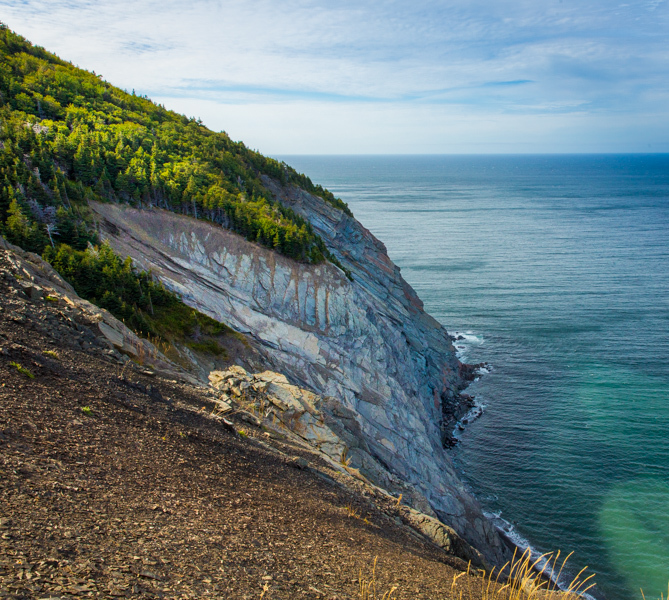 We decided to take the long route and go through St. John, New Brunswick (NB) to see the Reversing Falls and then to take a driving tour through the Fundy National Park. The Reversing Falls is a unique phenomenon created by the collision of the Bay of Fundy and the Saint John River. At low tide the river empties into the bay causing a series of rapids and whirlpools. As tides rise they slow the river current for a brief period called slack tide. We arrived at high tide and there wasn’t much to see. We went to downtown St. John and found it very industrialized. There wasn’t much of anything to see or do. We stayed in a Walmart parking lot, along with about 10 other RVs. Not real exciting. 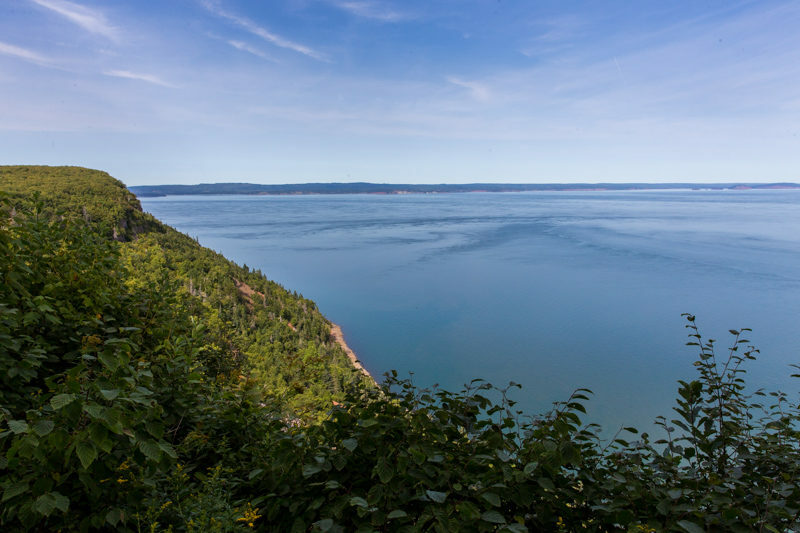 Fortunately, prior to heading down to the Fundy National Park with the RV and Jeep in tow, we looked at some reviews and found that the Park roads had declined so badly over the years that you almost needed an off-road vehicle to drive on them. 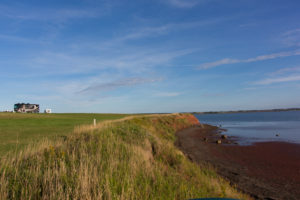 It would not have been a good scenario to try it with a 40 ft RV so we headed straight for PEI, frustrated that we had taken the time to visit St. John. The drive from St. John to PEI was exceptionally windy, the worst we had been in, and the roads were quite bumpy. They seem to repair potholes with patches upon patches, leading to very uneven surfaces. After much bouncing around we were happy to get to the PEI Bridge. 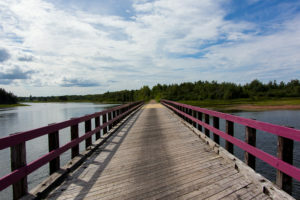 The bridge joining New Brunswick to Prince Edward Island is an amazing sight to see. It is 8 miles long. I always compare bridges to the Mackinaw Bridge in Michigan. This one put the Mackinaw Bridge to shame. 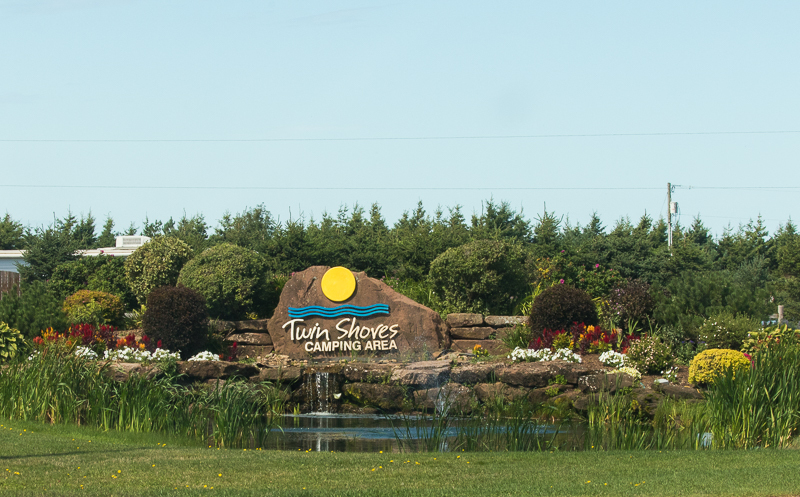 We stayed at Twin Shores Campground while on PEI. The locals jokingly refer to it as the 3rd largest city on the island and believe that the astronauts can see the campfires from space, and for good reason. There are 850 sites at this Campground. I can’t imagine what it is like at the height of the season. We arrived to find it pretty quiet. There was hardly anybody there. The campground is phenomenal. I can see families coming here and never leaving the grounds. 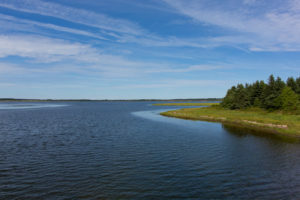 It is exceptionally clean and occupies a very large peninsula surrounded by water. 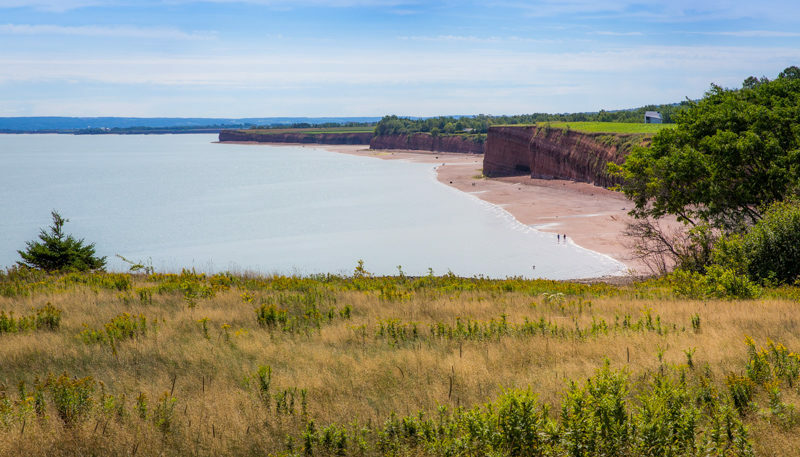 You can walk the gorgeous red sand beaches for hours, stroll along sand dunes, hit balls at the driving range, swim, bike, play shuffleboard, basketball, tennis, etc. 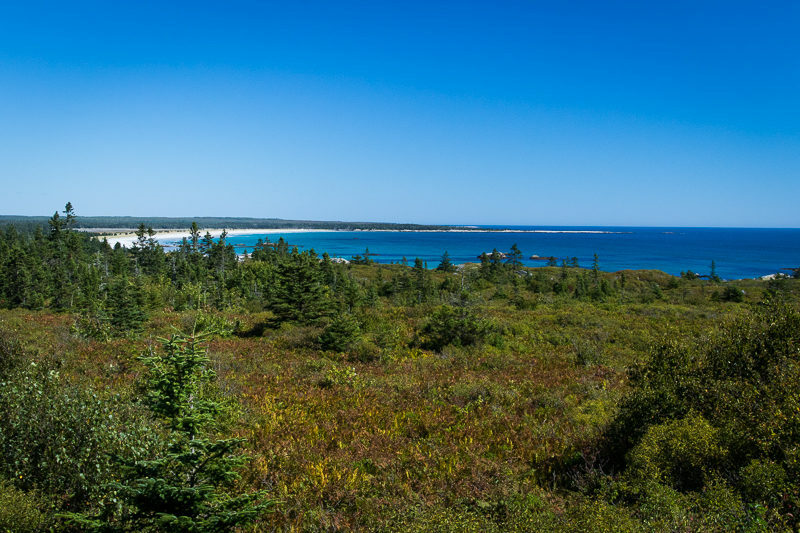 The private beaches accessed via the campground are simply amazing. 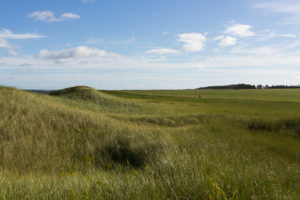 There are also beautiful fields and sand dunes throughout the grounds. You can have some fun posing on the dunes too, like I chose to do. After getting settled we headed out to dinner. 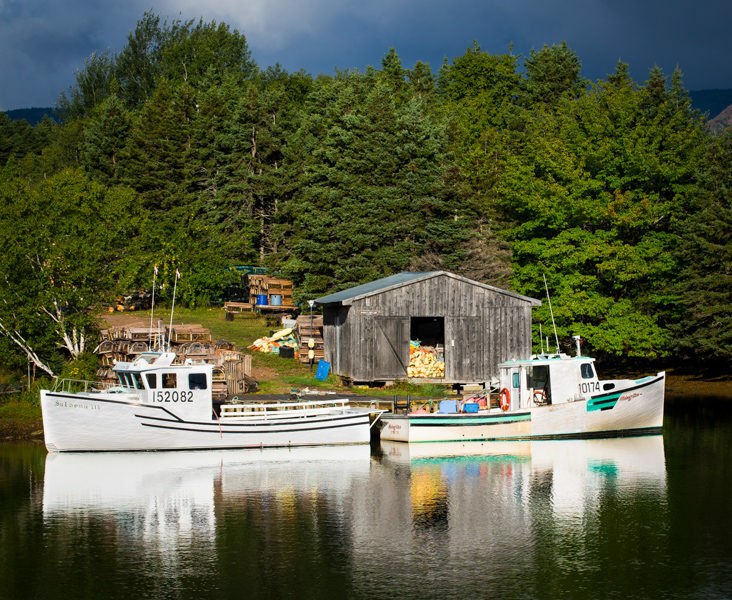 Our intent was to head over to New Glasgow for their famous New Glasgow Lobster Supper. However, on the way there we spotted a restaurant on a bay of water. It was late and we were quite hungry so we decided to stop there. It was still windy, but we chose to sit out on the back porch anyway. It had a nice view. 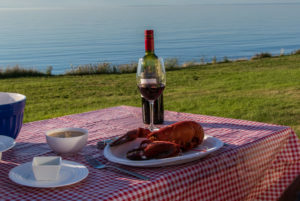 PEI is known for a number of foods including mussels, lobster, oysters and potatoes. I didn’t know about the potatoes until we arrived and saw the Cavendish farms. We decided to get some mussels and potato skins to celebrate our arrival on the island. While chatting with our waitress we learned that she was heading to Michigan the following week, which is where I am from. Turns out, she and her husband just sold one of their cows for $212,000 and they were going to travel to various shows to visit it. After laughing a bit we asked what made a cow so special that it would sell for that kind of price. Was it the quality of meat that was expected, or the milk? She said no. She said it had nice legs and a good udder. LOL. 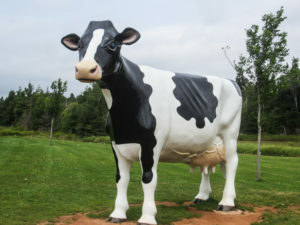 I guess it was similar to this cow that we saw at the Creamery in Charlottetown. 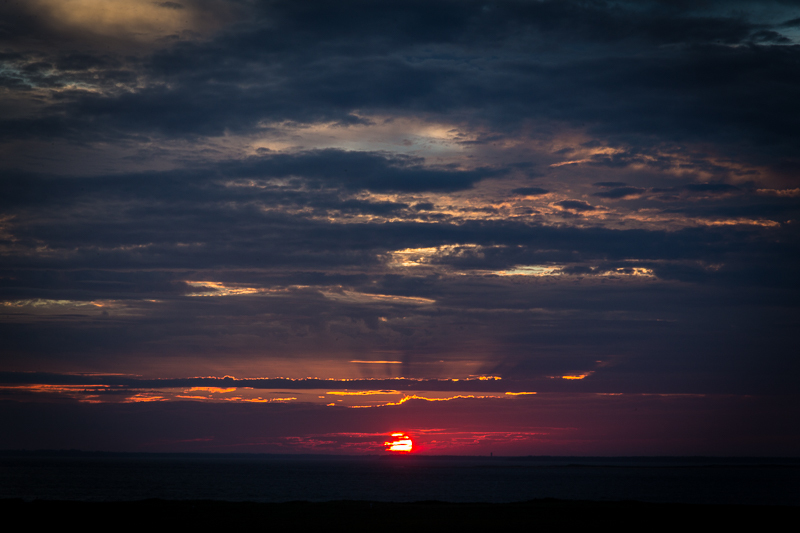 We came back to a spectacular sunset, seen from the comfort of our RV Backyard. 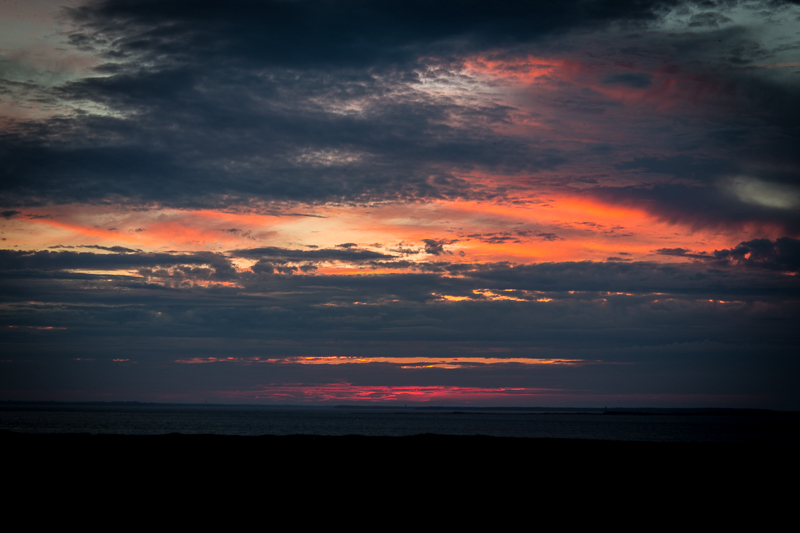 The sunsets offered deep colors of pink, orange and red. Absolutely spectacular! It was still pretty windy so getting pictures was a little challenging. I had the camera on a tripod and had to put pressure on the tripod to hold it still. Our first night at the CG with a spectacular sunset. 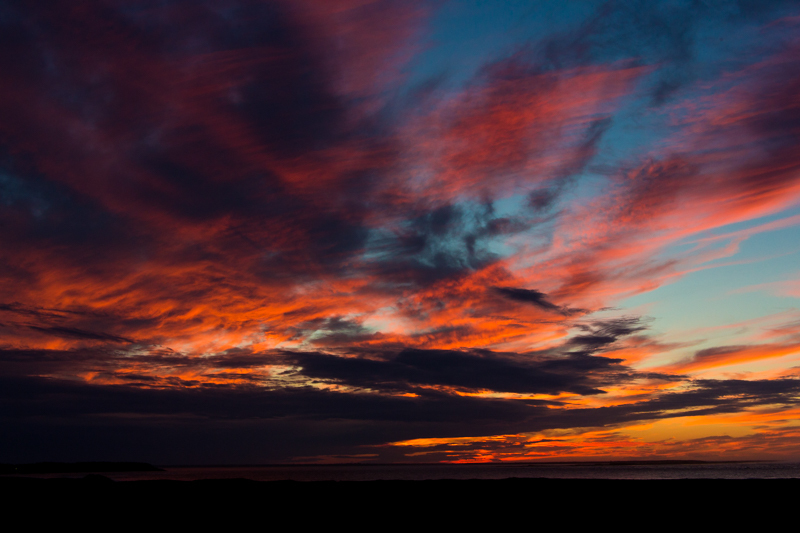 We were blessed with another sunset the night before we left PEI. The colors were unbelievable. It remained windy all night, with rain falling off and on. We awoke to dry, but gray skies. 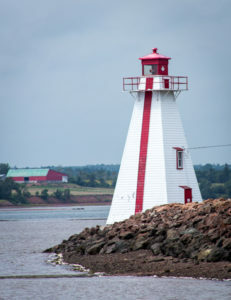 We decided to do a tour of Charlottetown and take a drive along the Southern Central Coastline. In Charlottetown we stopped by Cows Creamery in hopes of getting a tour of how they make ice cream. The tour ended up being comprised of videos. It was quite uneventful, but informative. 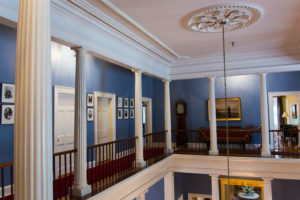 We then stopped by the Province House for a tour, only to find that it was shut down due to renovations. Frustrating. The weather was turning nice so we headed over to Victoria Park. 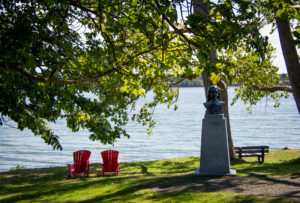 It is a small park on the waterfront of Charlottetown. We got our bikes out and took a ride. 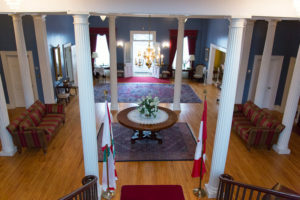 We ended up at the Lieutenant Governor’s house. 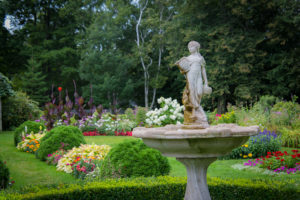 The gardens were lovely so we strolled through them and then joined a tour to see the interior of the house. Now, I LOVE Prince William and Duchess Kate and therefore, was absolutely thrilled to find out that they had visited this house back in 2011, on their honeymoon tour. I so wanted to jump on the bed they had slept in. LOL. Speaking of that bed, the mattresses are very high off the ground. The tour guide showed us that a secret panel can be removed from one of the bedframe poles and then you can adjust the firmness of the mattress. This is where, supposedly, the phrase ‘sleep tight’ came from. In this next picture you can read what was purchased for the new house and the cost of the items. They were very detailed and kept good records back in the day. After Charlottetown, we toured the coastline over to Victoria. 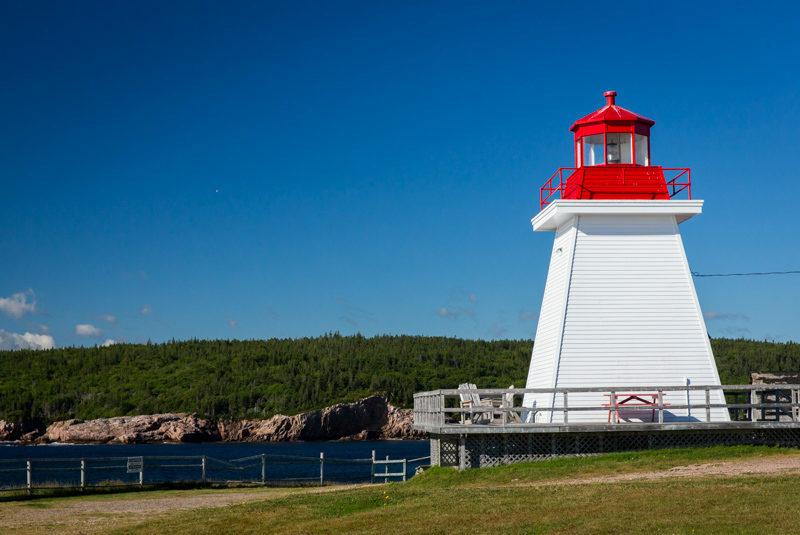 We stopped along the way to see some lighthouses and visit some of the National Historic Sites. 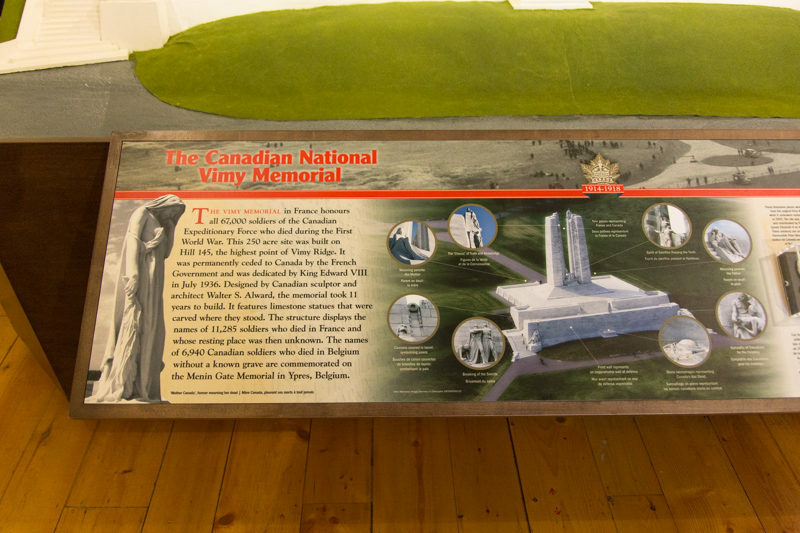 Canada does something neat in each of their parks and at their Historic Sites. They put out two red chairs. It is a nice touch. You’ll see them throughout some of my pictures. 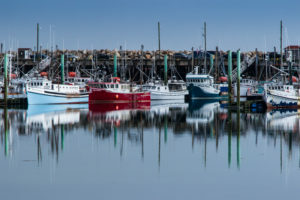 Victoria is a quaint village on the water with historic homes, small shops spread throughout the neighborhood, a lighthouse, and popular restaurants on the wharf. It was getting late so we headed back to the RV for dinner. 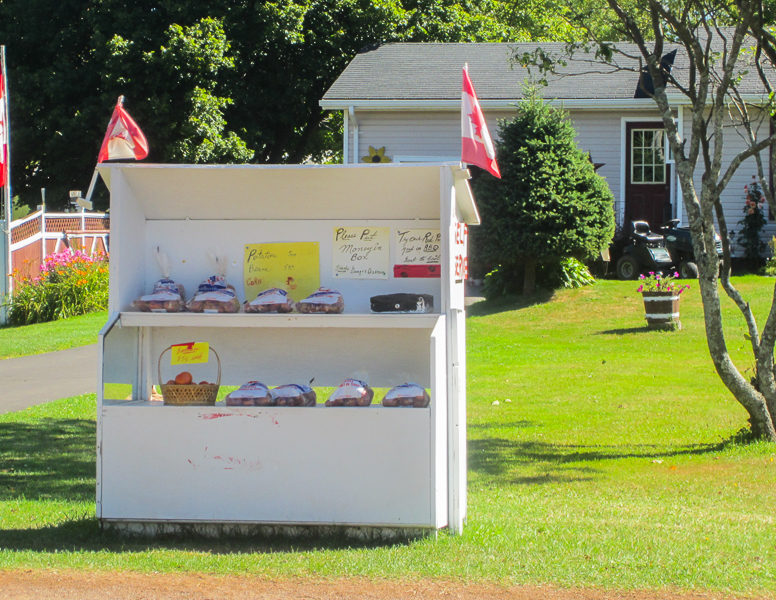 We picked up some PEI New Potatoes and Firewood from various vendor locations on the side of the road. People just put out what they want to sell and a cash box for you to deposit your money in. The Island is absolutely beautiful and pristine. There are farms everywhere. They appear to be growing lots of corn, wheat and potatoes. Every farm, yard, house, etc is well kept and very clean. Lawns are immaculate. 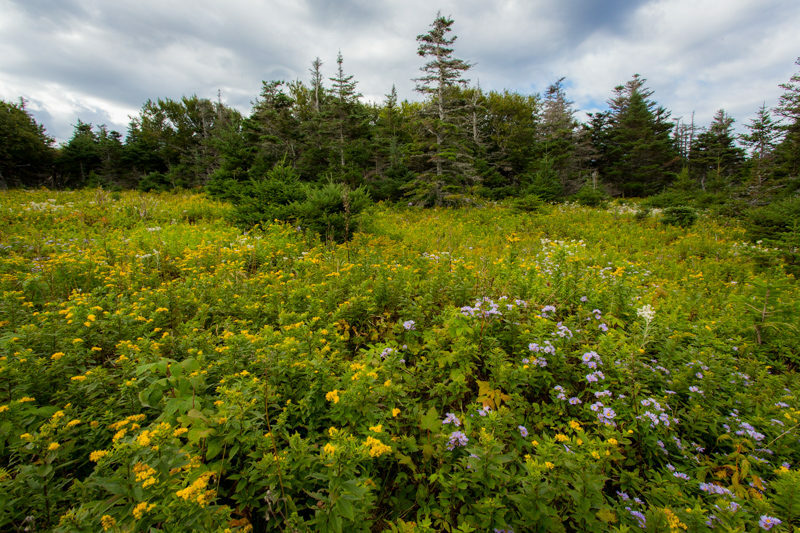 There are fields with colorful wild flowers everywhere you look. 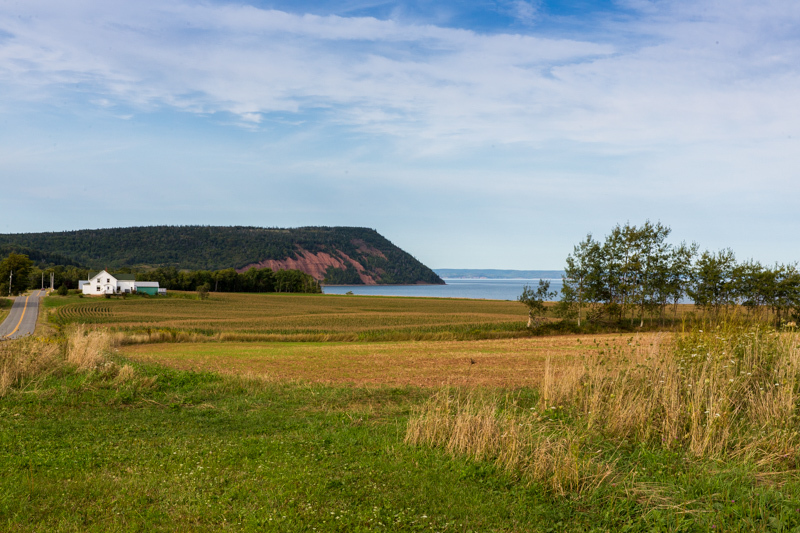 The combination of green grass, colorful wildflowers, tan wheat fields, red barns, colorful boats, and blue water is spectacular. It is simply a beautiful place. We also appreciated that there were few mosquitos and that the air was surprisingly dry. 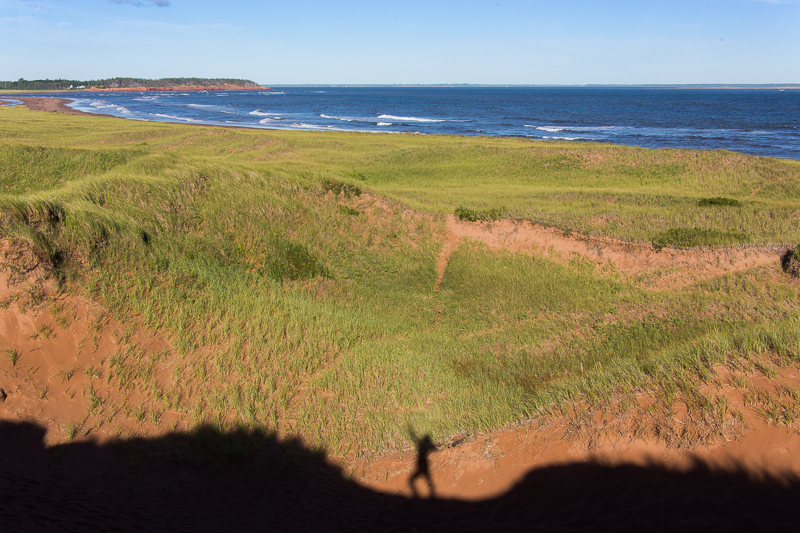 In addition to great food, PEI is also known for L.M. Montgomery’s ‘Anne of Green Gables’ book. Neither Charlie nor I were familiar with the story or author but we decided to take a tour of the historic site. We enjoyed the tour as they do a good job of depicting life in the late 1800s. 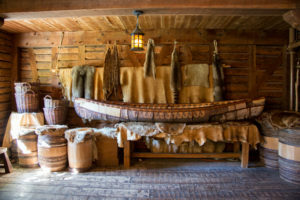 One of the beds in the house was made of rope and straw. 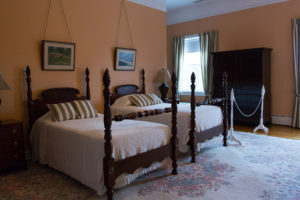 The tour guide noted that whoever slept in that bed had to tighten the ropes each night and check the straw for bugs, hence the phrase “sleep tight and don’t let the bed bugs bite.” At the end of the tour we visited the museum store and purchased the book. 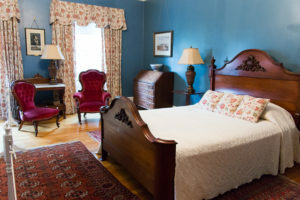 If you are familiar with the story see if you can figure out which character belongs to each bedroom in the pictures. 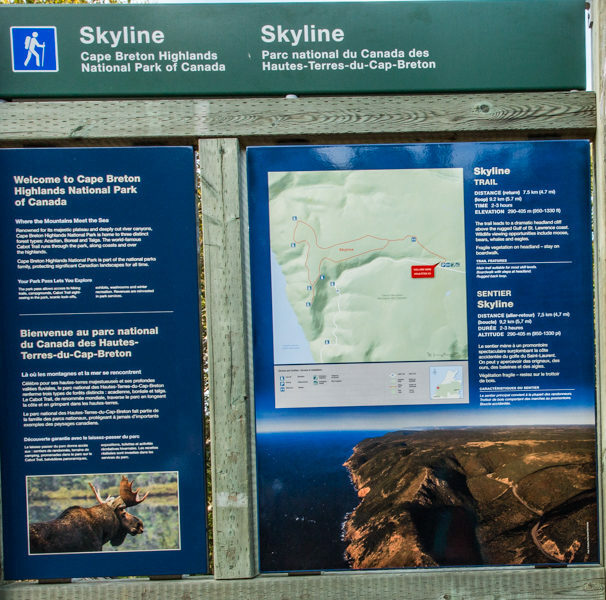 After our tour we decided to check out the Cavendish National Park. The weather was not optimal for outdoor activities, as it was still very windy and gray, with rain threatening to drop at anytime. Regardless, we enjoyed our visit. 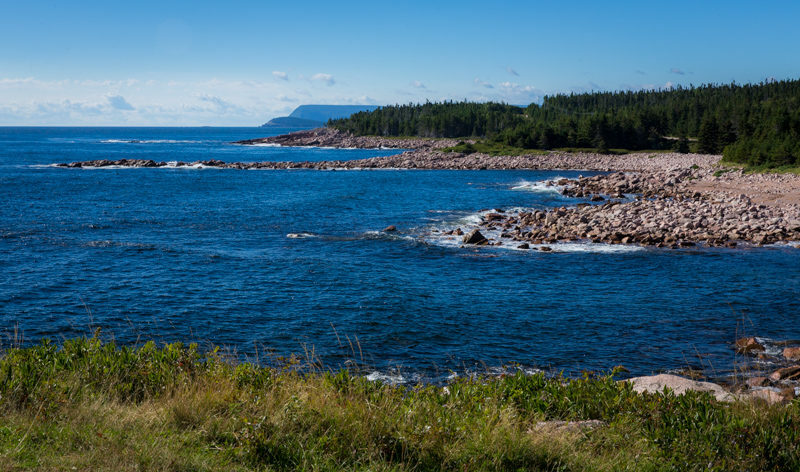 There is a long bike path along the water, beautiful beaches and red rocks. The beach is very similar to the one at the campground. The next day it was finally nice so we headed off to a couple more National Parks. We found the Brackley-Dalvay Park to be pretty, but not spectacular like Cavendish. After driving through that park we drove along the coast, over to Greenwich National Park. We went through many one-stop-sign villages, which were all very clean and quaint. It seems that nearly everybody owns a lot of property, as you rarely find homes close together. Everything is spacious and beautiful. Greenwich Park was really neat to see. We took a nice bike ride along the water and then walked the boardwalk to the sand dunes. The dunes reminded me of being in Michigan. Apparently, there are only a few places where these types of dunes can be found, MI being one of them. After our visit to Greenwich we decided to take a bike ride along the water from St. Peter to Morell. 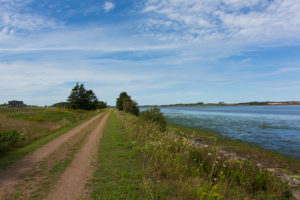 This is along the Confederation Bike Trail, PEI’s Rails-to-Trails system. It was a beautiful ride. 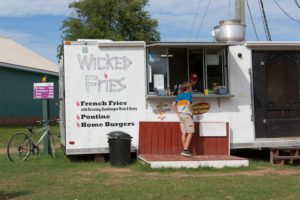 In Morell we rewarded ourselves with some French Fries. What can I say, Fries and Wine are our downfall. 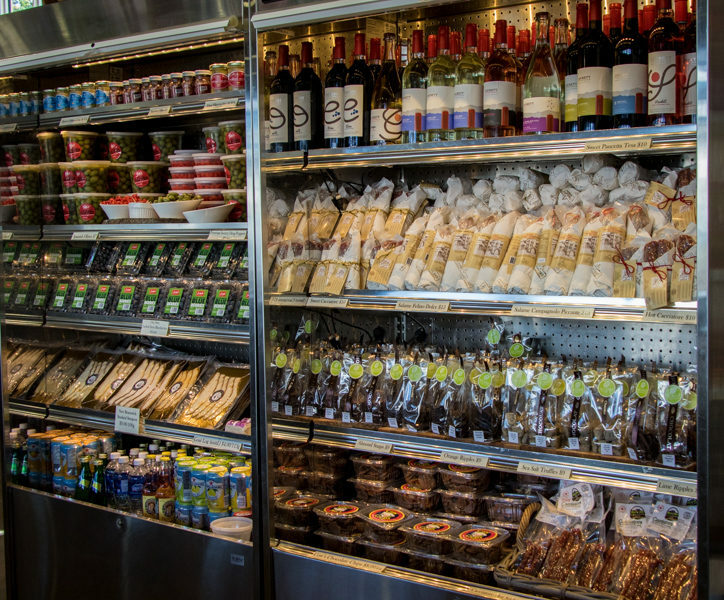 The 13.5 mile roundtrip bike ride helped us rationalize the splurge. However, the fries were so good that Charlie wanted to stop by the stand again on our way back in the car!! I nixed that idea. The weather was nice enough in the evening to have a bonfire. As soon as we were done with the fire though, the rain returned. 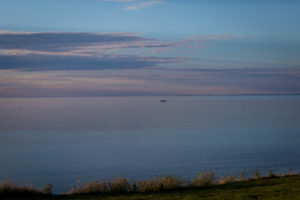 The next day was rainy and dreary so we hung out at the RV and ventured out only to go grocery shopping in Summerside. We appreciated having a down-day to relax. The following day was absolutely gorgeous. These types of days seem to be rare occurrences. It was warm, in the upper 60s, sunny and no wind. We took long walks along the beaches and enjoyed the beautiful views. 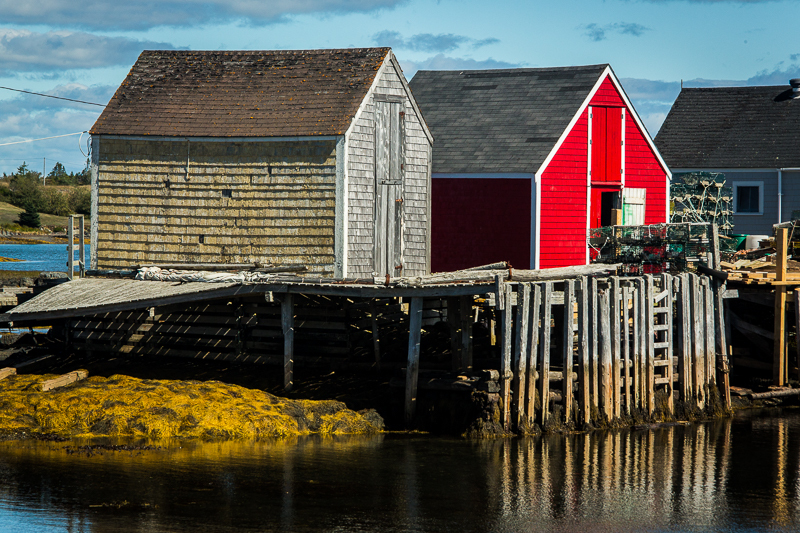 We then took a ride over to French River to capture some pictures of the colorful buildings. On the way back to the campground we stopped by PEI Aqua Farms and purchased mussels at $1.00/lb and scallops. We had a great dinner! We were once again blessed with beautiful weather on our last day. We chilled out and enjoyed it. In the evening we headed over to the Malpeque Community Hall for a Ceilidh show, pronounced kay-lee. A Ceilidh is a social event with Scottish and/or Irish folk music. It was enjoyable and the best part was that we won the 50/50 raffle! We walked away with an unexpected $96. 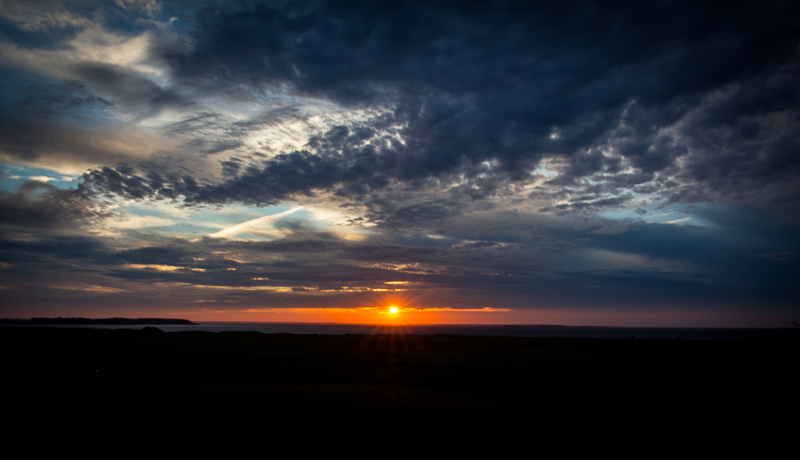 It was a good way to end a fabulous week on Prince Edward Island.